miscellaneous footpaths to reach a train station. When: July 15 – August 18, 2009 (35 days). 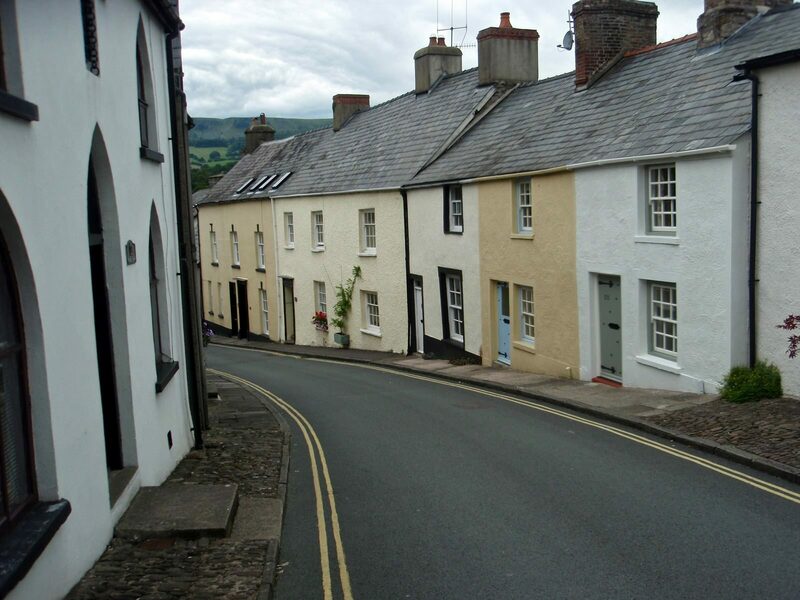 Highlights: fine hill walking, pastoral scenery, interesting coastline, quaint villages, historic and cultural sites. 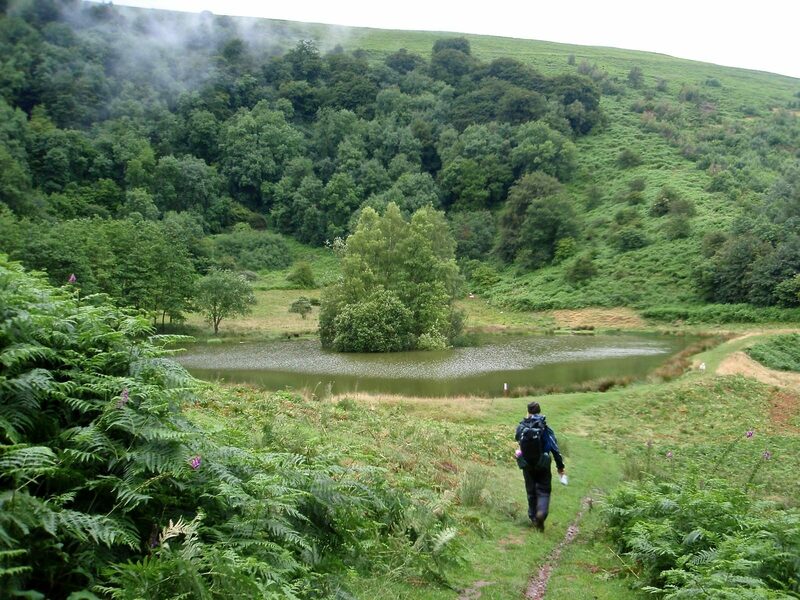 Having taken five previous long walks in the UK, we knew we loved the hiking there and wanted to return. 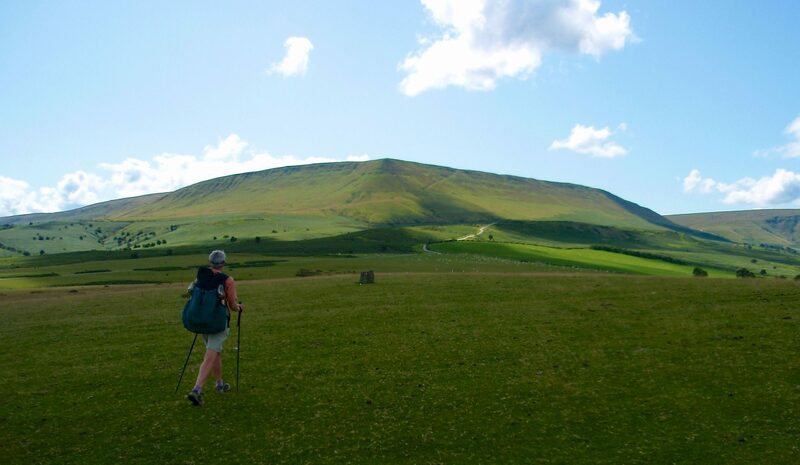 We choose the Cambrian Way as the core of the trip because it looked like an interesting and challenging hike in the Welsh Mountains, a region we had not previously visited. 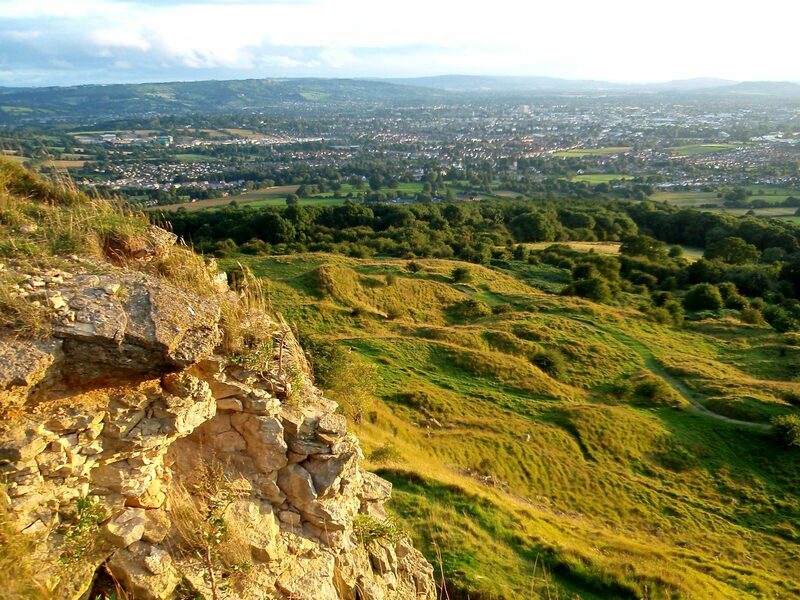 We like hikes of four to six-weeks duration, so we added the Offa’s Dyke Path. 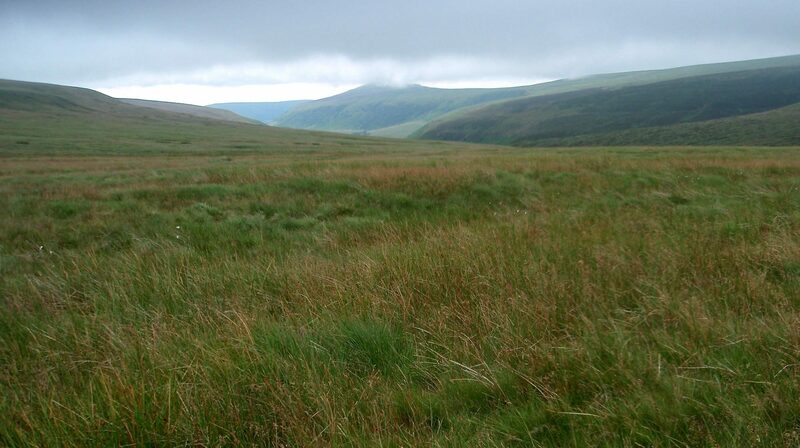 This combination would allow us to make a grand circuit through Wales and complete another British National Trail. Cambrian Way. A.J. 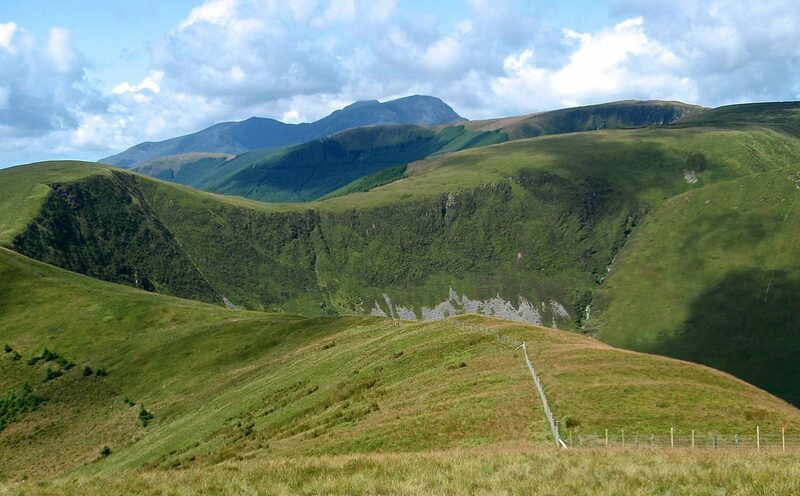 Drake’s guidebook Cambrian Way: The Mountain Connoisseurs Walk describes the route and has the list of checkpoints. It includes much extraneous information making it heavier than it needs to be, but it is none-the-less necessary to carry the book. A general account can be found on the wiki page. The Cambrian Way website has a lot of useful information and provides access to the gpx files for the track. Wales Coast Path. 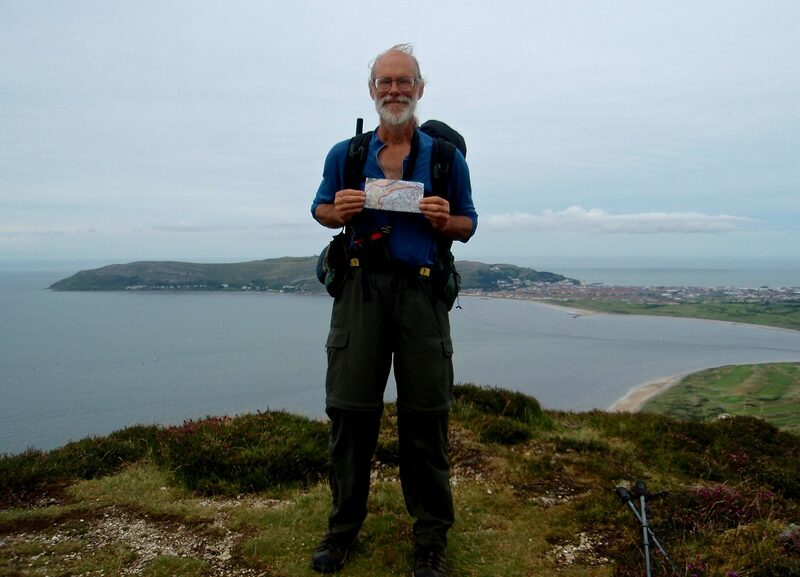 There is information about the entire 870 mile Wales Coast Path at the official website and at the wiki page. There are recently published guidebooks from Cicerone Press and Saint David’s Press. 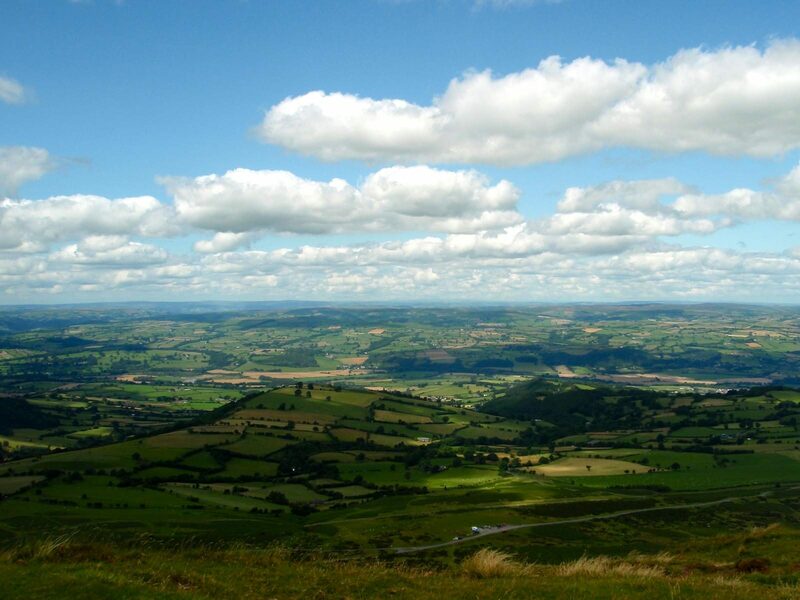 Offa’s Dyke National Trail. 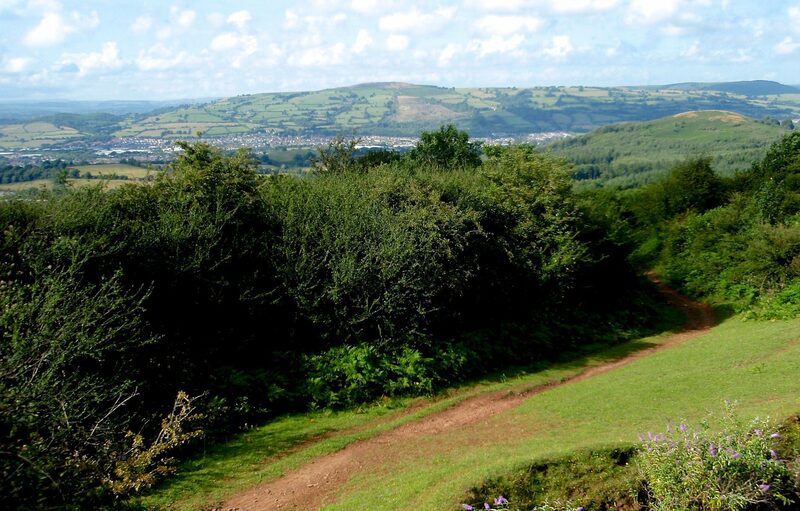 Offa’s Dyke Path National Trail Guide from Aurum Press is a fine guidebook with detailed information and all maps required to walk the route. 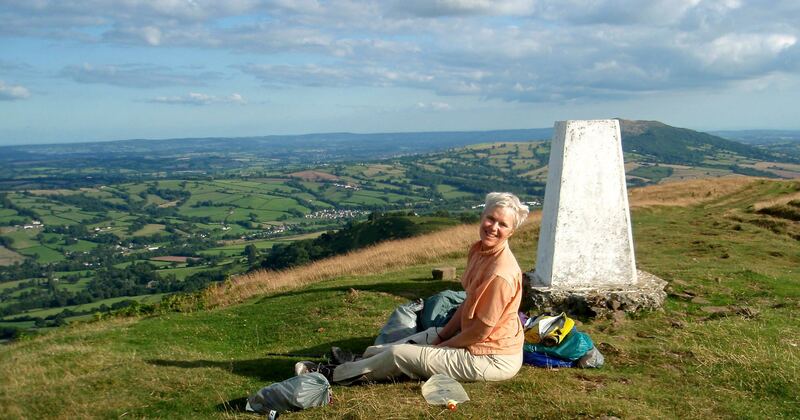 Additional information including the gpx file is available from the Offa’s Dyke Path website. There is a wiki page. River Avon Trail. 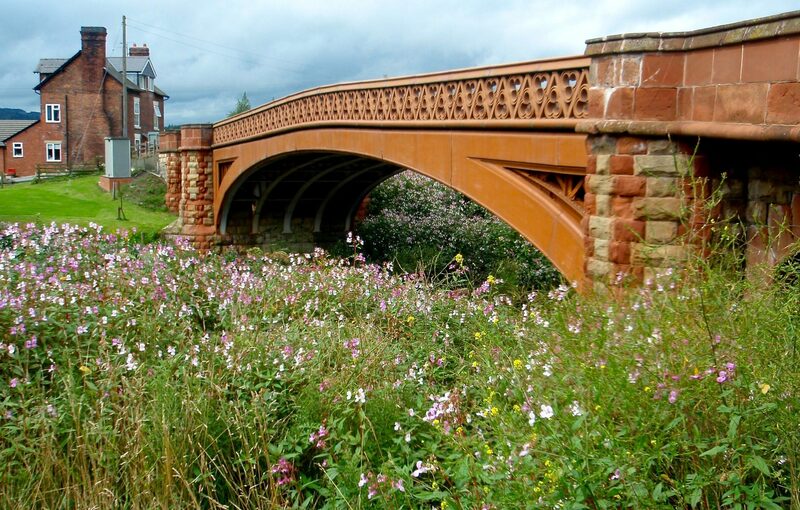 The River Avon Trail website has extensive information, and a gpx file is available from gps-routes.co.uk. 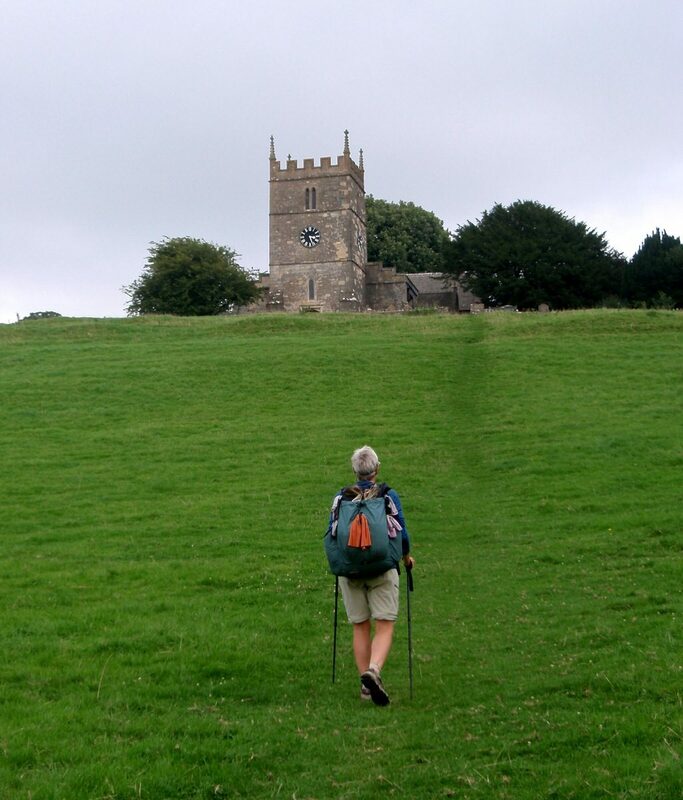 Cotswold Way National Trail. 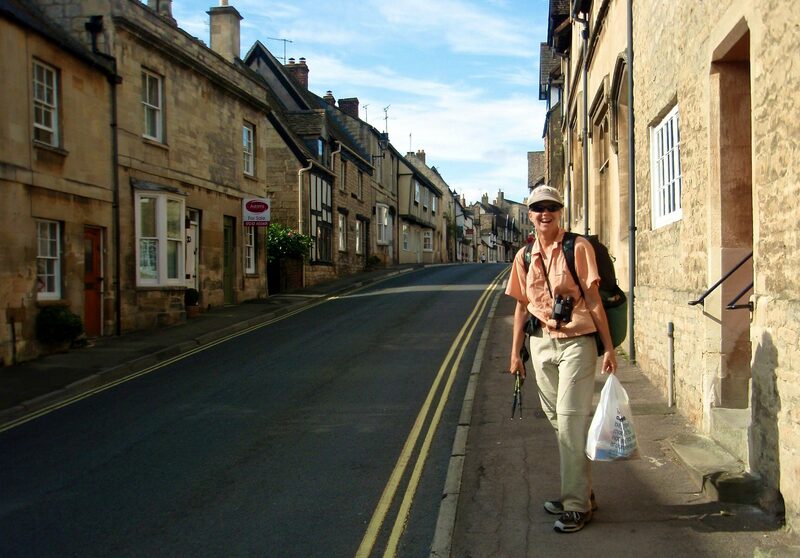 Cotswold Way: National Trail Guide from Aurum Press is a fine guidebook with detailed information and all maps required to walk the route. 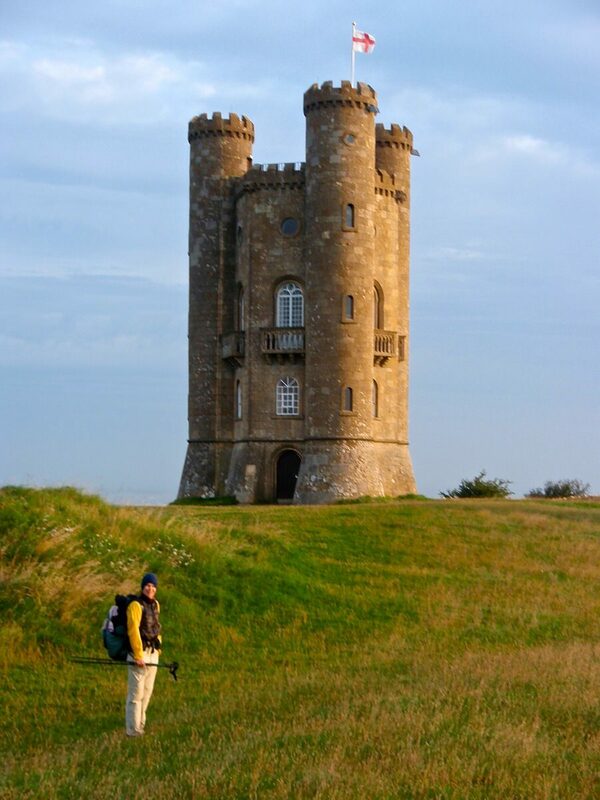 The Cotswold Way website provides access to gpx data. Ordnance Survey Maps: these government-issued maps are superb and come in a variety of formats and scales. The best for hiking are the orange Explorer series at a 1:25,000 scale. However, a long route requires many of these somewhat expensive maps and the large map sheets are very unwieldy in the field. 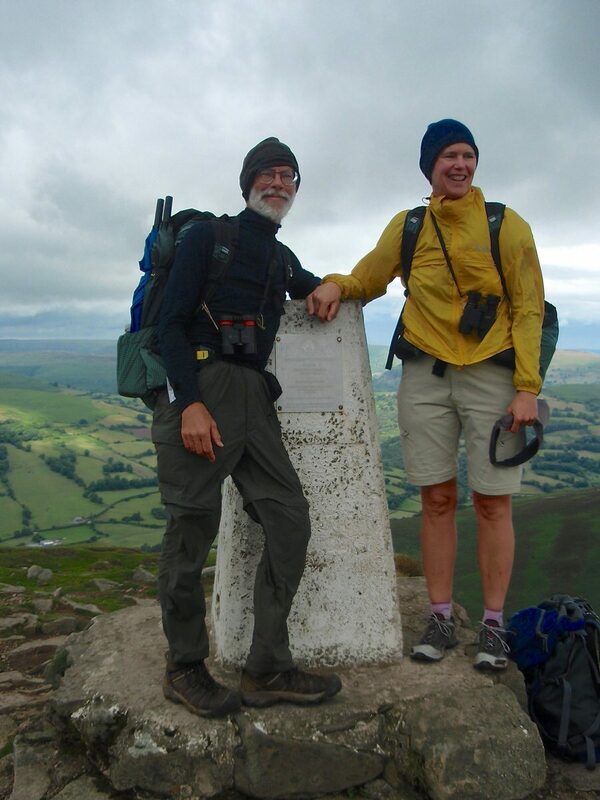 Many British hikers carry them in awkward oversized map cases they hang around their necks. Properly folding OS maps so that the appropriate section is visible through the clear case is an art form. To save money and avoid dealing with the oversized sheets, we usually make our own strip maps when the maps in the guidebook do not suffice. 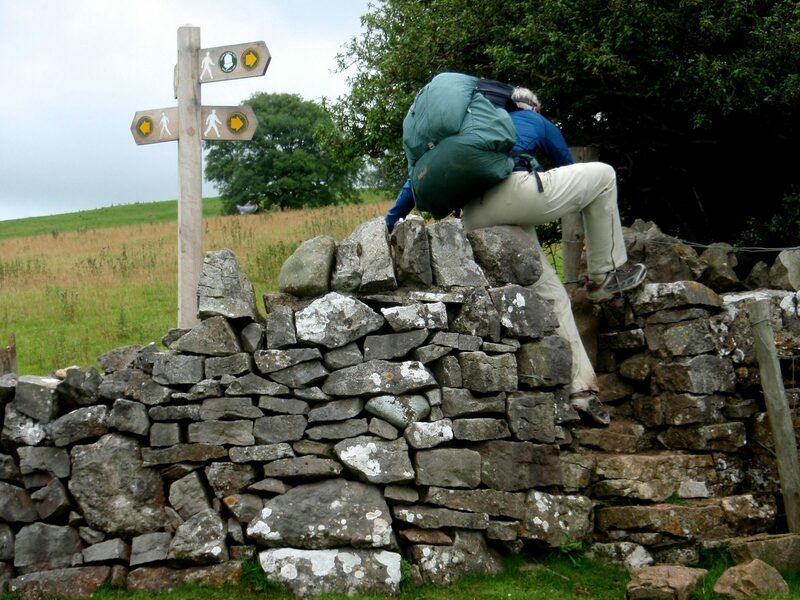 The Aurum Press National Trail Guides have appropriate OS strip maps and additional paper maps are not necessary. 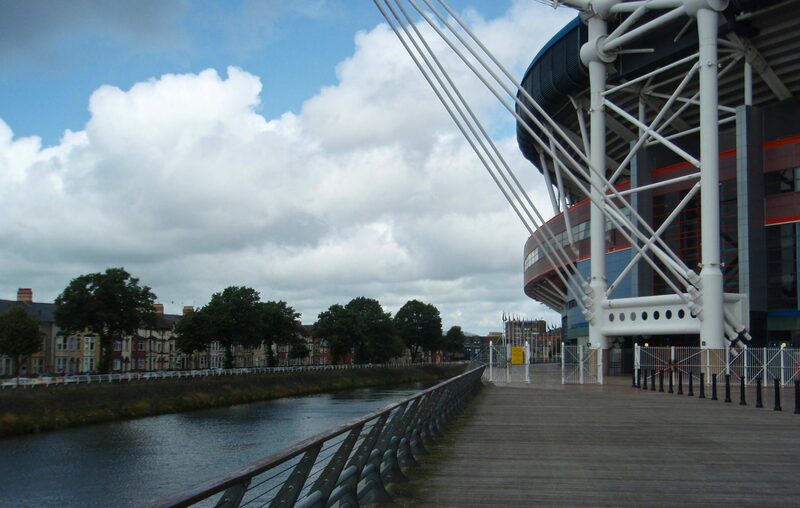 Our walk started around noon on July 15 from the bus terminal near the Cardiff Stadium, which is situated along the River Taff. 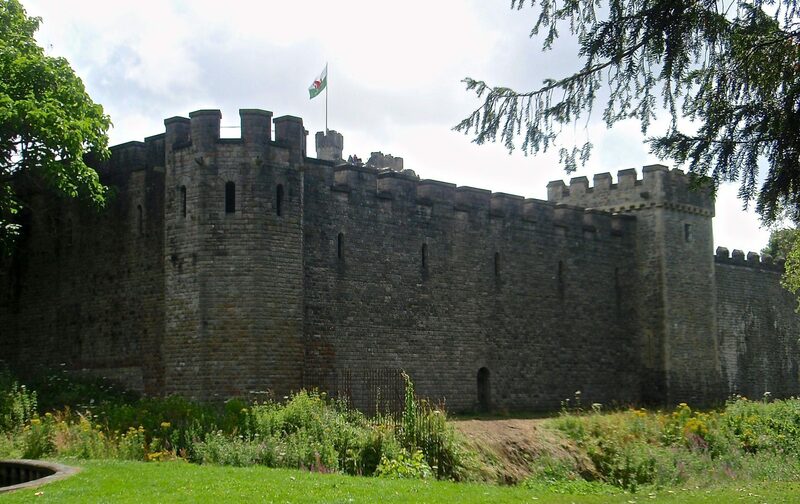 CP 1: Cardiff Castle The Cambrian Way is a described route 280 miles long which, as much as possible, follows ridgelines and summits as it wends its convoluted way north to Conwy. To complete the route, you must visit 41 checkpoints along the way. The Castle is the first CP. 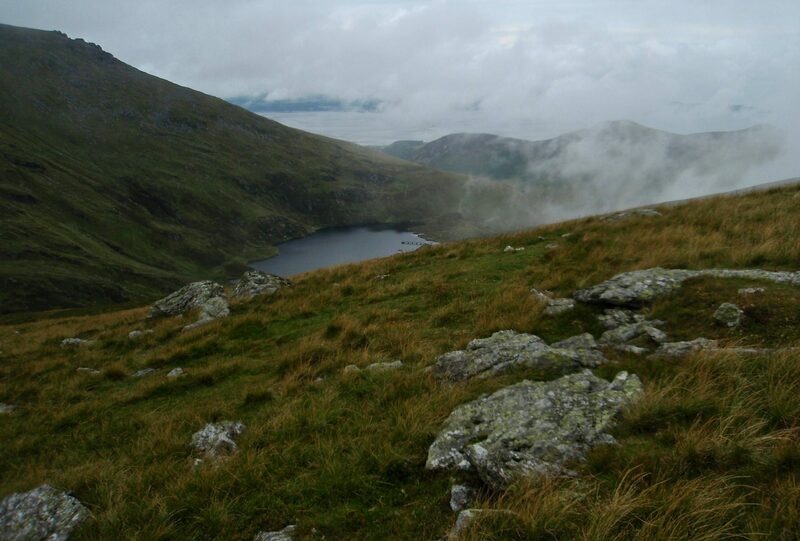 The route is very demanding as it is unwaymarked and frequently not on trail so decent navigation skills are required. 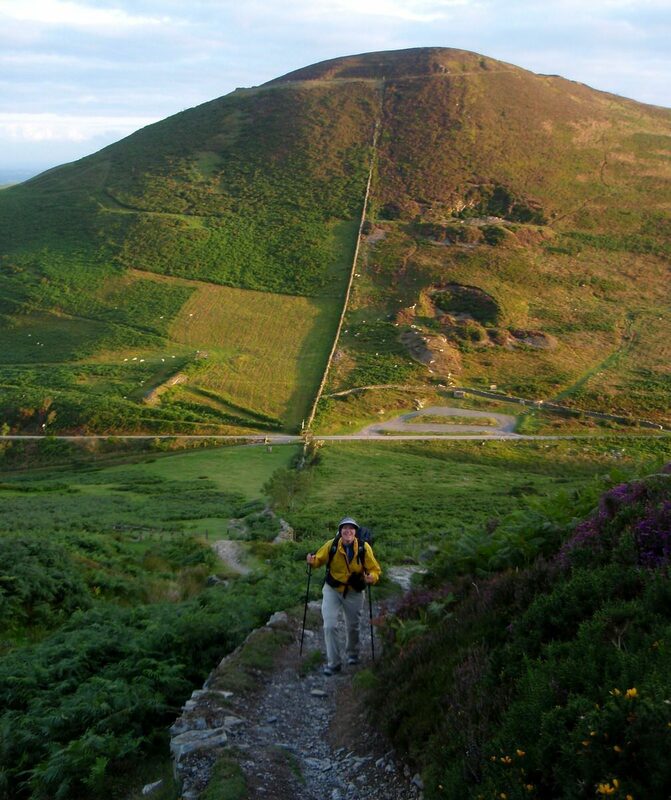 It gains something over 62,000 feet over its length and is reputed to be the most difficult described long distance path in Britain. 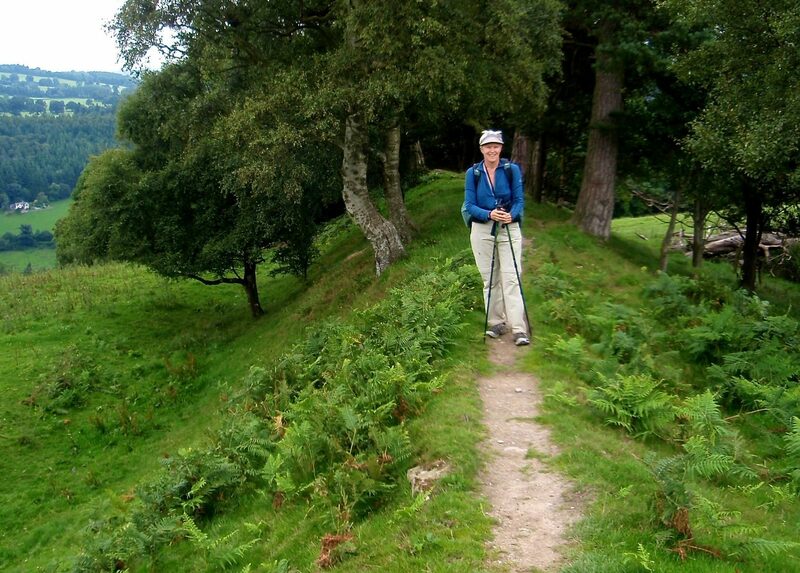 The British Isles are laced with tens of thousands of miles of public walking paths. Almost all these paths are traditional use paths crossing private lands. Public access is now codified in British law. Day #1. 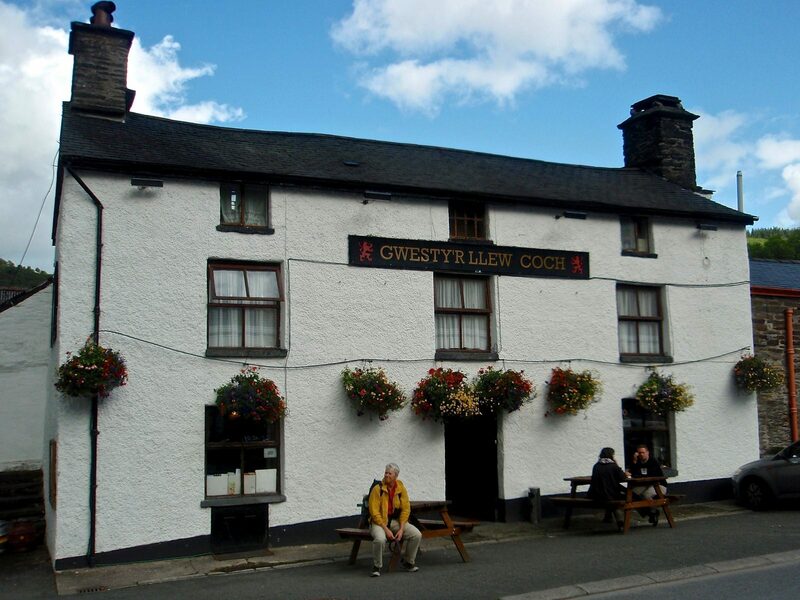 We had dinner at this pub. The first of endless numbers of sheep which cover the countyryside. 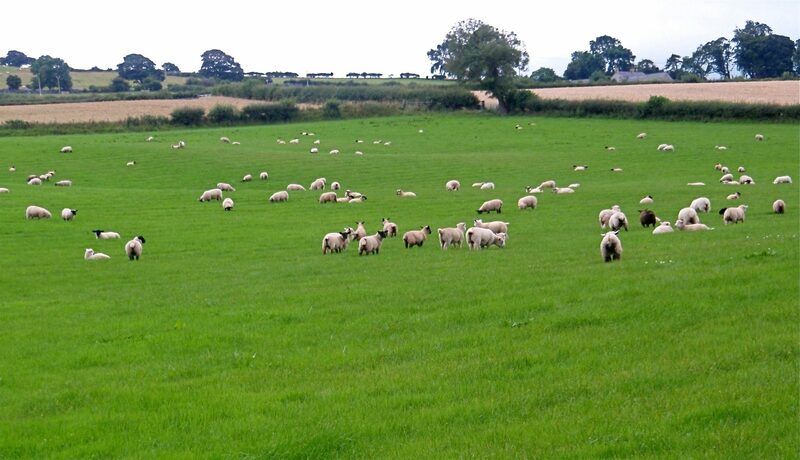 Sheep cropped fields are the predecessors to American lawns. 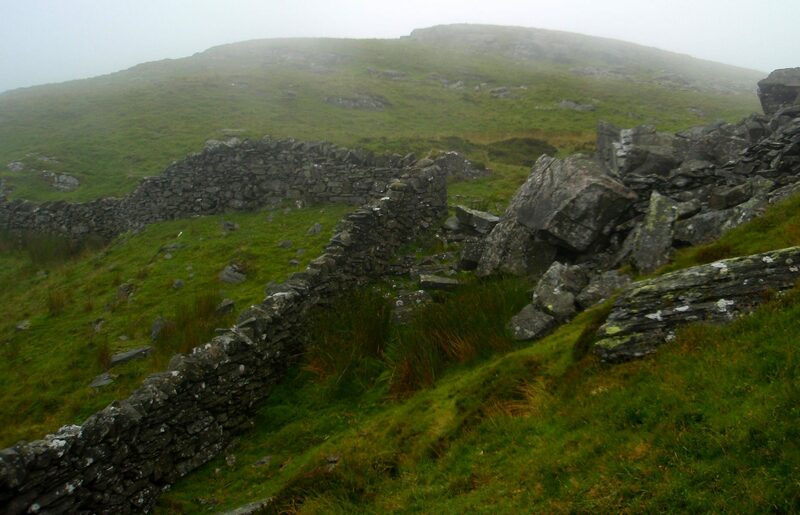 CP 3: Mynydd Machen. The post is a Trig Point. 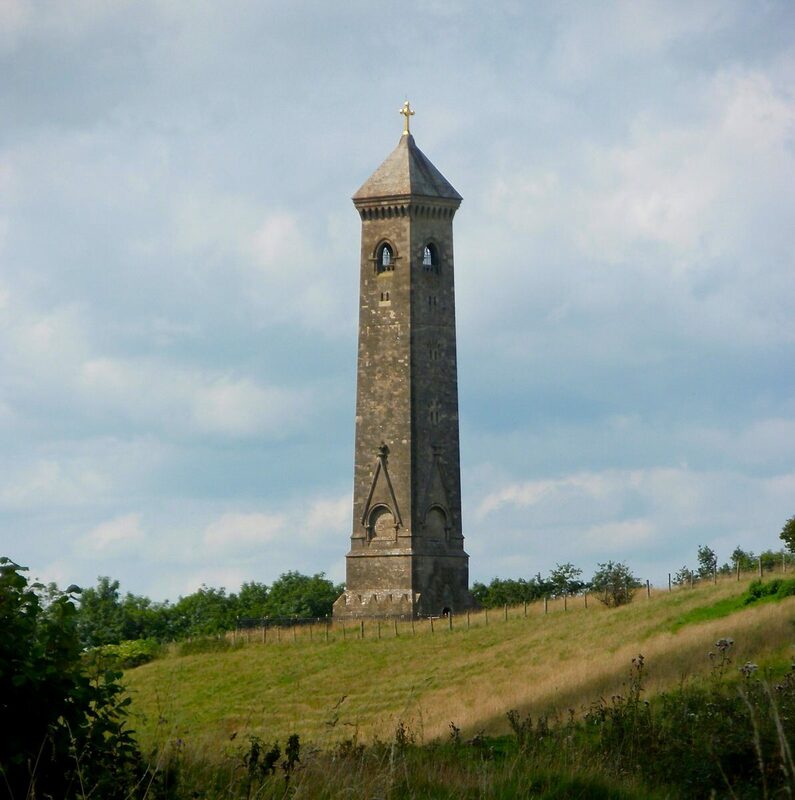 Triangulation pillars, or trig points, are a network of concrete pillars around the UK constructed as part of the great Ordnance Survey of Great Britain carried out in 1936. 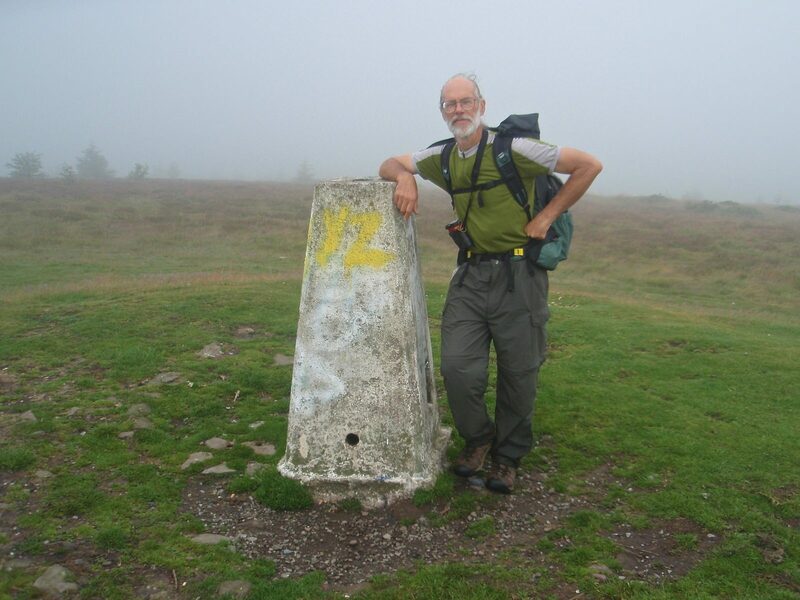 Trig points are placed on locally high points, and are within sight of other pillars. The pillar, although mostly concrete, has a metal identification plate on its side and a grooved metal circle on top for placing a tripod. 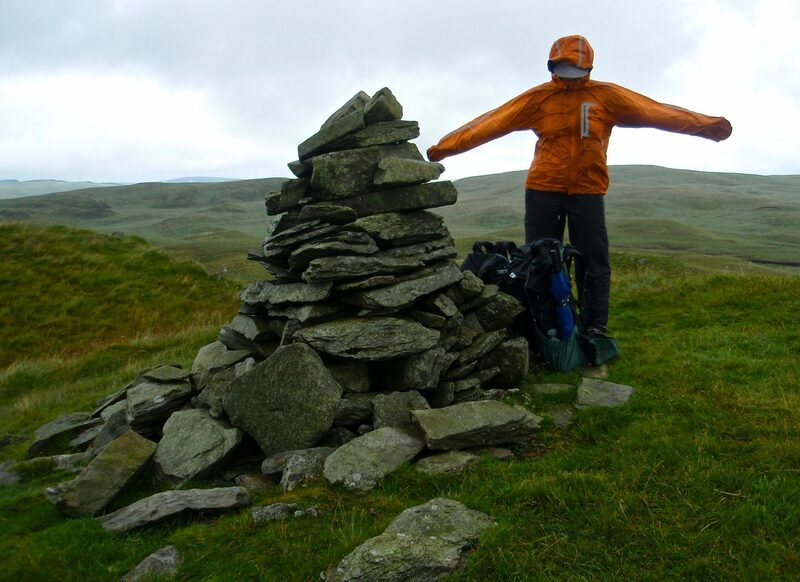 By placing a theodolite on top and sighting other trig points, the whole country was mapped. We will pass many of these objects during our walk. CP 4: Twmbarlwm hill fort We passed by many of these pre-histroric earthworks which were contructed as defensive points thousands of years ago. Common lands. 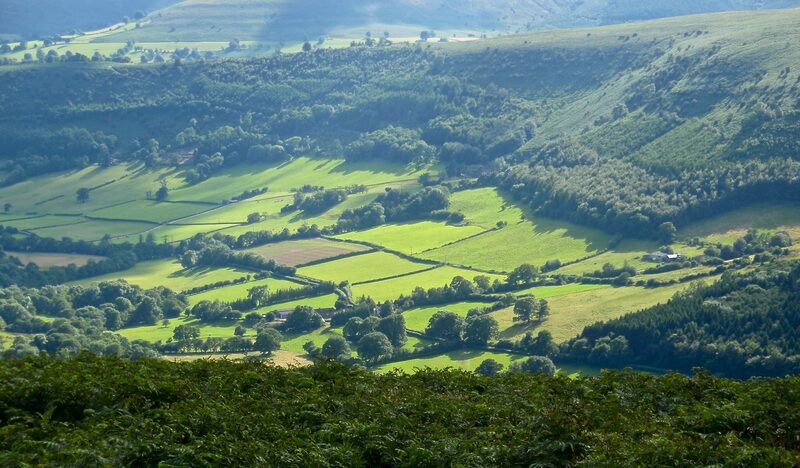 These are fields owned by a community and grazed collectively by sheep or cattle owned by various local farmers. Many commons date back several thousand years. 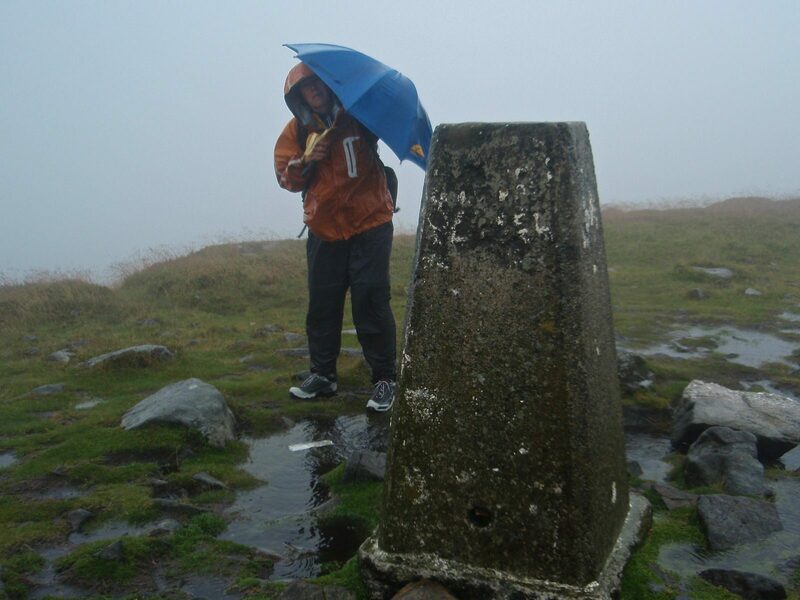 CP 5: Blorenge Brisk winds and pouring rain meant we didn’t get a view from this summit. 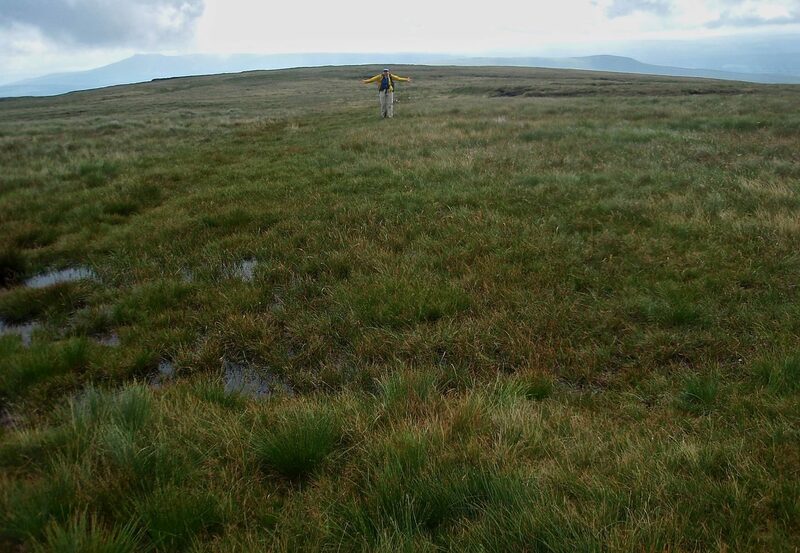 The entire top of the mountain was a gigantic bog. Coming down off of Blorange, we dropped under the clouds and got out of the wind. Here the Way drops under a canal though the tunnel. 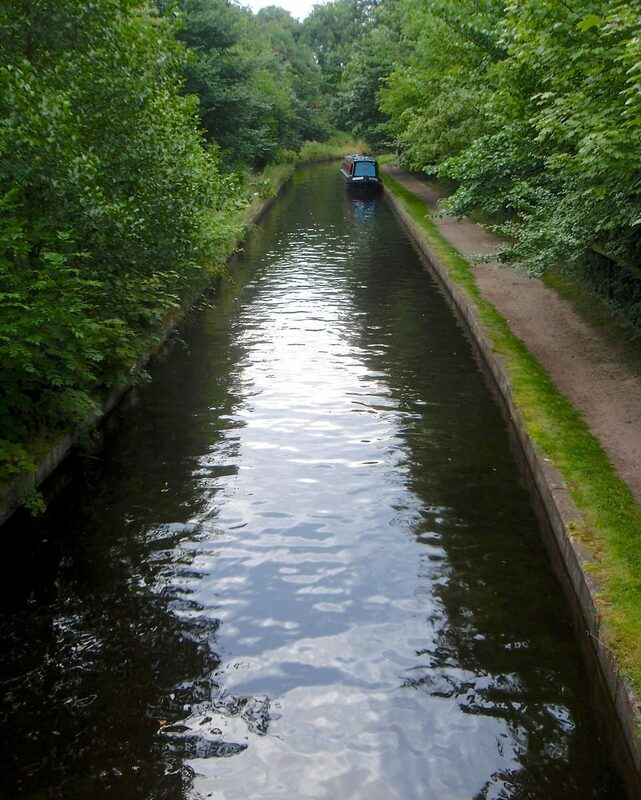 We crossed under, over, and walked along numerous canals, which were contructed in the eighteenth century and were the primary means of freight transport until the railways were built. 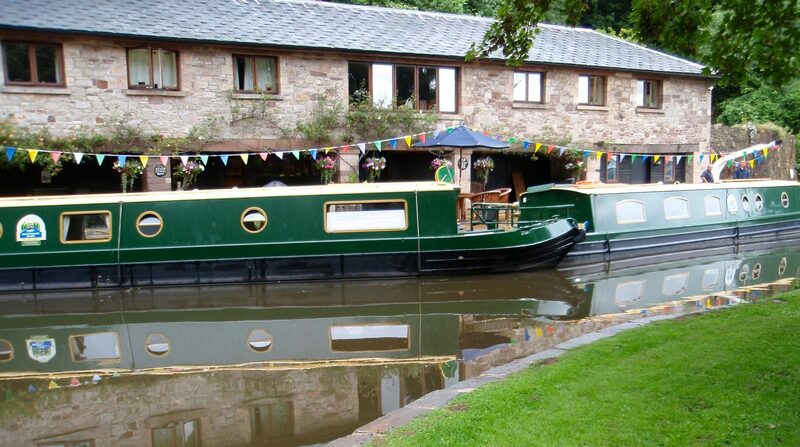 They are now primarily used for pleasure cruising in canal boats. 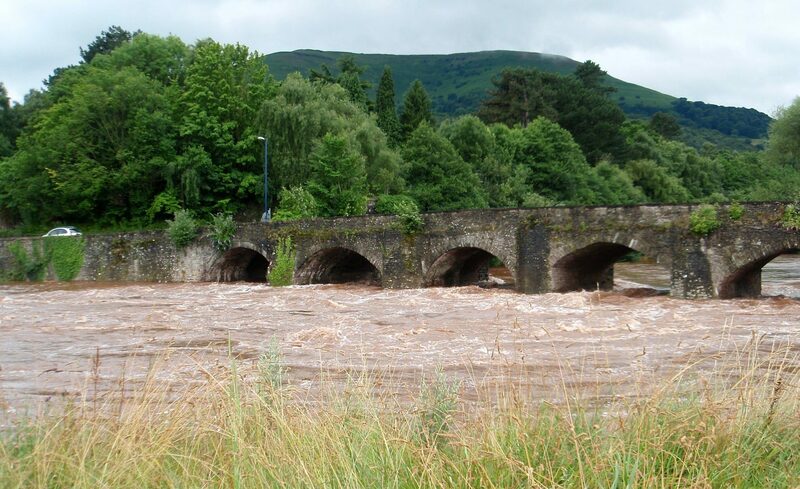 The River Usk in flood at Abergavenny. 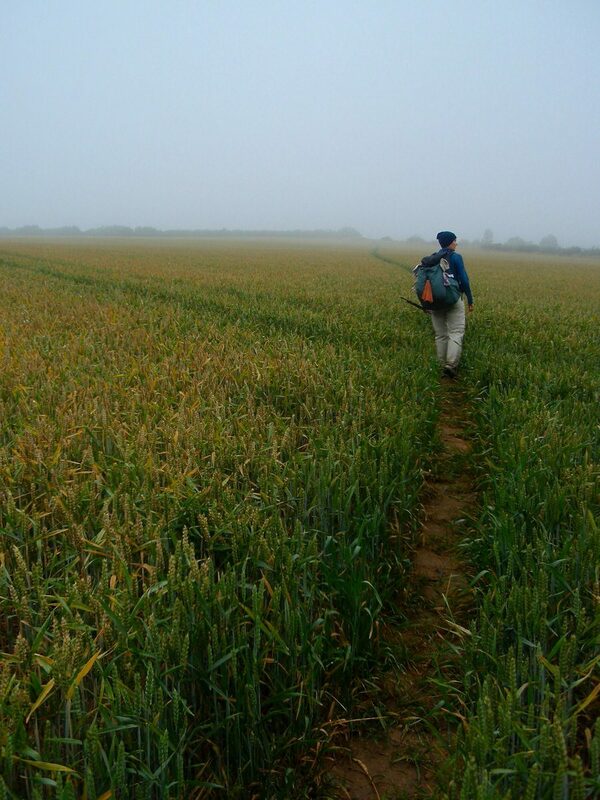 Near CP 6: approaching Sugarloaf. 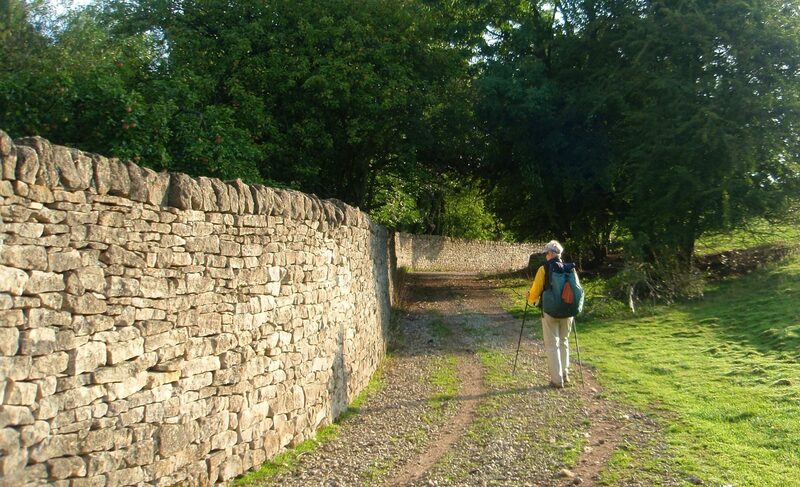 Miles of old dry stone wall laced the countryside and were quite beautiful. Camp #3. 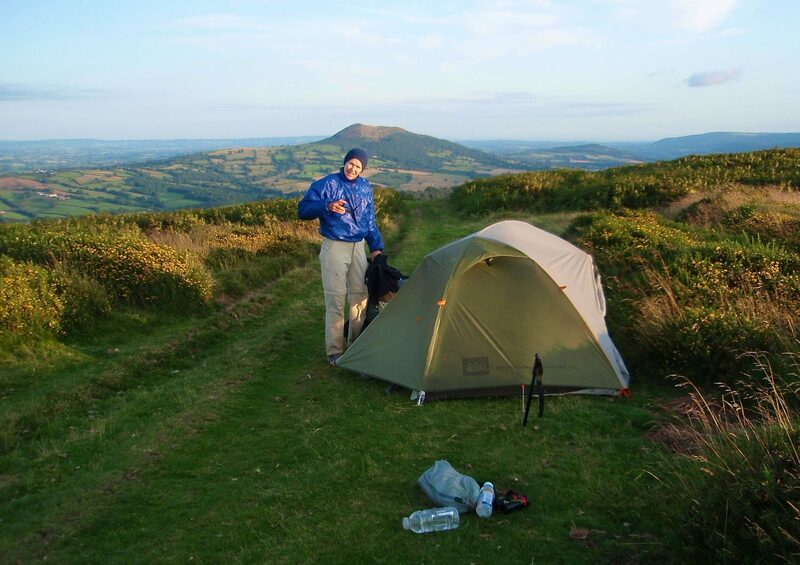 The Cambrian Way dropped off of the ridge and we found a fine campsite on the way down. 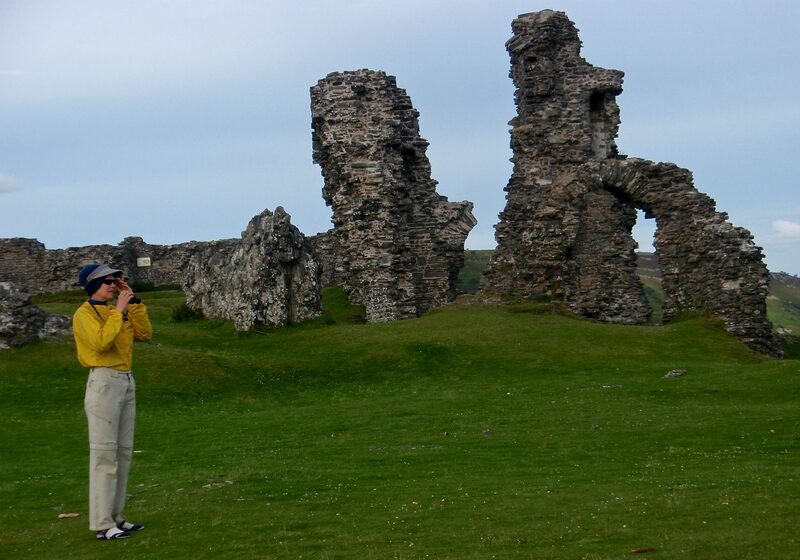 Old ruins, primarily castles and abbeys, were common sights. Looking back on Crickhowell from the campsite. 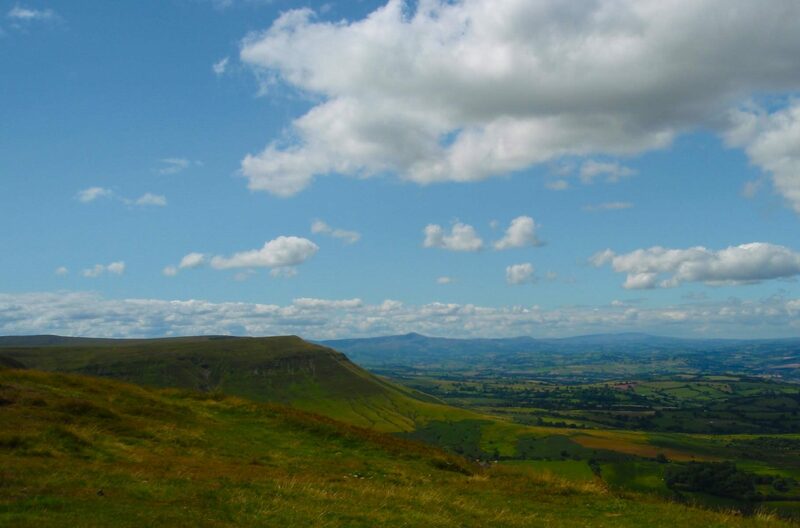 The Black Mountains we had just walked through are in the distance. Camp #4 on the tramway. 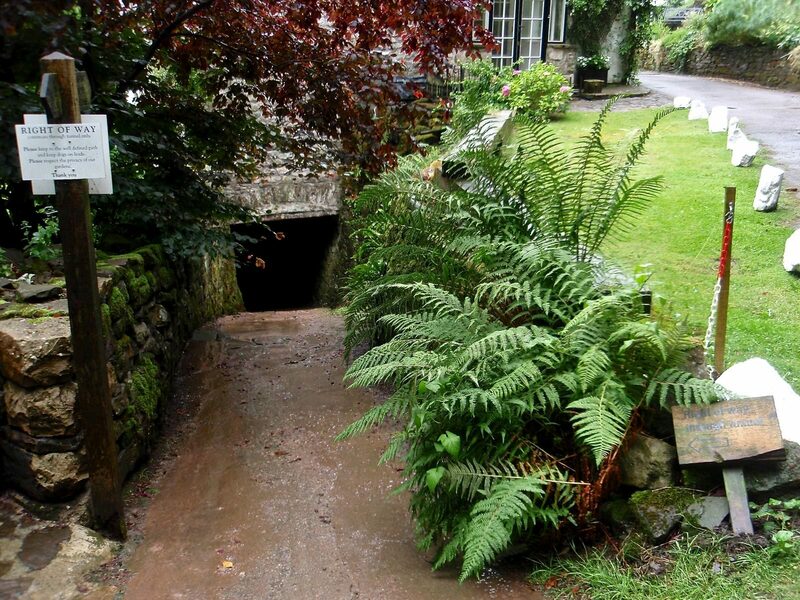 Chartist Cave, a landmark you must navigate to. Nice shelter from the rain and wind. 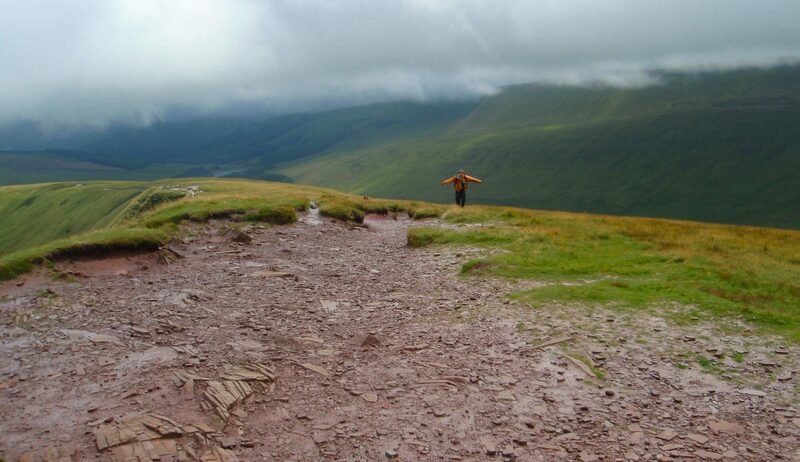 Brecon Beacons during a short break in the cloud. 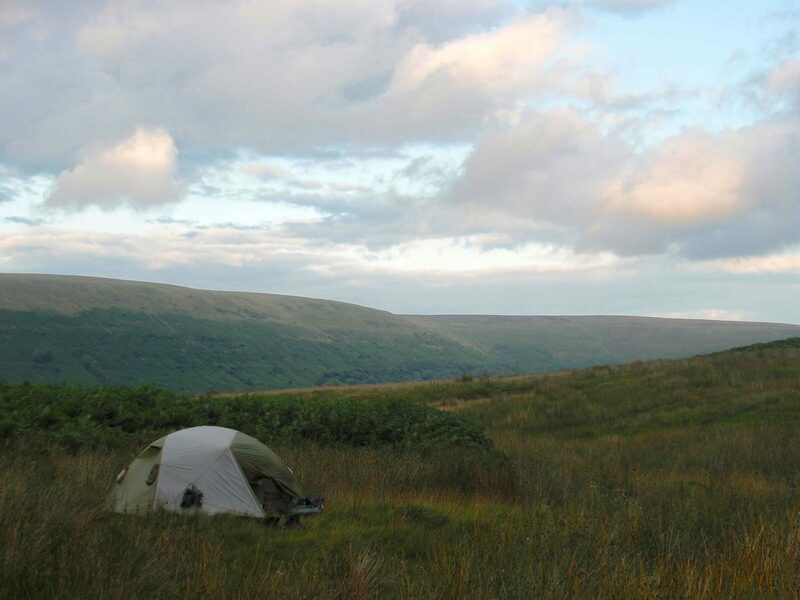 Camp #5 in the Brecons, near Storey Arms (former pub/inn converted to an environmental education center). Boggy walking. Dry feet are not possible. We are heading toward the peaks on the horizon. 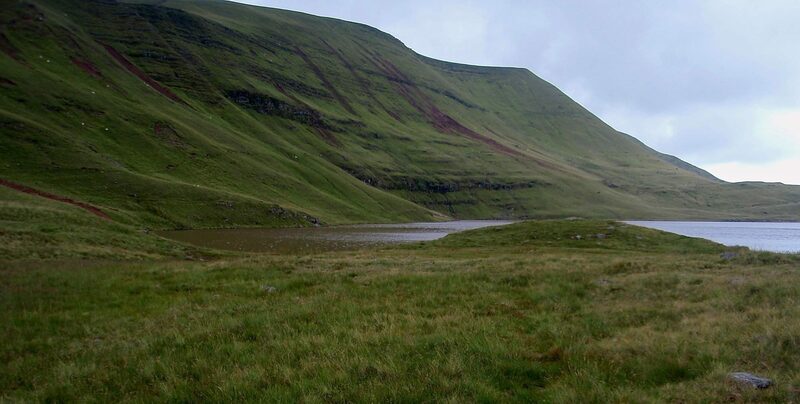 Near CP 14: towards Bannau Brycheiniog; the lake is Llyn Y Fan Fawr. 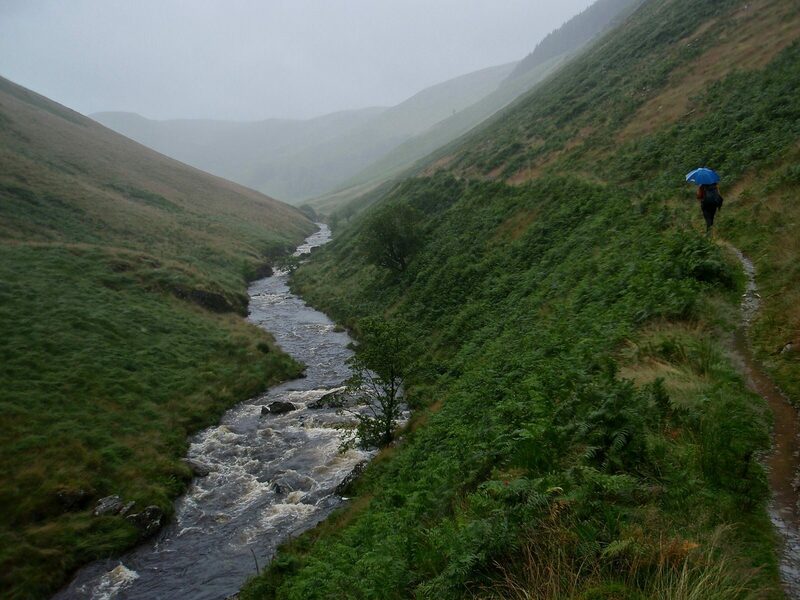 Walking up the beautiful River Doethie valley. Night #7. 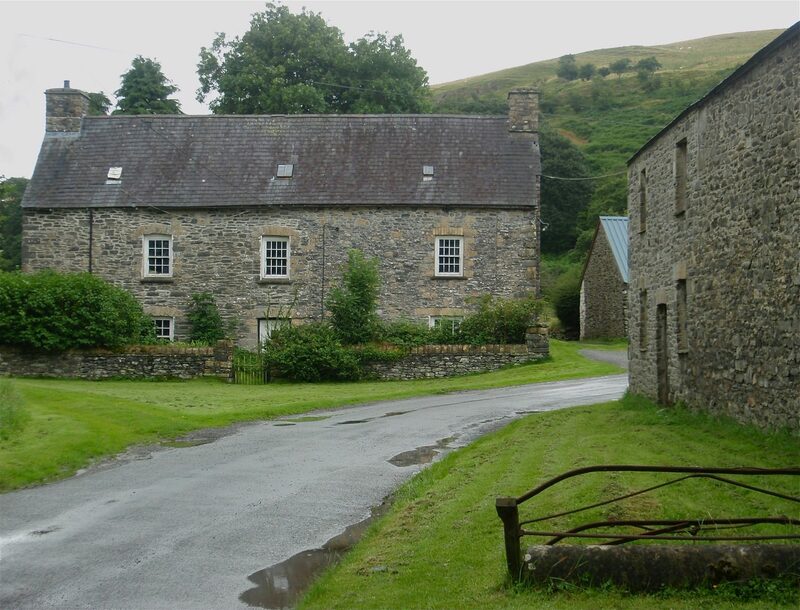 We stayed at the Tyncornel hostel after a very wet day. We were the only customers that night. 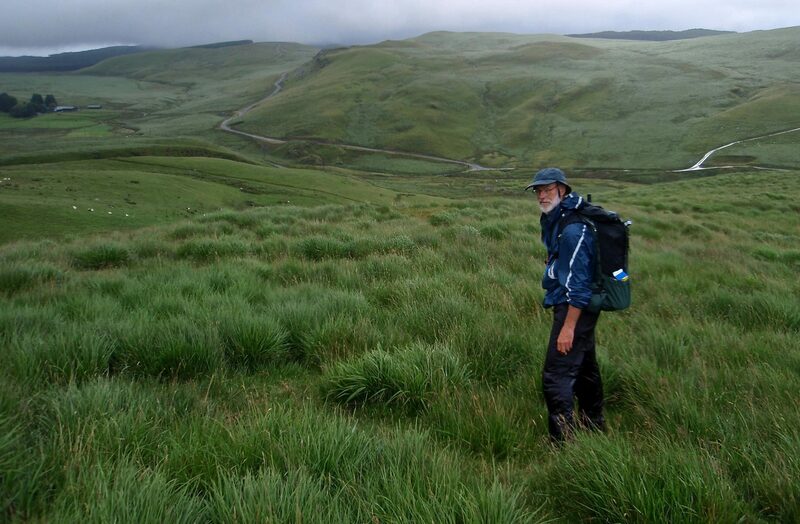 Walking through tussock grasses the next morning. 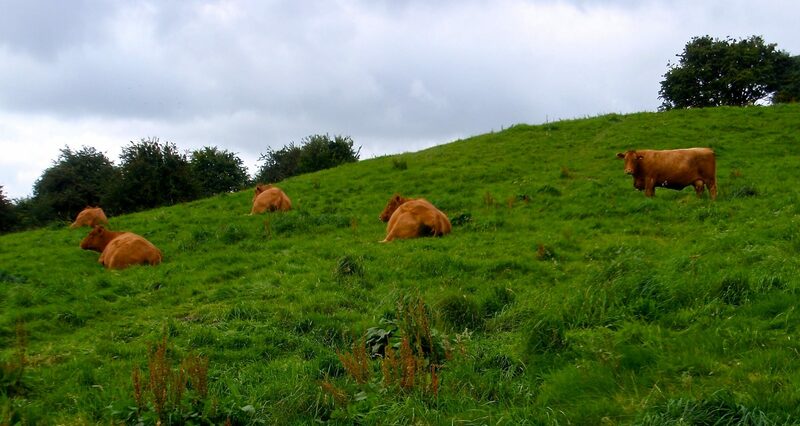 This is difficult walking as the ground is very uneven and hidden beneath the grasses. 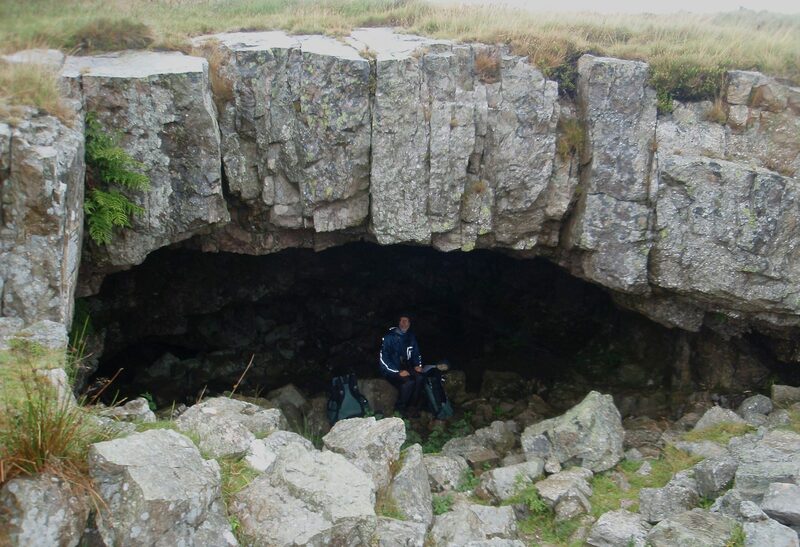 CP 16: Garn Gron and a troll…. 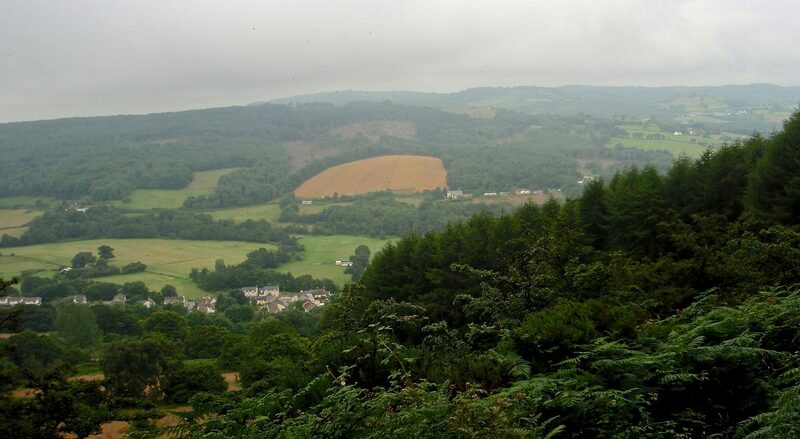 Strata Florida, one of the stranger names for a place we passed through. 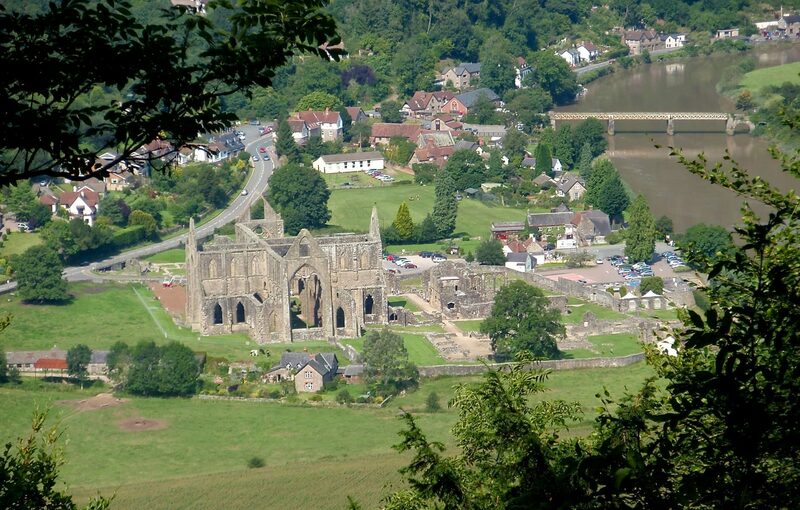 These buildings are associated with the adjacent 12th century Cistercian Abbey ruin. Day #8. 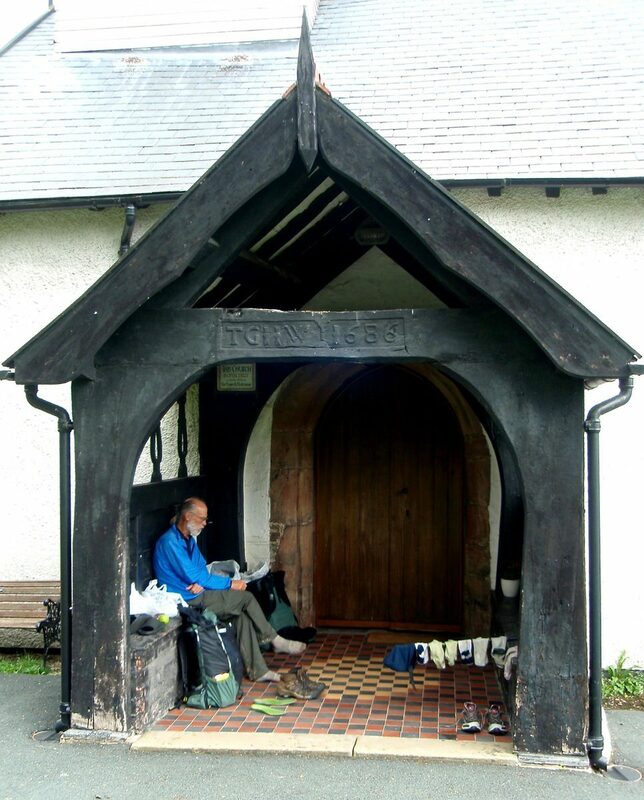 We ate another rainy lunch under this barely functional shelter, a Strata Florida churchyard entrance gate. 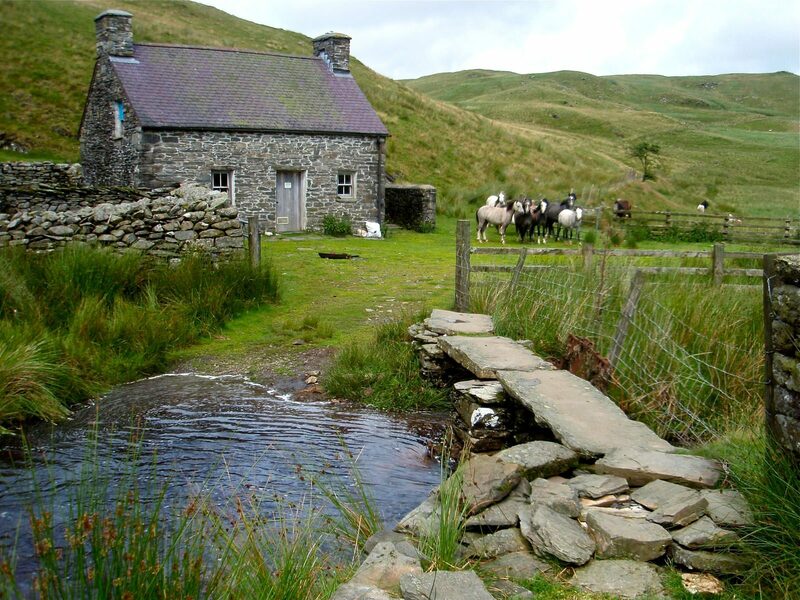 A bothy, or free public shelter in the open commons. 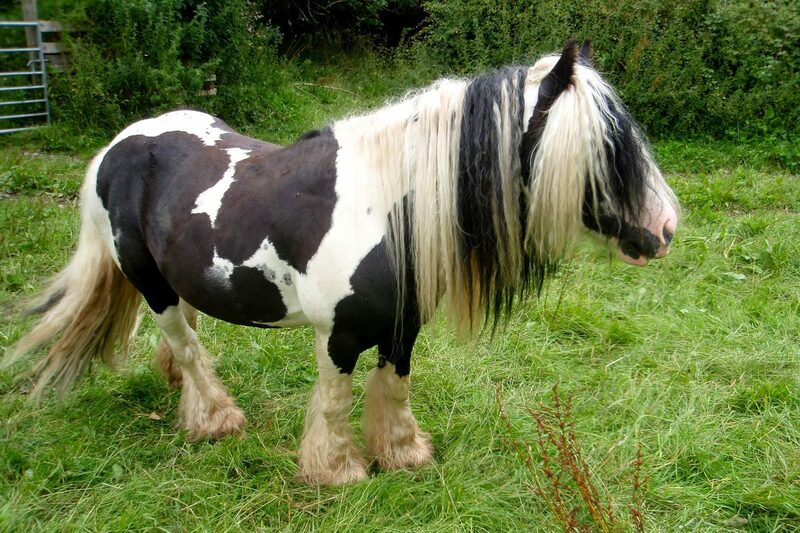 There are many of these in Scotland, but very few in Wales. CP 17: Domen Milwyn Wind and rain again, which made hanging around summits not very enticing. 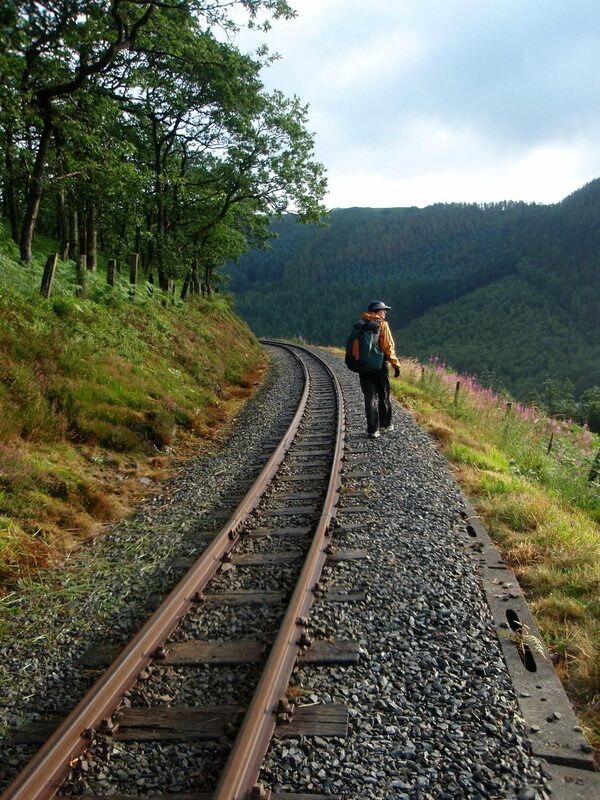 Walking along a narrow gauge railway the next morning. When the sun was out and the clouds gone, the scenery was often lovely. 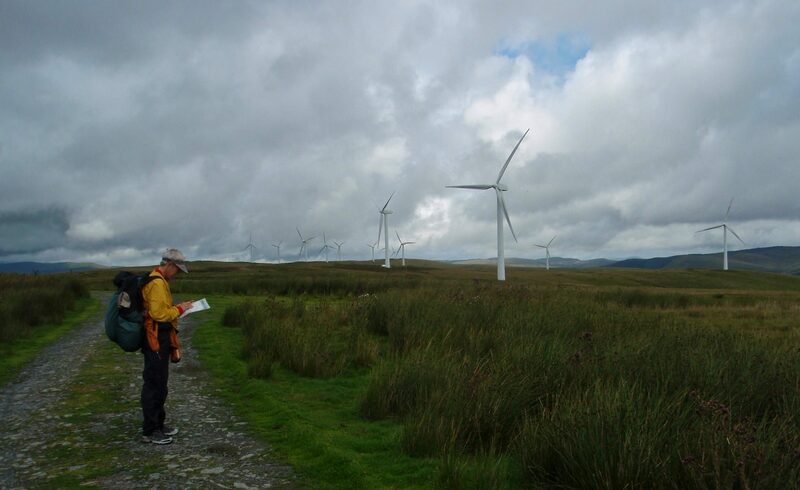 Many of the ridgetops in Wales have wind turbines installed on them. This is controversial of course. 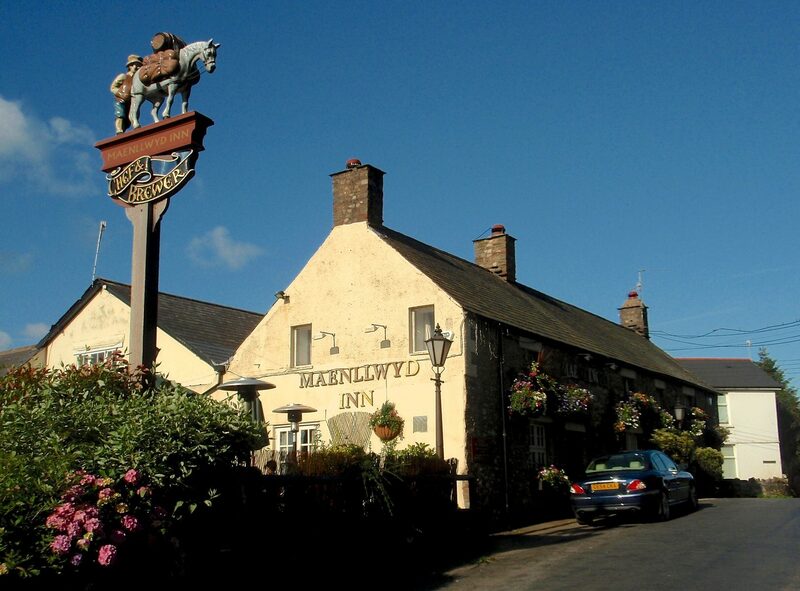 CP 21: Red Lion Pub in Dinas Mawddwy We ate dinner here and swapped stories with the very friendly clientele. Into the mountains south of Cader Idris. 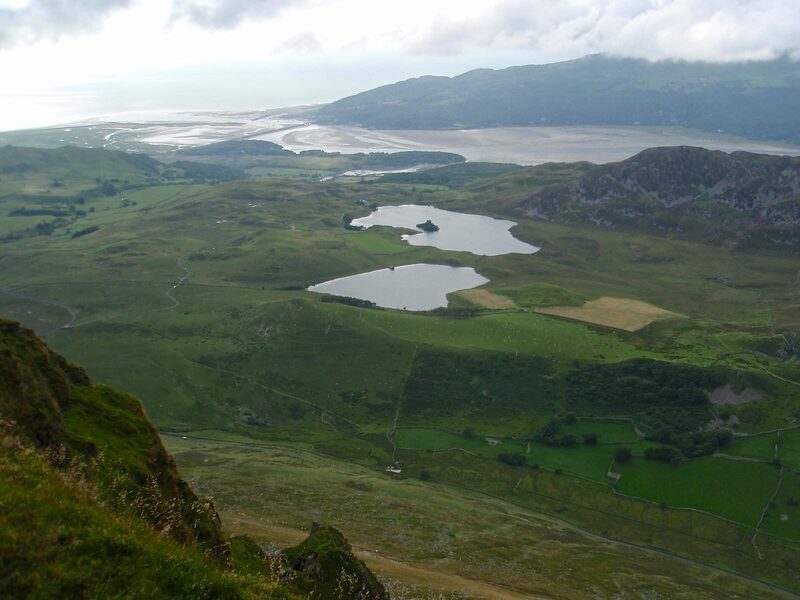 Looking down on the coast at Barmouth from Cader Idris. 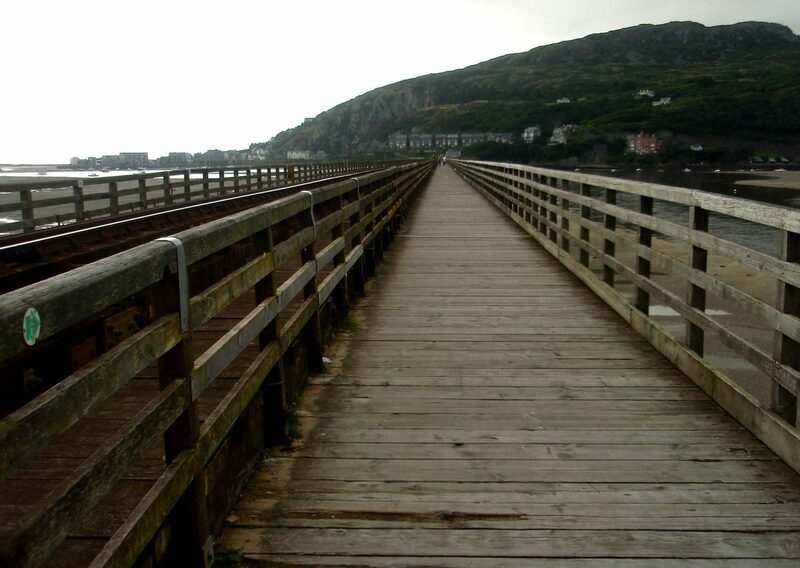 CP 24: Barmouth Bridge It was late when Jim crossed the bridge and the toll taker had gone home. Into the Rhinogs. Very windy and rainy. Most of time it was heavy cloud and mist with almost zero visibility. 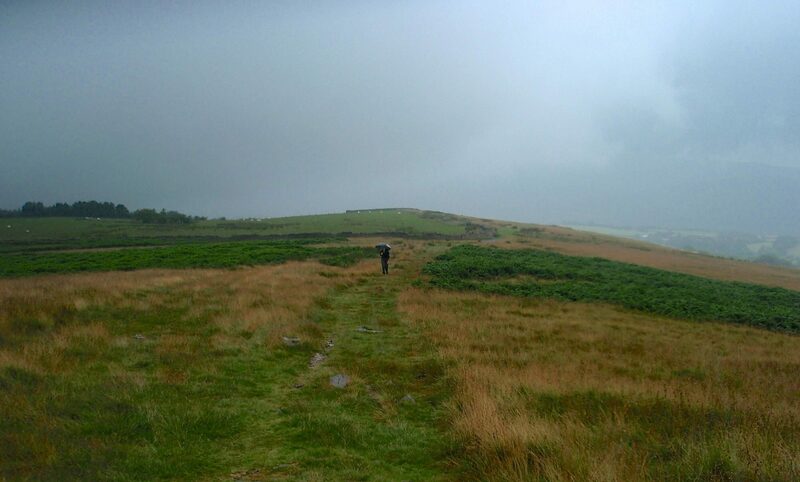 Very difficult walking on wet and slippery terrain. The winds were gusting at speeds which made walking difficult. Many styles were like this due to the rain. That July turned out to be the wettest year on record for the last one hundred years. Looking down into Cwn Bychan, the distant lake. Jim would camp there. 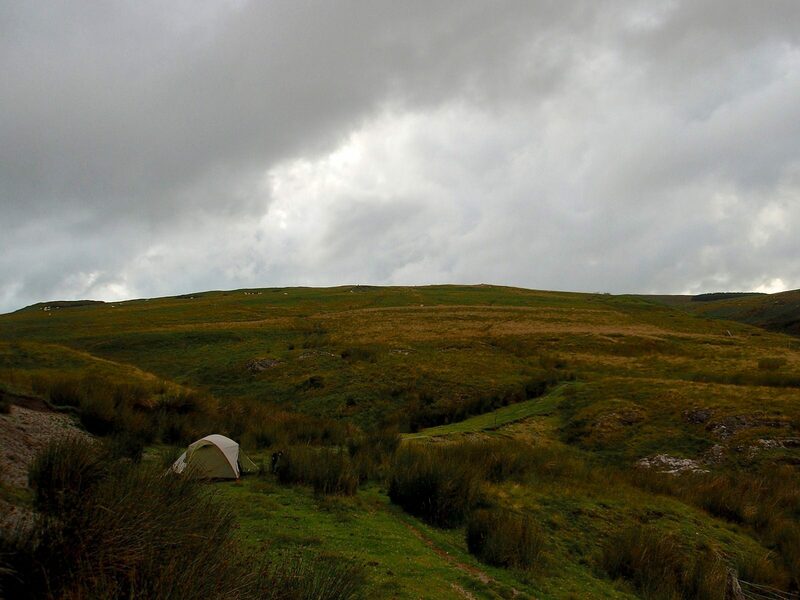 Camp #12, Cwm Bychan, three hours later. The next day wasn’t any better. Most of the time, the visiblity was zero, but occasionally the wind blew openings in the clouds. Way finding was complicated by the large numbers of sheep paths which made following the unmarked and not very utilized trail difficult. 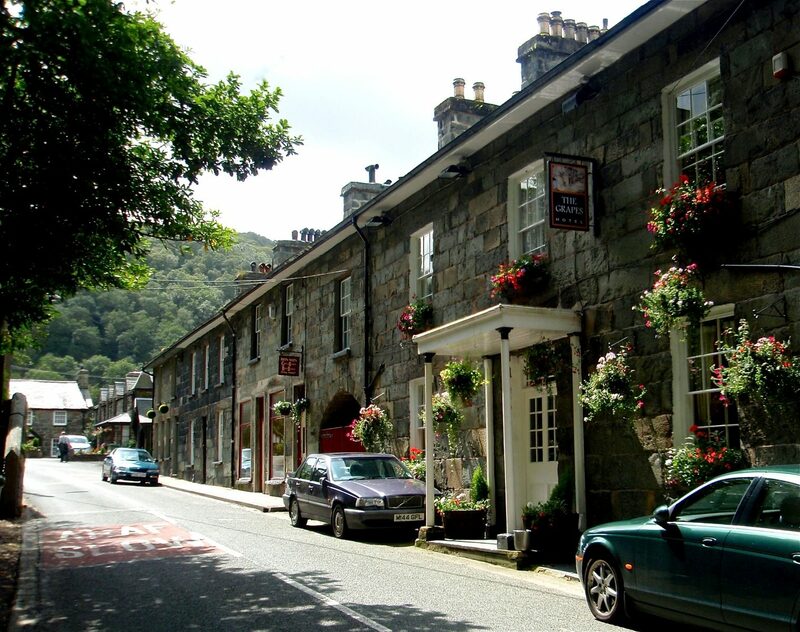 Jim had a great lunch at this hotel in Maentwrog. 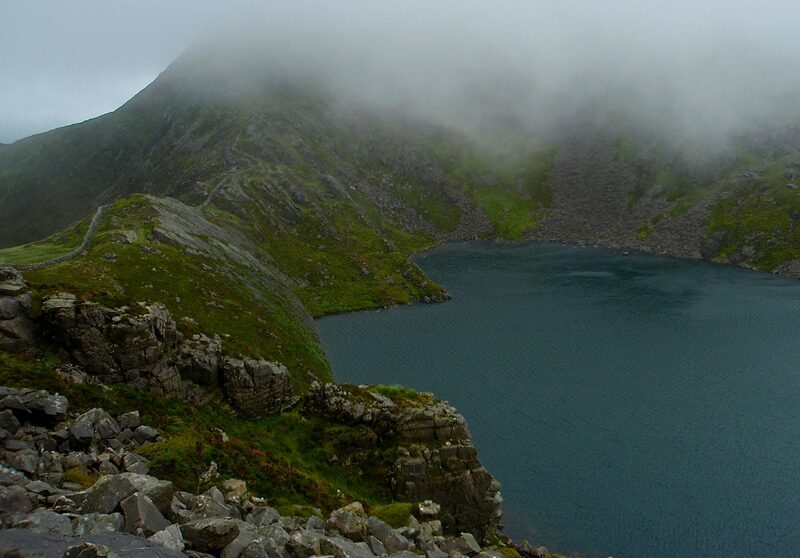 Llyn Dinas, near the base of Snowdon. 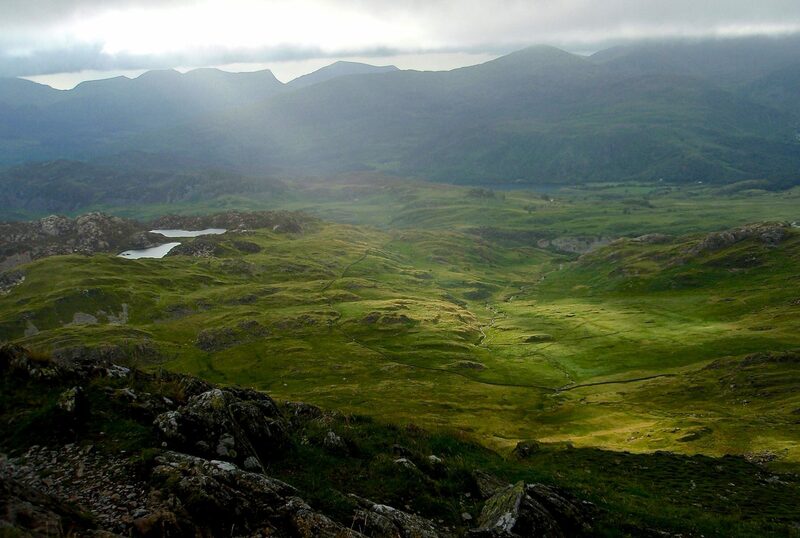 At 3560 feet, Snowdon is the highest point in Britain. 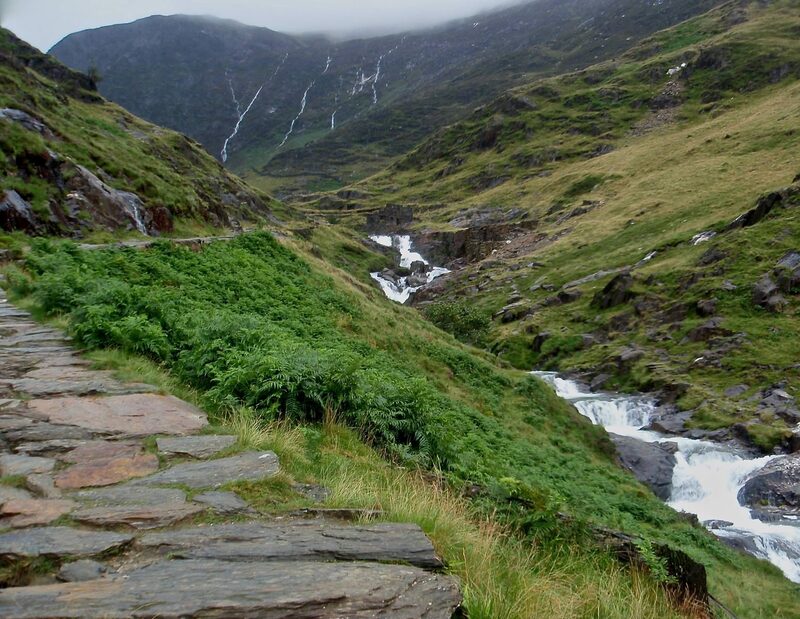 The lower reaches of Snowdon. The top is in cloud. 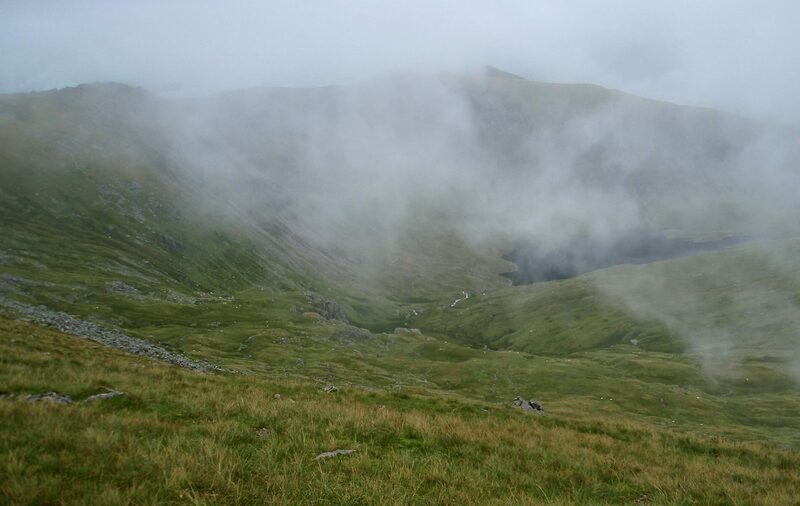 The next day and tops were still in cloud, but the wind and rain had fortunately stopped completely. 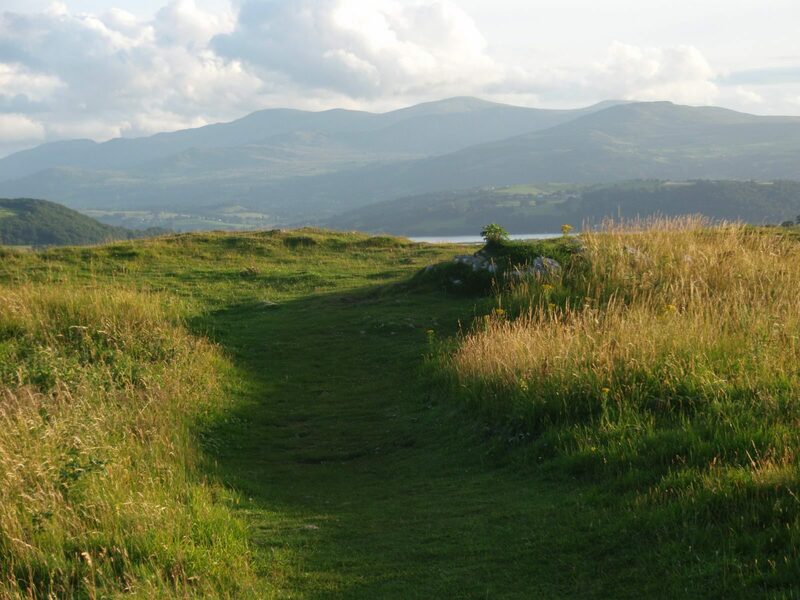 A long ridge walk followed the tops north across the Carneddau range into Conwy. Lots of compass work up here. The north coast of Wales visible at last. Looking back at the Carneddau Mountains. 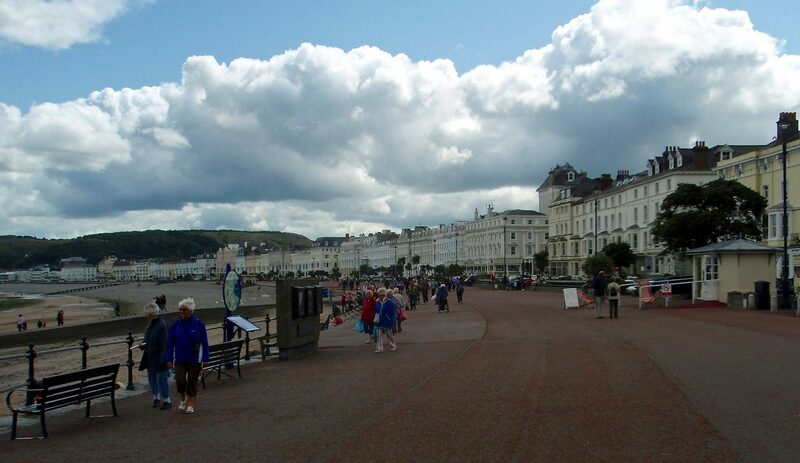 The old Victorian era resort town of LLandudno (pronounced clan-did-now). It was full of retirees. Looking east along the coast. 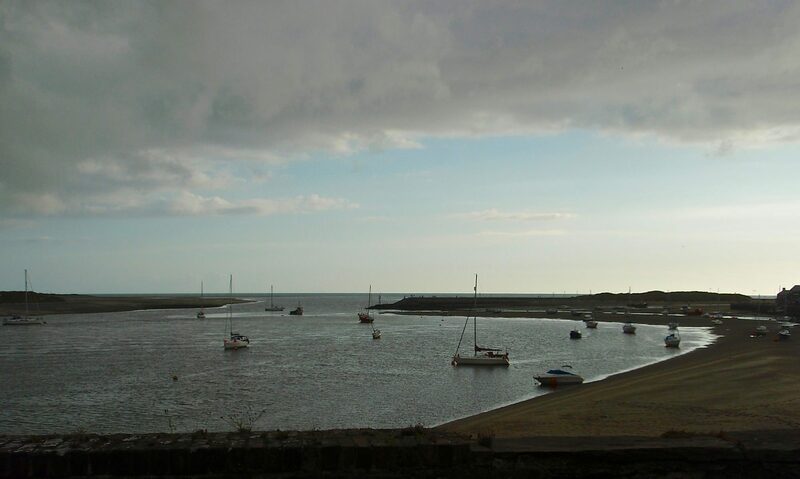 The weather was improving and we had our last significant rain of the rest of the trip early the morning we left Conwy. The route we took mostly stay along the edge of the beach, often on paved paths and promenades. 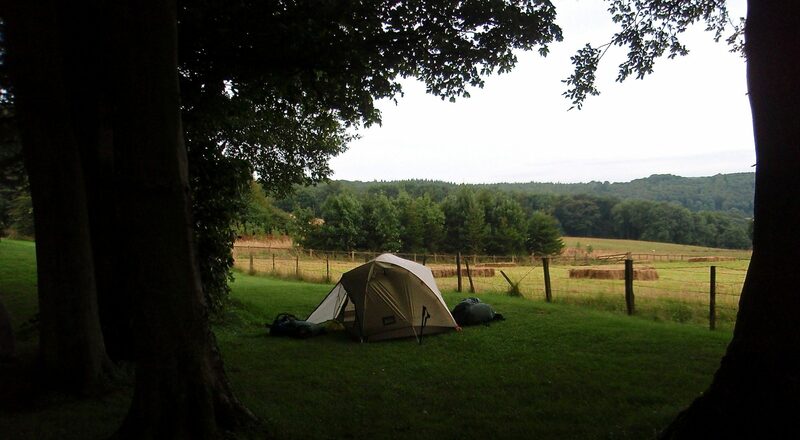 Camp #16, a fine site in a park above Rhos-on-Sea. 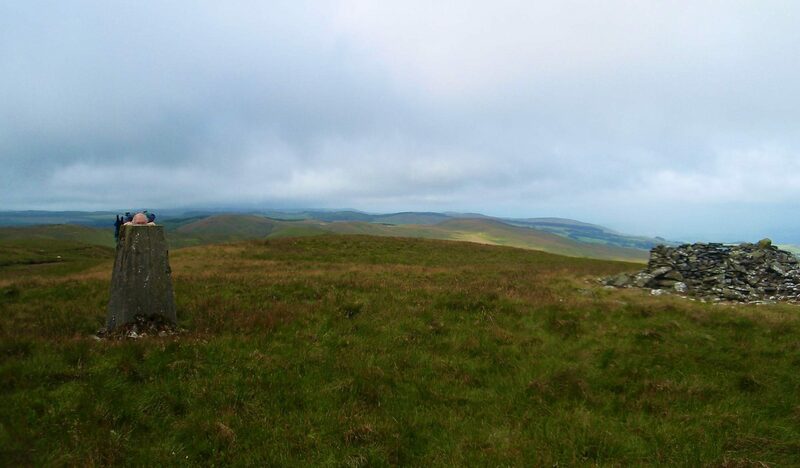 This was an another prehistoric hill fort with its obligatory trig point. 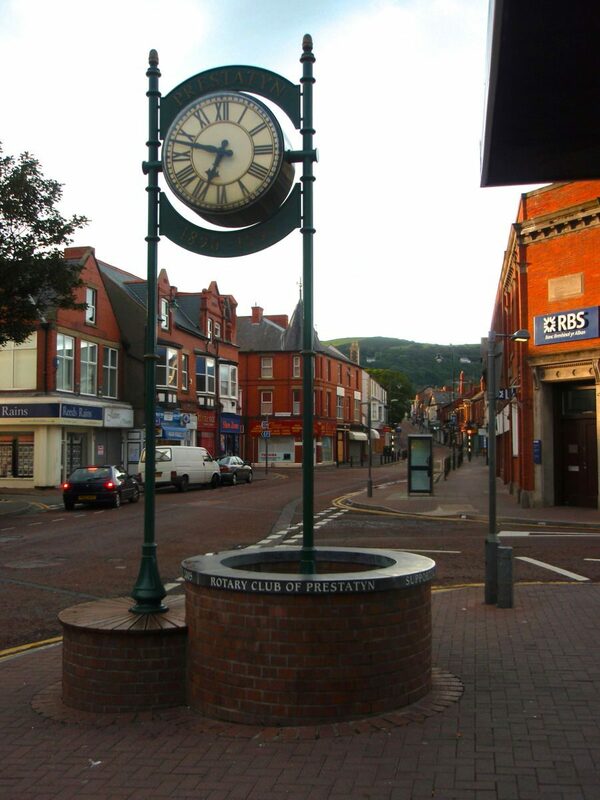 Early morning in beautiful downtown Prestatyn. It gets busier later in the day. Stone style and waymarks. Crossing styles was the hardest aspect of hiking with a bad knee. 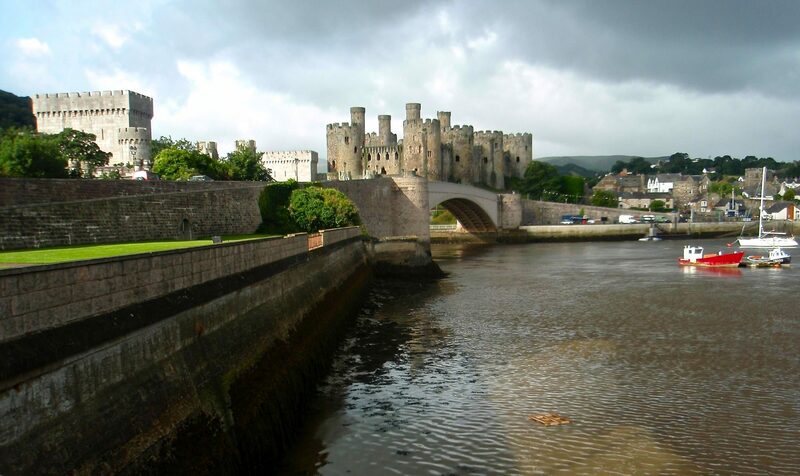 Amy acquired walking sticks in Conwy to help her prevent further damage to her knee. We camped the previous night in the valley just to the right out of the picture. 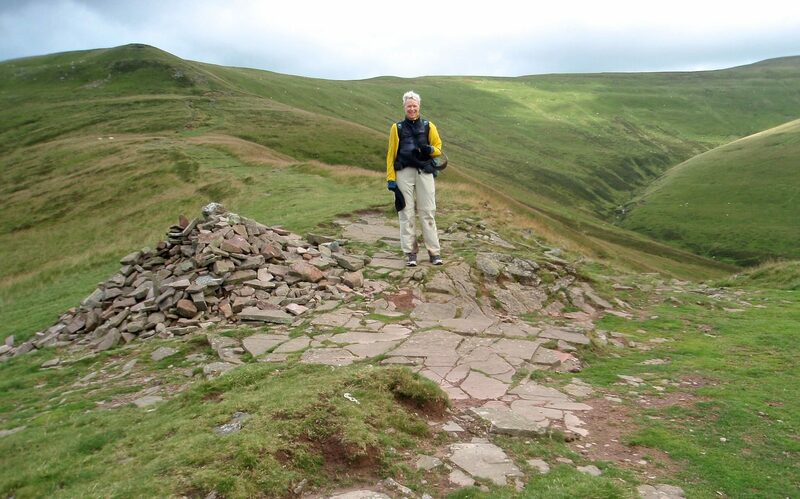 The well maintained National Trail (unlike the tough going on the Cambrian Way) made it possible for Amy to carry on. 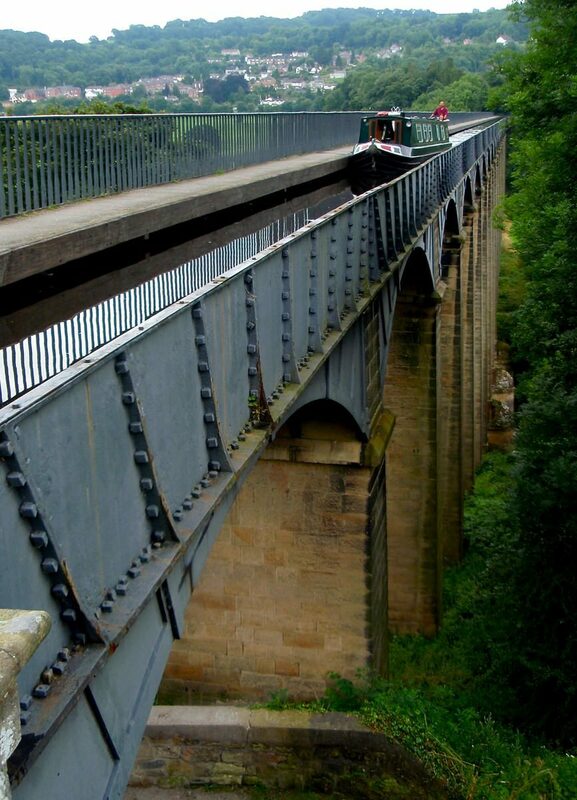 Telford’s Aqueduct carries a canal across a deep valley. The trough holding the water is made of cast iron. The tour was closed on the day we were there, so we could only visit the castle courtyard. 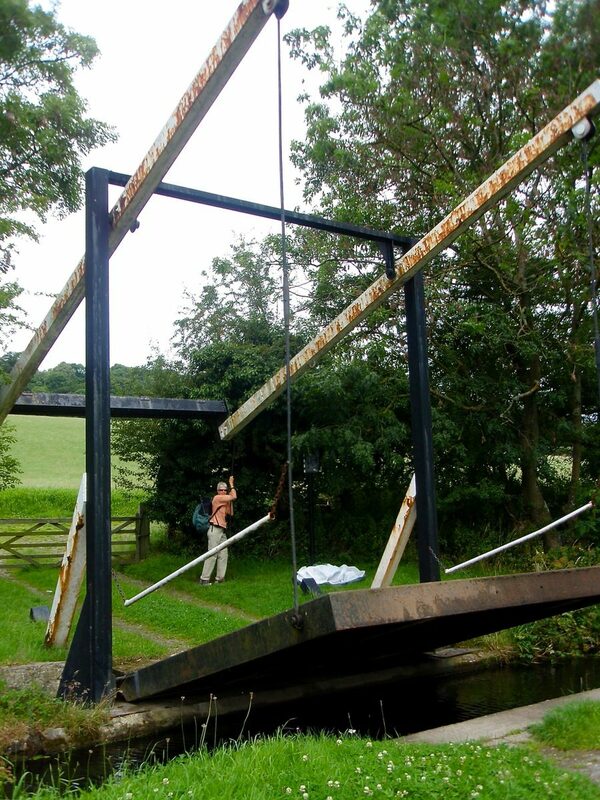 A manually operated bridge over a canal. Day #21. Lunch spot in an old church portico in case it rained; it didn’t. 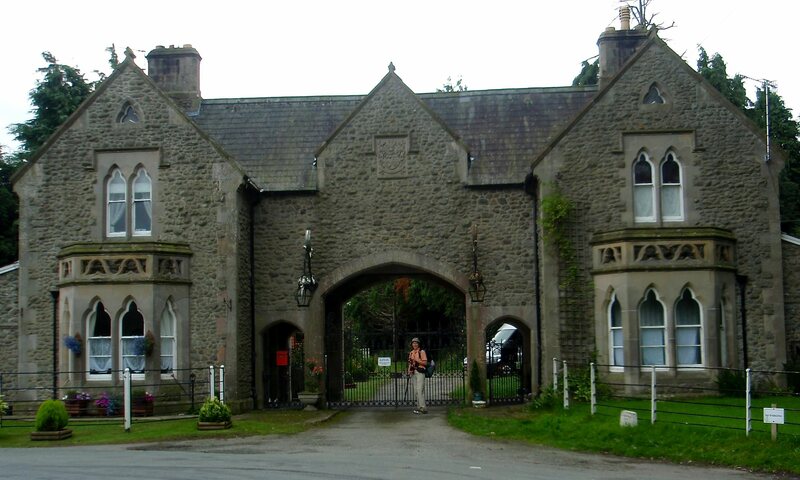 The ODP goes through these gates. One of the nice things about walking in Britain is how deeply integrated into the cultural fabric the public paths are. The mornings were now often very lovely. 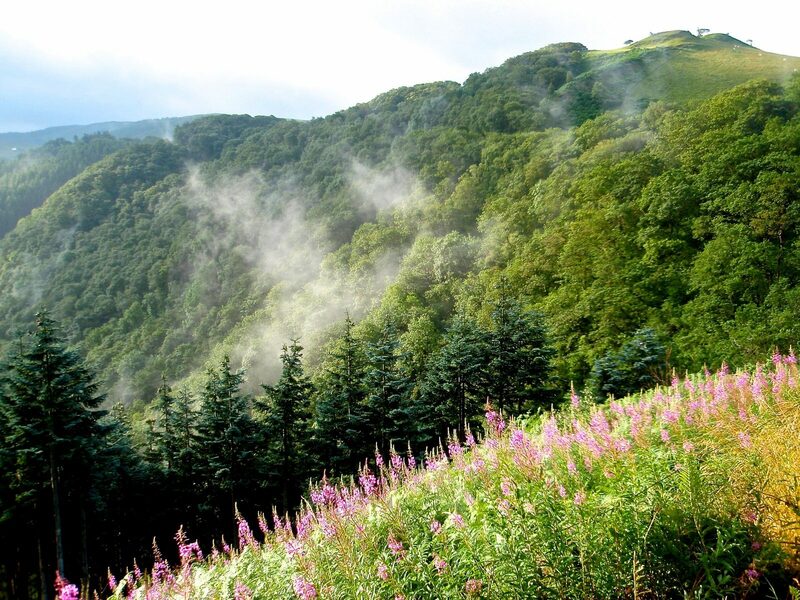 National Trail designation means there is funding for high quality trail maintenance. 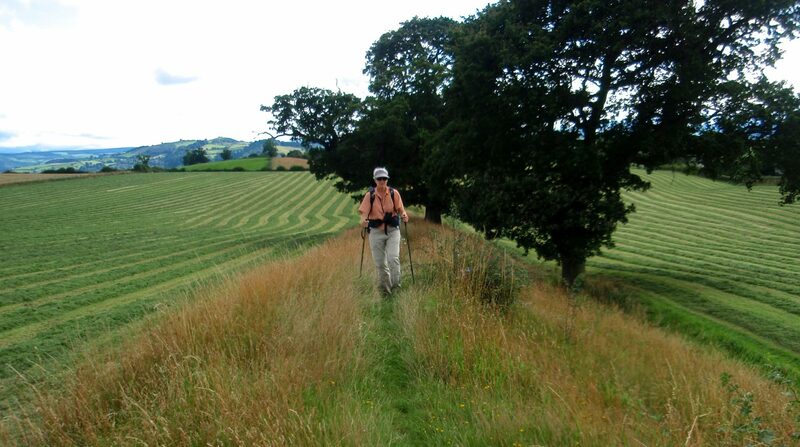 So the whole length of the Offas Dyke National Trail had better tread than most of the Cambrian Way. 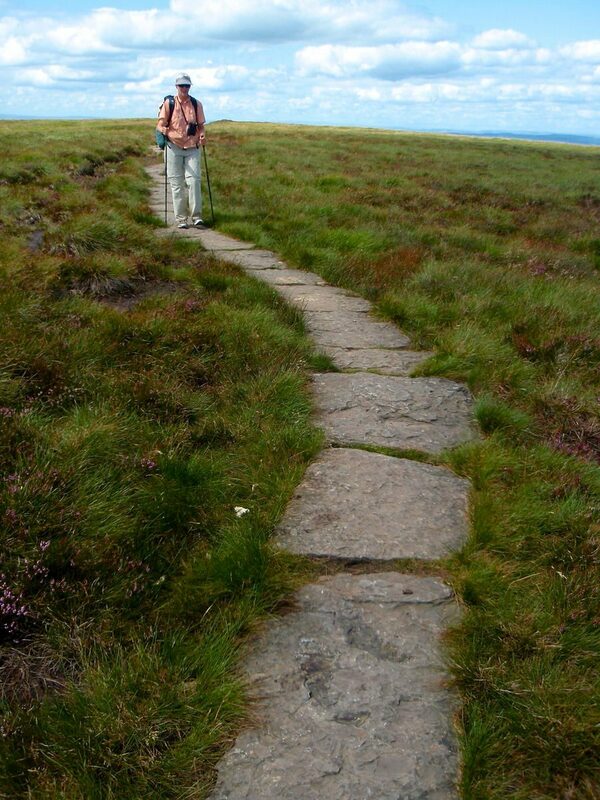 In muddy places in the moorlands, the ODP was often “paved”. 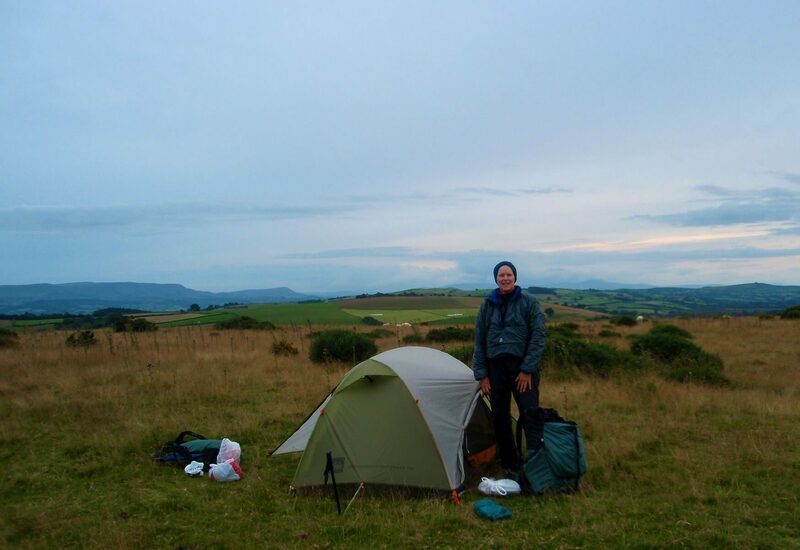 Camp #24, near the previous trig point. The peak above Amy’s head is Sugarloaf, which we crossed on day #3. Camp #26. A fine site on the river tidal flood plane below the Sedbury Cliffs. 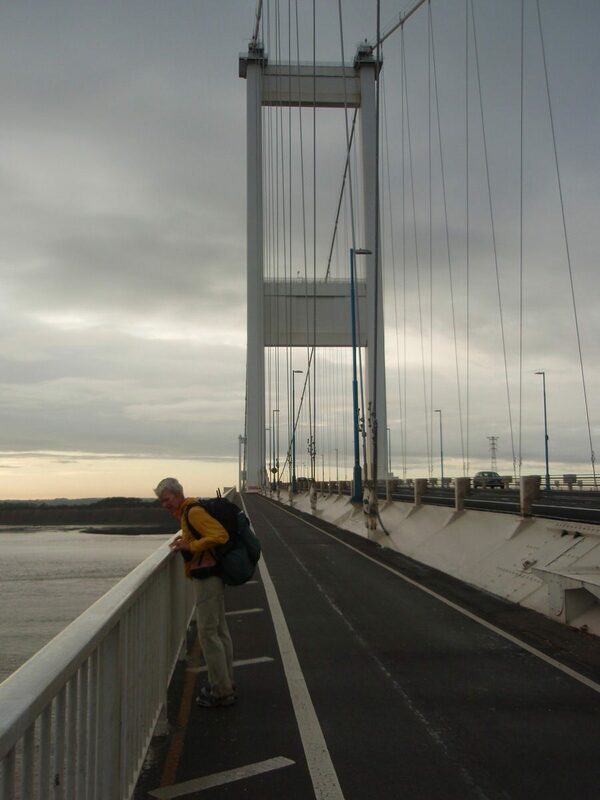 We will walk across the bridge tomorrow heading for Bristol and Bath. 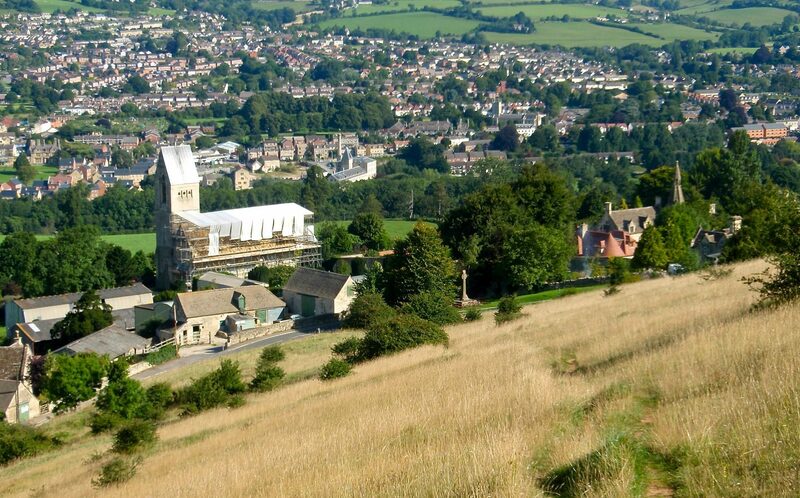 This is the start of Phase #4, Sedbury Cliffs to Bath, which took two days. 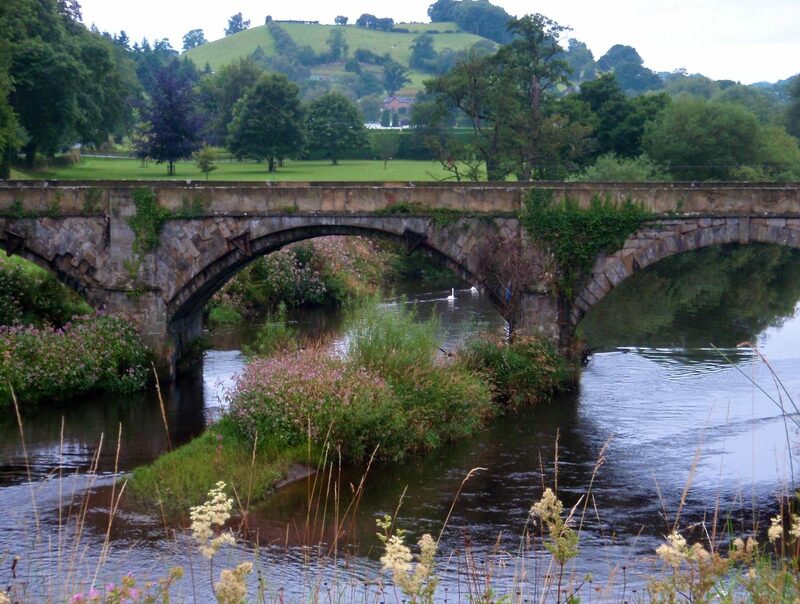 River Avon and the town of Pill, the start of the River Avon Trail, which we will follow to Bath. 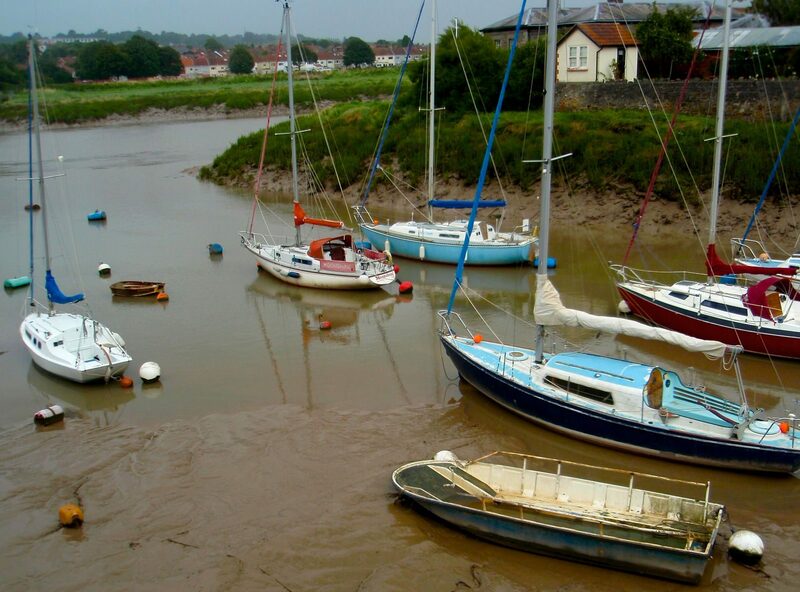 The River Avon has forty foot tides. Brunnel’s Clifton Gorge suspension bridge in Bristol. Constructed in the 1860’s. 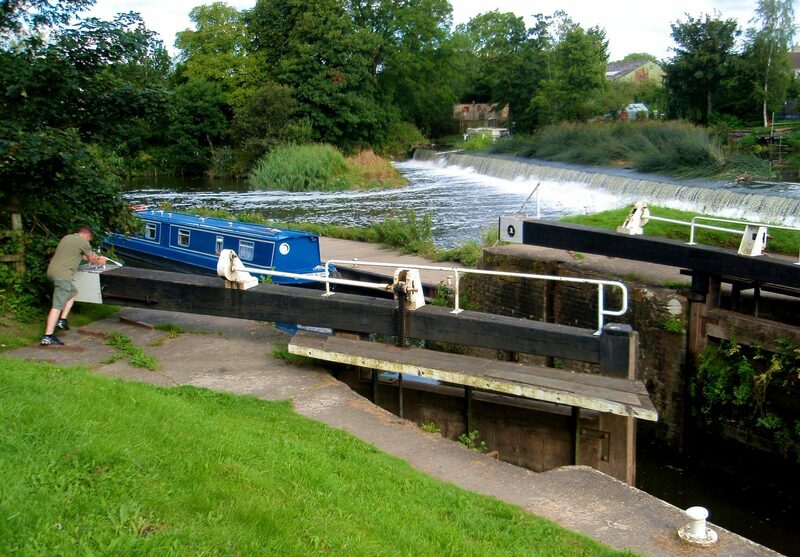 Above Bristol, the Avon is controlled by floodgates and is navigable by canal boats. Another path through a cultivated field. Can you imagine this happening in the US? 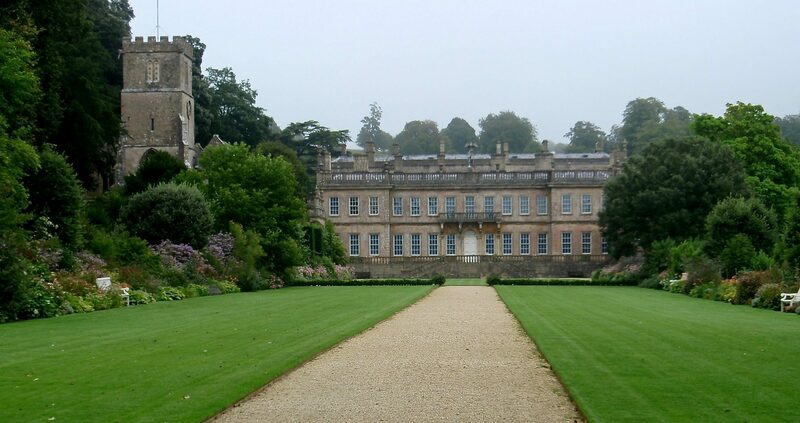 A Cotswold manor house and its private chapel, now an English Heritage site. Some styles are fancier than others. It’s still a struggle to get the bad knee over. A monument dedicated to John Wycliffe, the man who, in the 1300’s, published the first English translation of the Bible. He was executed by the Catholic Church for his efforts. 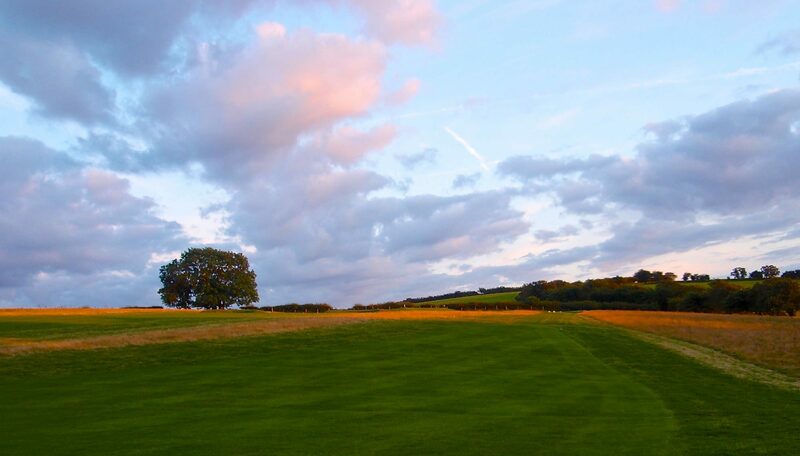 The Cotswold Edge. Most of the local villages are located at the foot of the edge, not on top. Looking down the edge from our campsite. More fantastic dry stone walls. 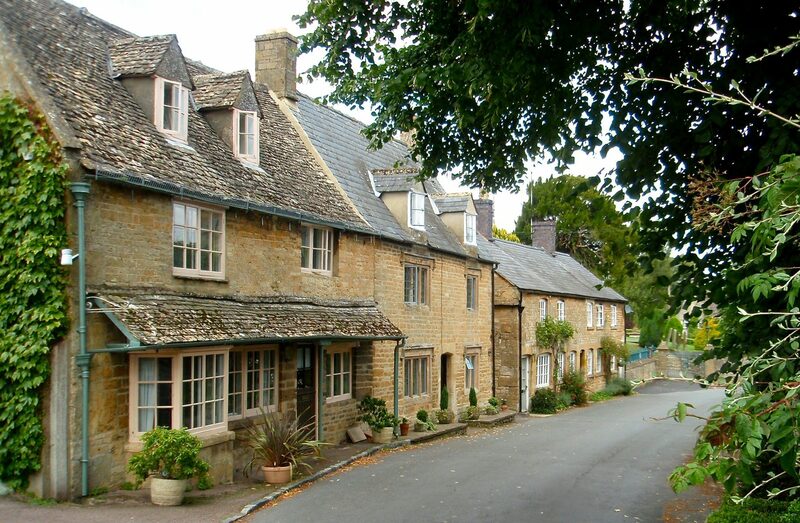 Chipping Camden where the Cotswold Way finishes. On day #10 I slipped on a steep muddy path and caught my foot on a root; my body went downhill but my foot stayed on the root and I tore my ACL and meniscus. That was my first and to date only significant hiking related injury. I took a bus to Conwy, had my leg checked out at the NHS clinic, and spent five days resting while Jim carried on without me to finish the CW. 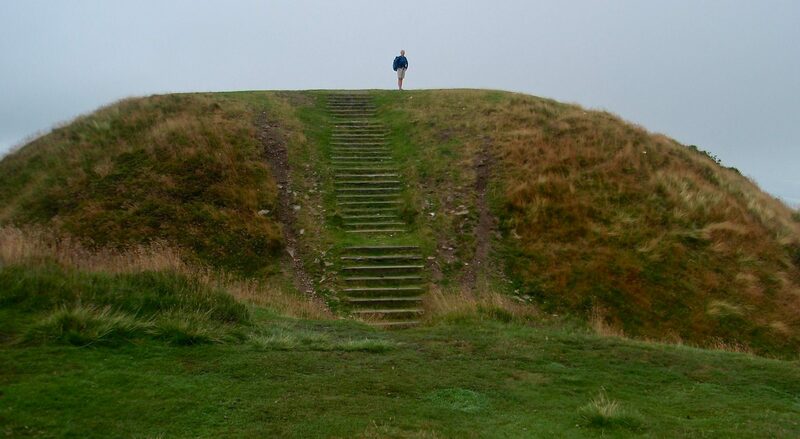 The remainder of the trip was challenging as I was unable to bend my knee more than about 20 degrees so climbing over stiles often required a bit of acrobatics. I enjoyed every part of this hike except the injury. We even maintained high spirits during the first leg of the trip in which we had significant rain nearly every day; it helped a lot that we stopped almost every day for a hot meal. It also helped that we had negligible rain for the remaining three weeks, as we felt like we were rewarded for our perseverance. The two National Trails were so well marked and well maintained that walking them was care-free and relaxed. 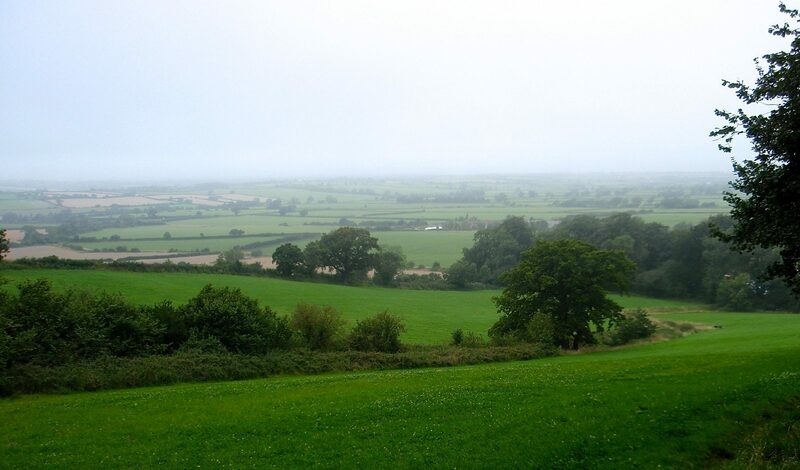 The British countryside is scenically beautiful and pleasing even though it is not grand. 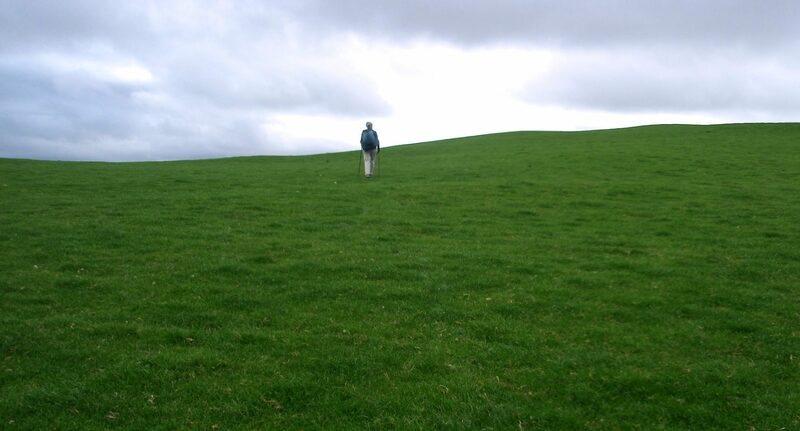 Walking from village to village through the beautiful green lush landscape is delightful. Any assessment has to ask the question: would you recommend this walk to other competent hikers? In this case, the answer is yes, with a few qualifications. The first significant qualification is that you must be willing to tolerate bad weather, sometimes for significant periods of time. 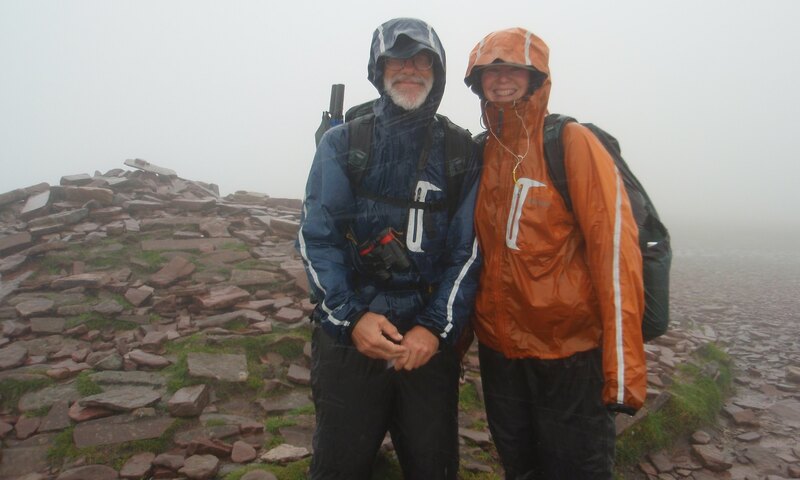 We were wet and had soggy feet for the first two weeks while we were on the Cambrian Way. That’s just the way it was and I am pleased to say that we kept our spirits up and plodded on. Obviously it would have been better had it not been so rainy, but you just can’t count on that in Wales. 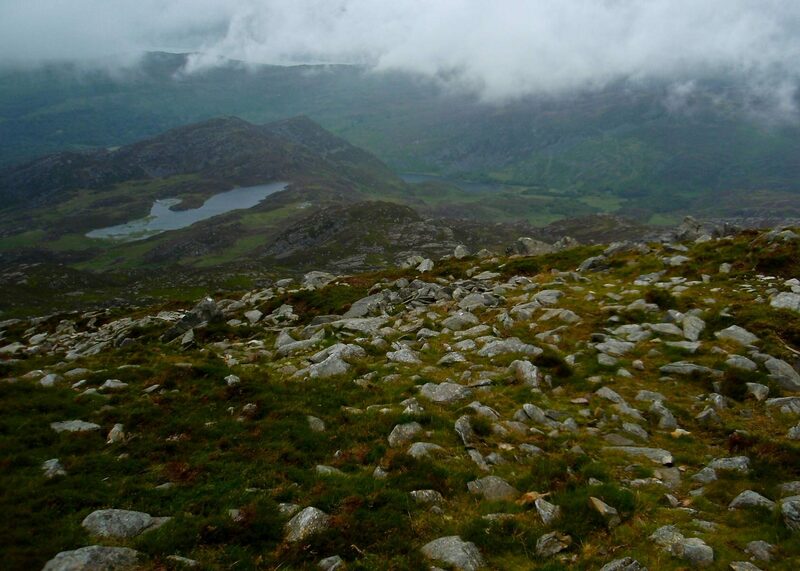 Dealing with horrible weather on the top of Glyder Fawr and Glyder Fach in Snowdonia, white-out conditions, gale force winds, and torrential rainfall, was one of the more intensely challenging outdoor experiences I have ever had. I was fortunate that the clouds parted just briefly enough to allow me the chance to pick out a route down off of the ridge top to enough shelter to dry out, warm up and avoid a case of hypothermia. Fortunately, I was able to tick the two checkpoints, Fawr and Fach. The second thing to consider is that this is not a wilderness walk. Britain has been settled for a very long time and there were no places on this hike that could remotely be considered wilderness. 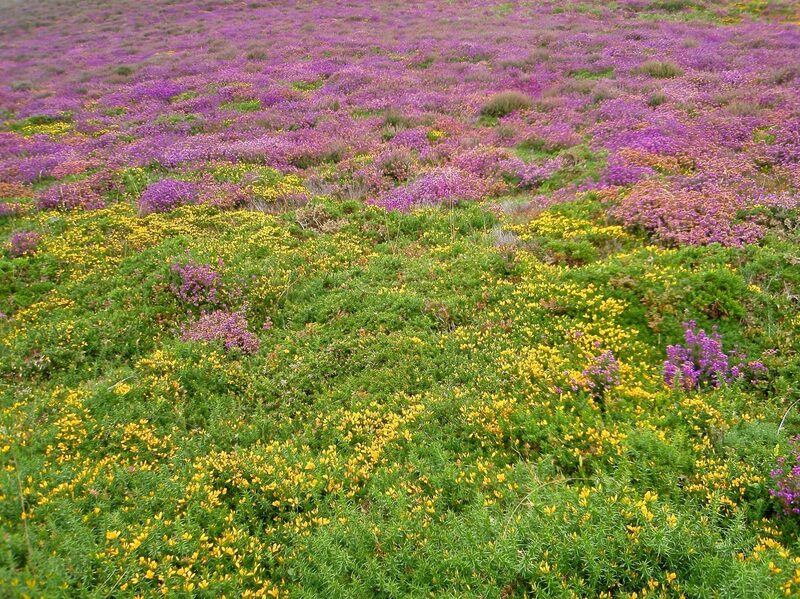 Do not go to Britain expecting wild and untouched country. 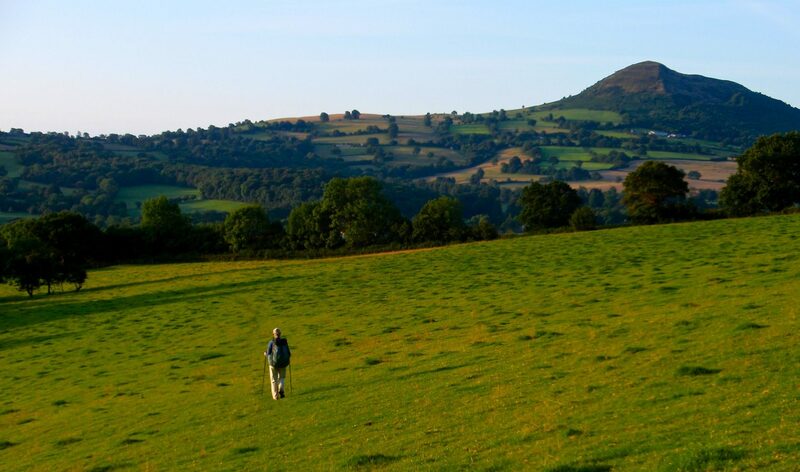 Walking in Britain has many rewards to offer to those accepting it on its own terms. Overall, I found these walks to be enjoyable and satisfying hiking. As we had already walked extensively in England, there were no real surprises, but the trip provided confirmation about why we have kept returning. 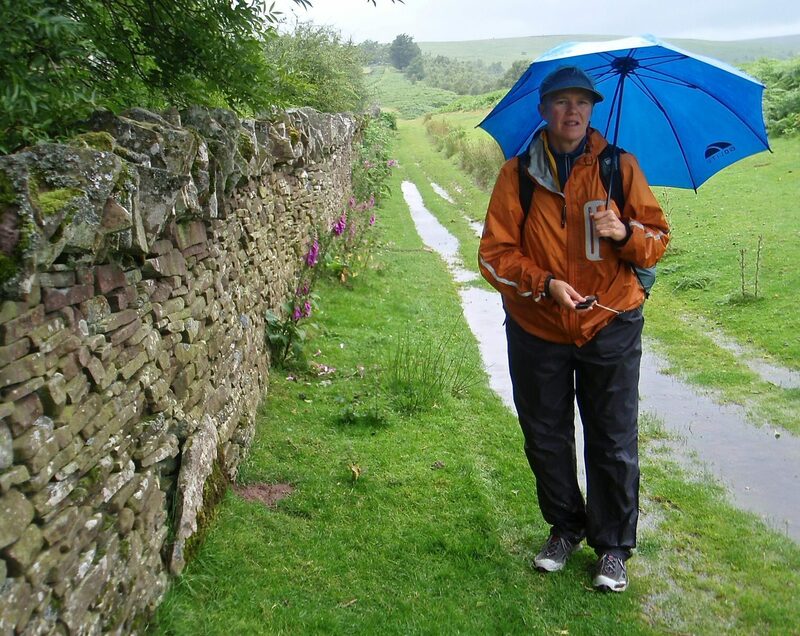 The scenery was good, the cultural and historical features were fascinating, and I have always found walking in Britain to be quite rewarding. There were a few short sections, primarily along the Severn River, that were just something you had to do to get somewhere else, but the vast majority of the route was fine. 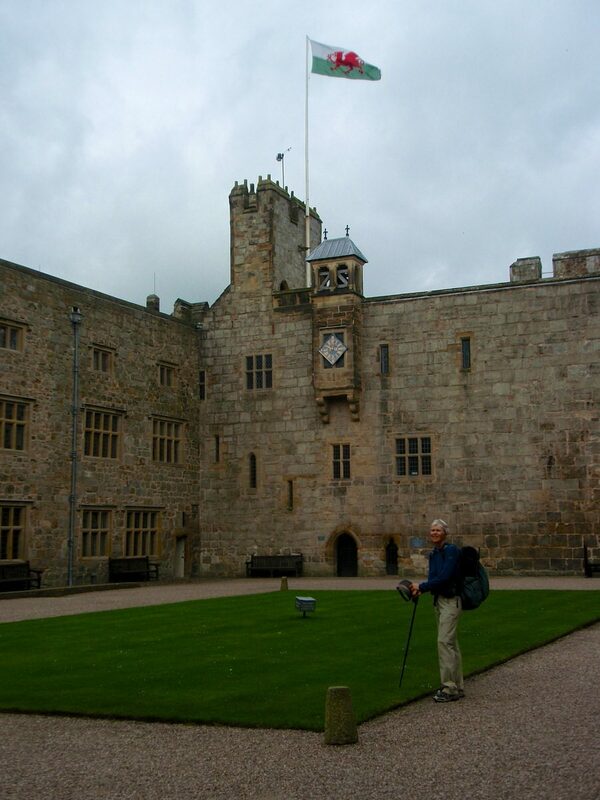 This trip offered a lot of diversity, from the high peaks in Snowdon, a pleasing piece of coastline, gently rolling farmlands, and the fine little Cotswold stone towns. 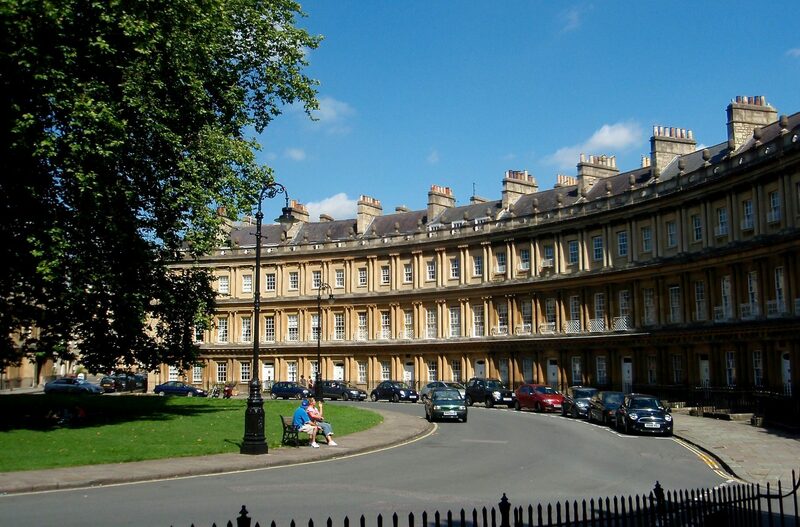 We had sections on the Cambrian Way that felt like real mountains and nicely contrasted with the fascinating and deeply historic city of Bath. Making sure we hit all the checkpoints on the Cambrian Way added a bit of entertainment. 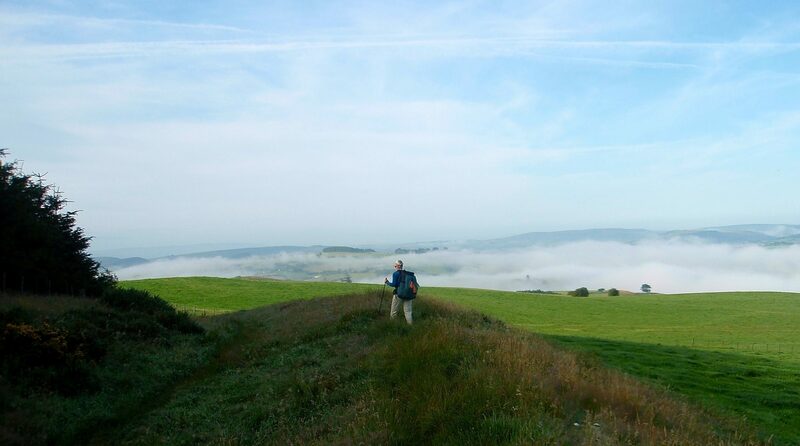 I really enjoyed was the opportunity, when we finished early at the end of Offa’s Dyke, to quickly put together another piece of quite fine walking with little effort other than studying a map or two and buying a new guidebook. 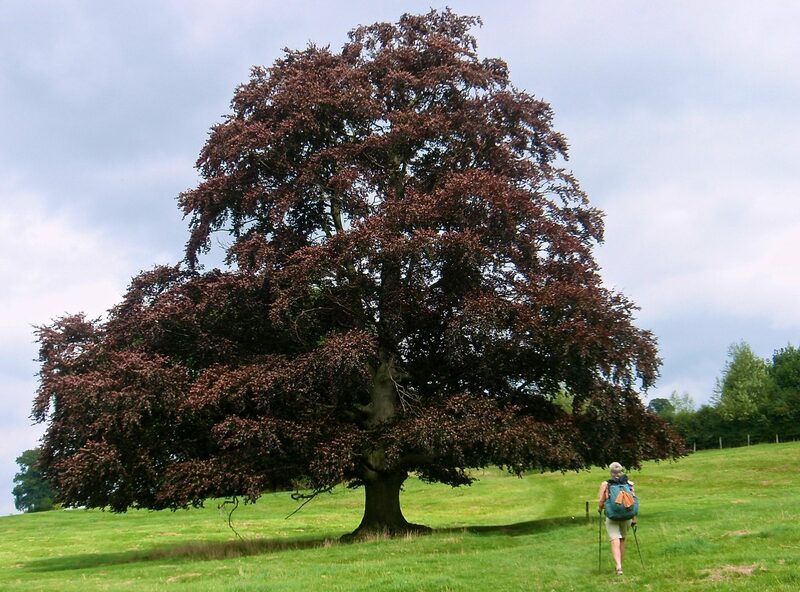 The vast number of walking paths in Britain made it easy to choose an extended route, the Cotswold’s Way, and use footpaths to connect to it. I can easily recommend any of the three main trails we walked. Each one of them would make a fine trip by themselves, but if you have time to do more than one, so much the better. 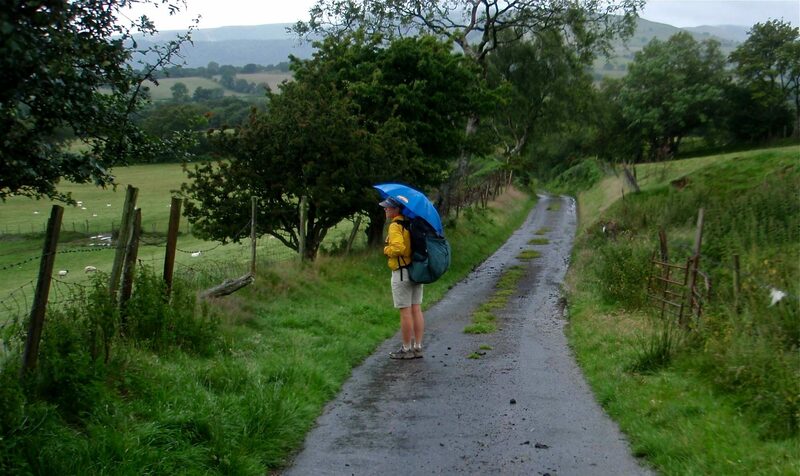 Cambrian Way (CW): The CW is a 290 mile coast-to-coast walk from Cardiff to Conwy in Wales. 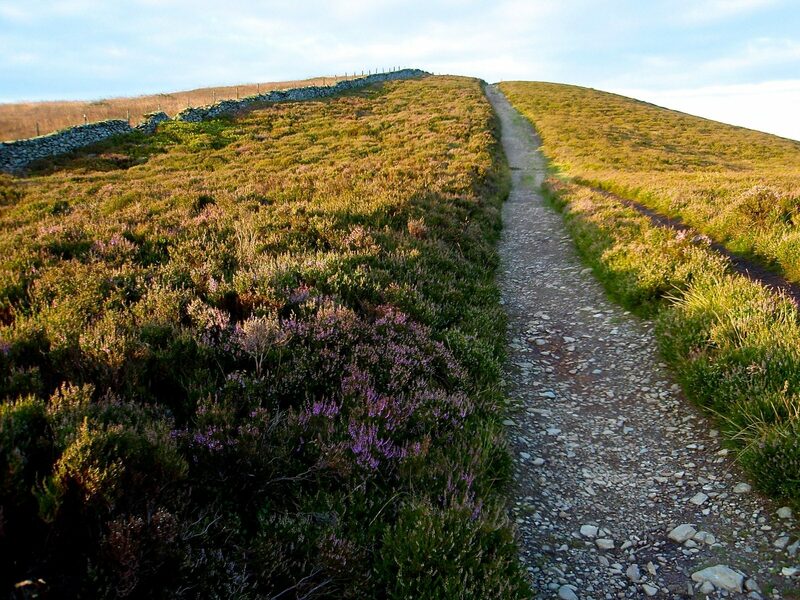 The route is not an official British National Trail (NT) and is neither maintained nor way-marked to the NT standard. 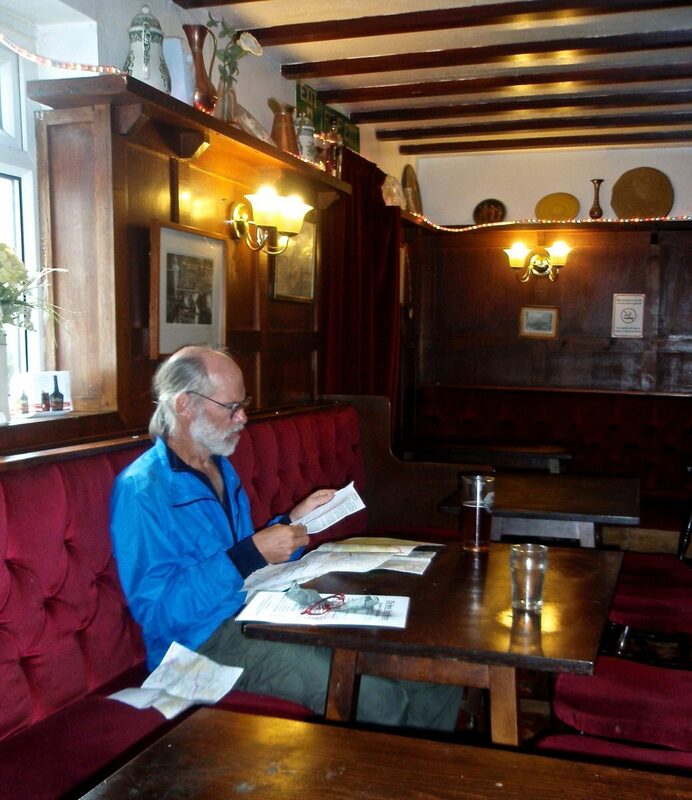 Tony Drake wrote a guidebook to the route and was its primary champion for many years. 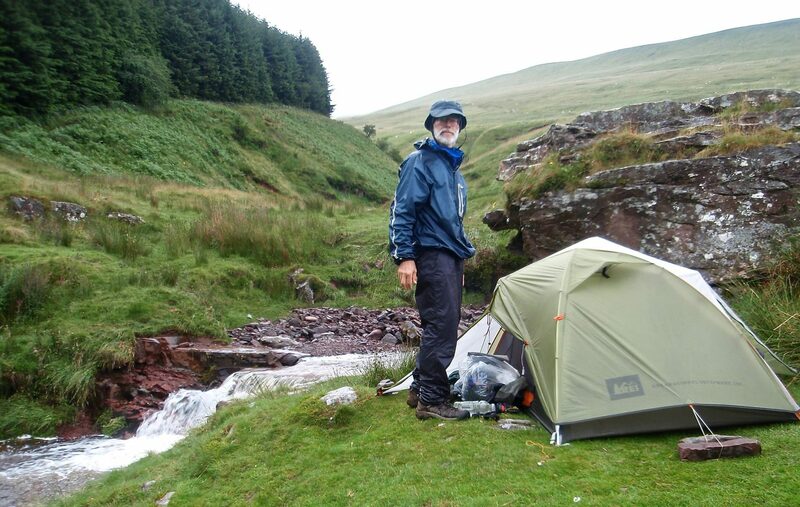 Drake died in 2012 and his work has been taken over by the Cambrian Way Trust. It is not a single designated and named trail as such, but a series of linked paths, some well used and others much less so. 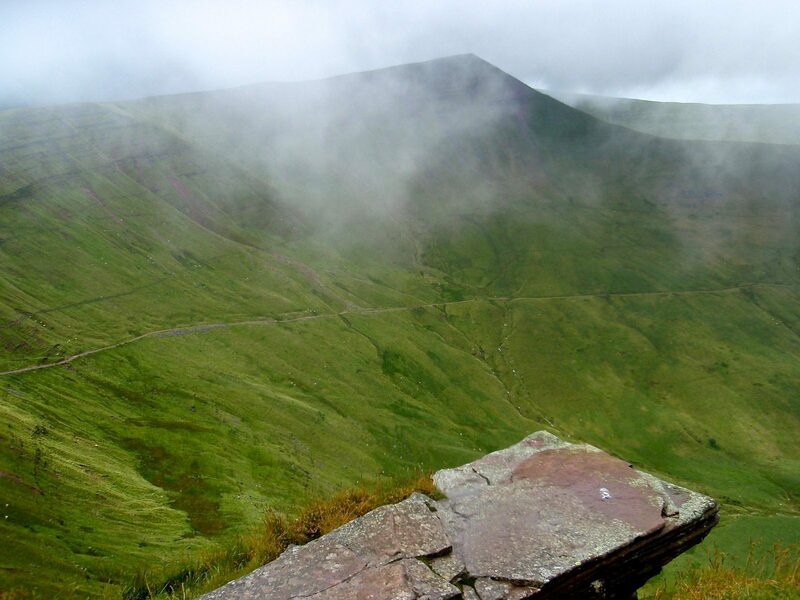 The route traverses many of the main mountain ranges in Wales, including the Black Mountains, the Brecon Beacons, the Rhinogs, and Snowdonia. Along the way, Drake designated a series of 41 checkpoints that must be visited in order to “complete” the route; ticking all of these adds to the enjoyment of the walk. 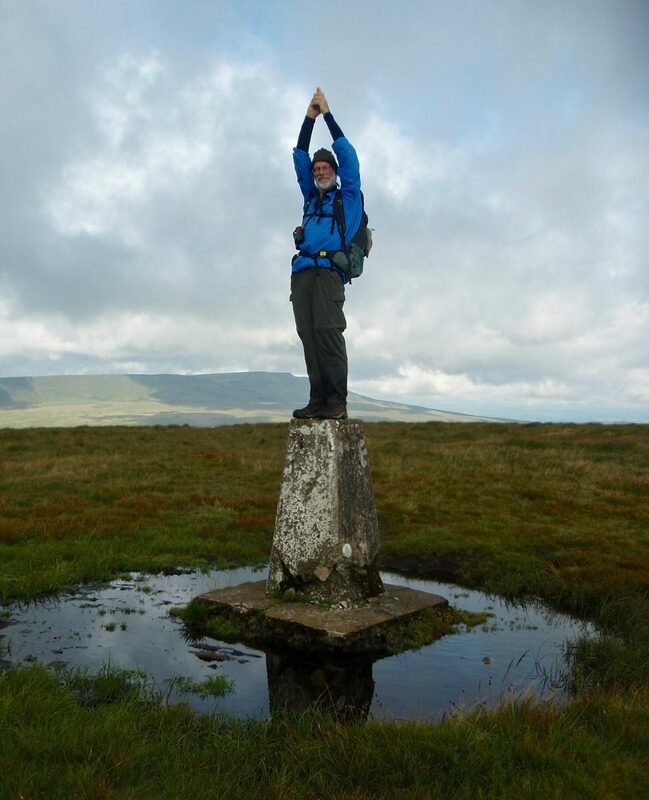 Many of the checkpoints are Ordnance Survey trig pillars, four-side concrete obelisks emplaced by the Survey during the 1930’s on local high points to aid in mapping the country. The CW is often feels surprisingly wild and rugged considering that it travels through regions that have been settled for a very long time. Over half of the walk is in designated National Parks. 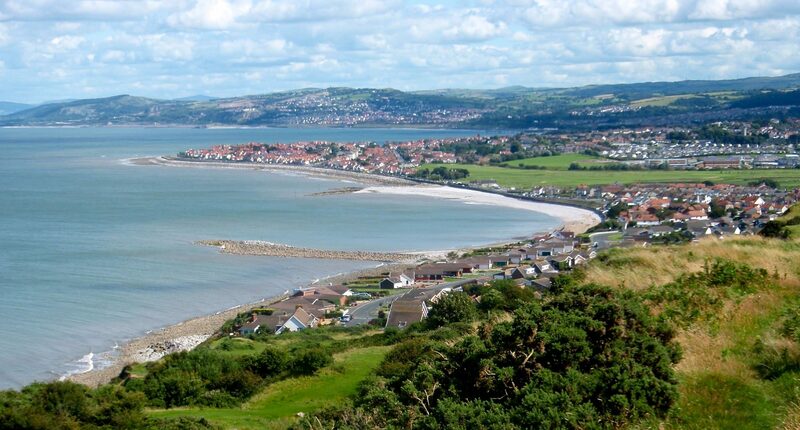 Wales Coast Path (WCP): This 870 mile route now encompasses the entire Welsh coastline. 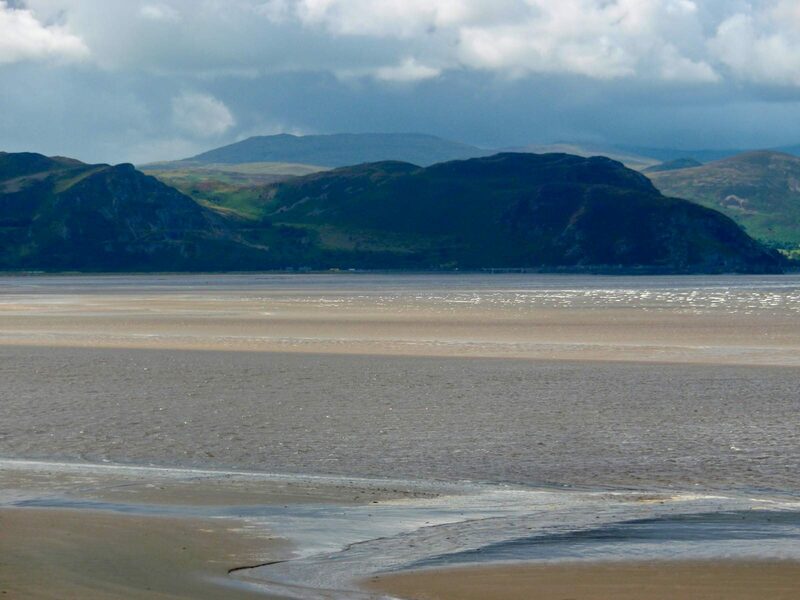 We followed it for about 36 miles along the north coast between Conwy and Prestatyn; this stretch of shore is dotted with numerous villages and holiday towns. 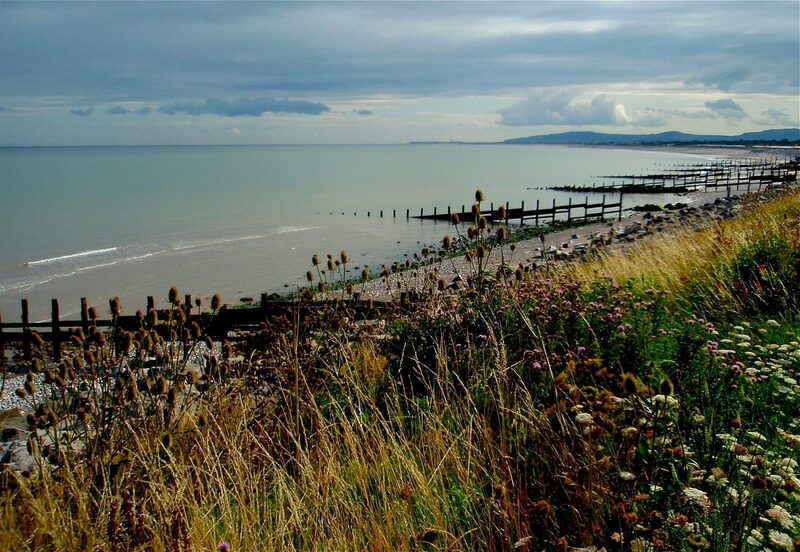 Offa’s Dyke Path (ODP): This British National Trail runs between Prestatyn and Sedbury for about 180 miles along the Welsh/English border and roughly follows a series of defensive earthworks constructed in the 8th century. 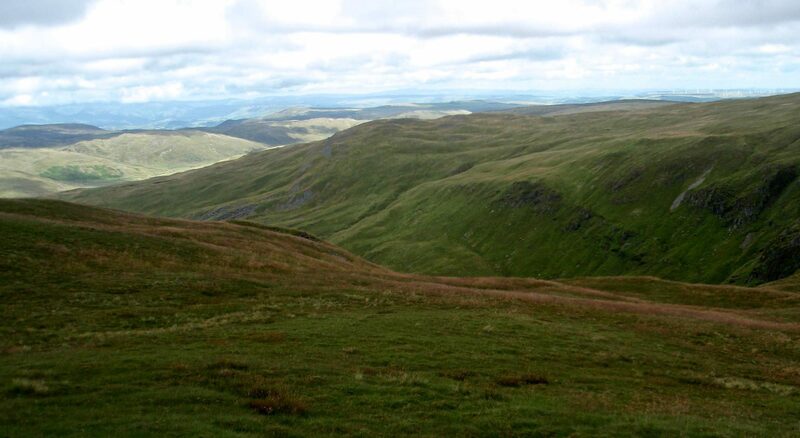 The route is not as high or rugged as the CW and is well maintained and way-marked. 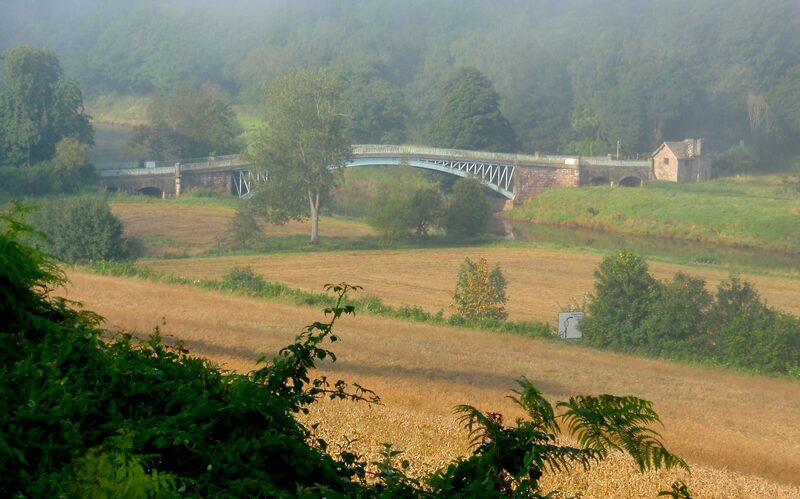 It runs through a nice variety of terrain including ridge tops, open farmland, and alongside old canals. We had planned to conclude our hike at the end of the ODP. However, upon reaching that point we still had 10 days before our flight home, so we studied our maps and extended our hike. 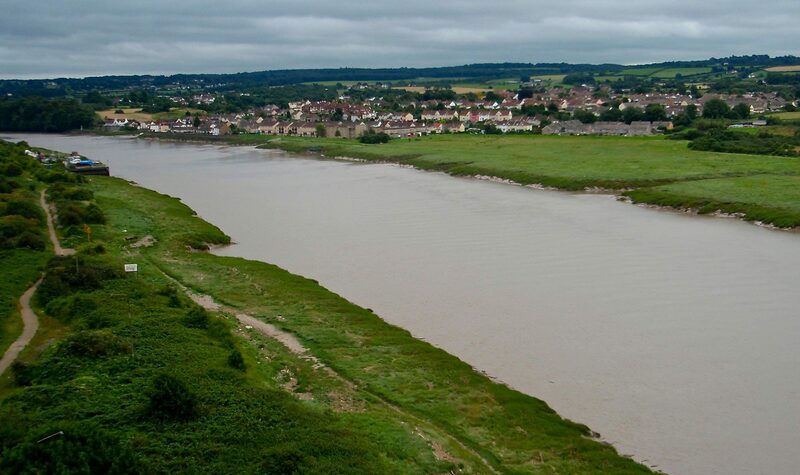 Across the Severn: From the end of the ODP near Sedbury, we made our way to and then across the Severn River Bridge. 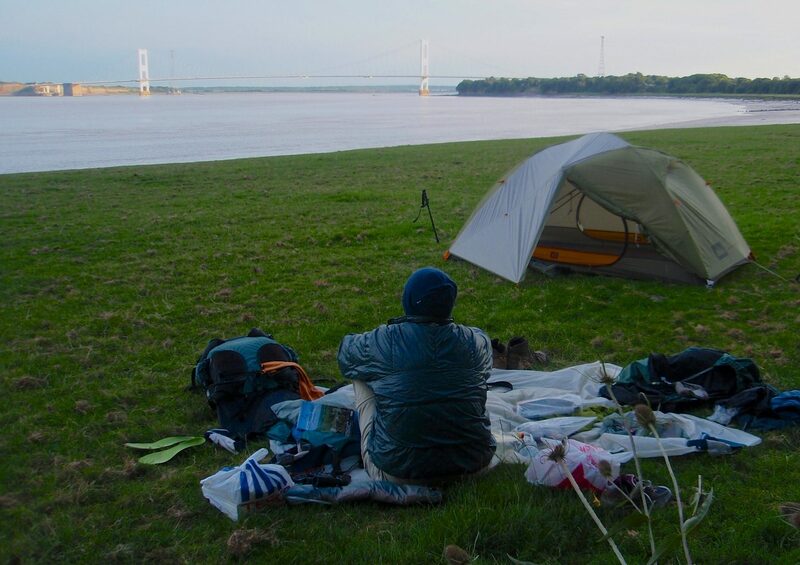 On the south bank of the river we picked up the Severn Way (SW). We followed this for half a day until we reached Pill on the River Avon. When we walked this stretch, the SW was poorly marked and occasionally disappeared into weeds and underbrush along the river. The walk also passed through a large industrial complex in Avonmouth and significant portions were on pavement. At least this portion of the SW provided us a useful connection but is otherwise not recommended. 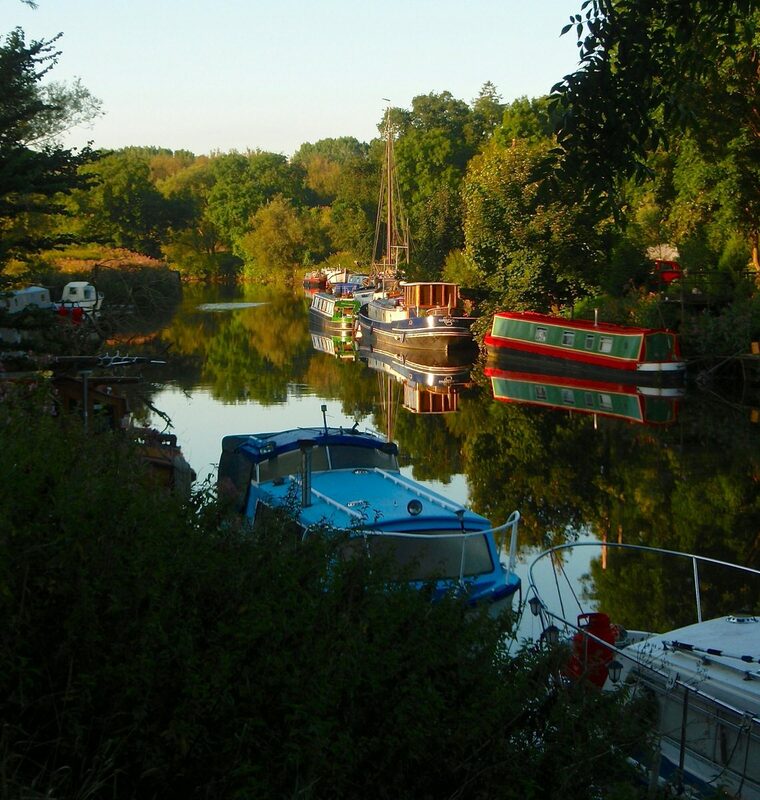 River Avon Trail: This 24 mile trail connects Pill with Bath via Bristol and should not to be confused with the Avon Valley Path, which is in Hampshire. It was a nice day’s walk along the bank of the tidal river. 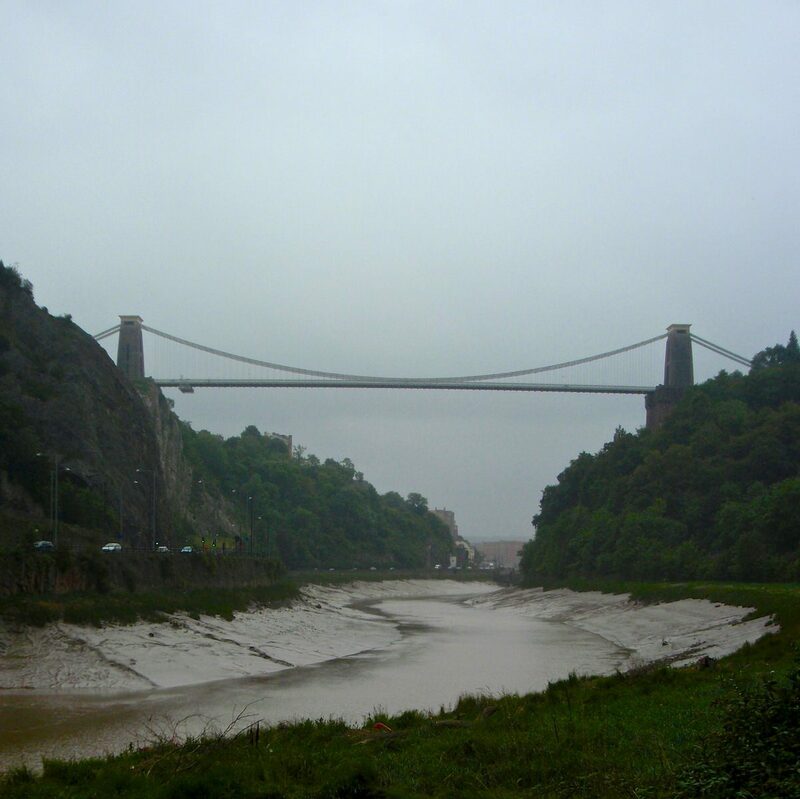 The trail passes through the attractive River Avon Gorge, and in Bristol the gorge is crossed by the Clifton Suspension Bridge, which was constructed in 1864. 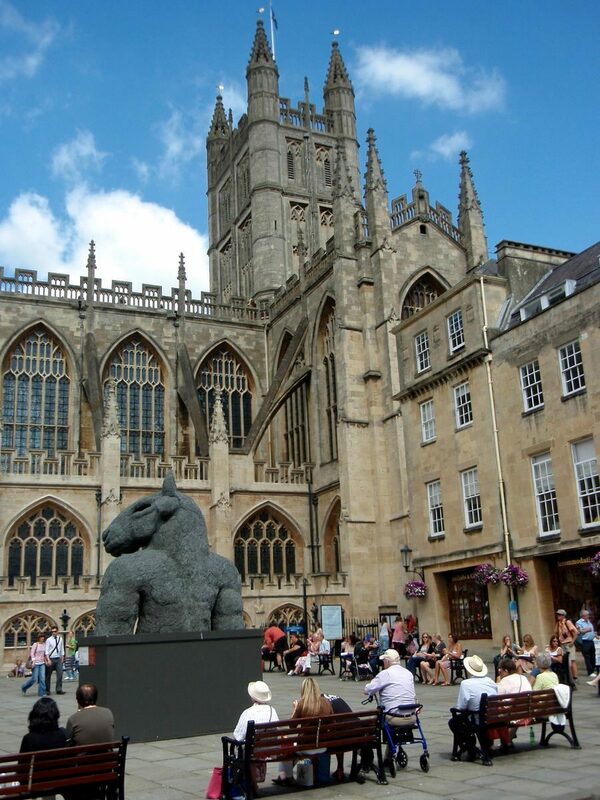 Bath is an fascinating city dating back to Roman times and we enjoyed a great architectural walking tour through town. 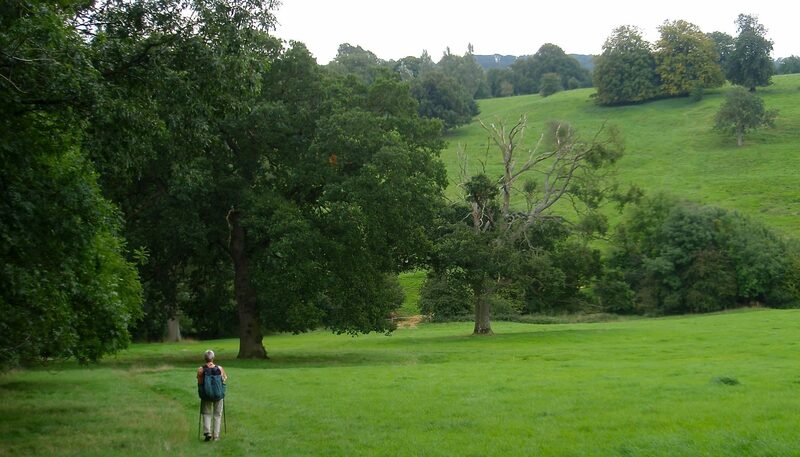 Cotswold Way: This is a relatively new National Trail and is well maintained and way-marked. 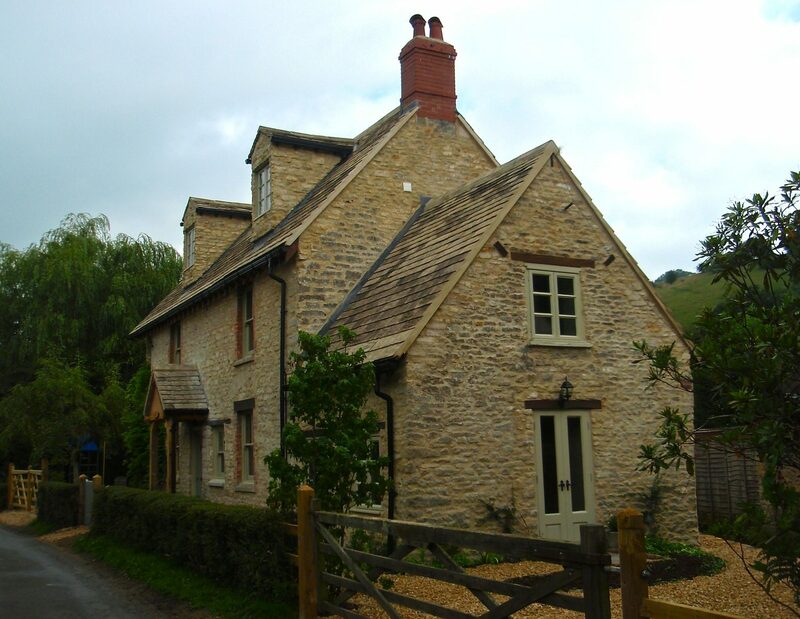 It is a very pleasant and easy ~100 mile walk from Bath to Chipping Camden through the Cotswolds. 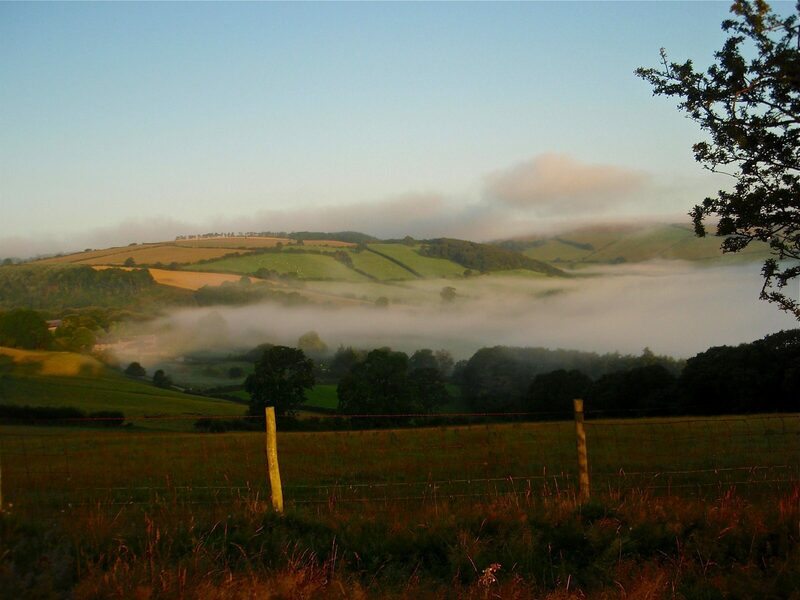 This is an area of low rolling hills dotted with amazingly charming villages and numerous historic and cultural sites including Neolithic burial chambers and Roman villas. 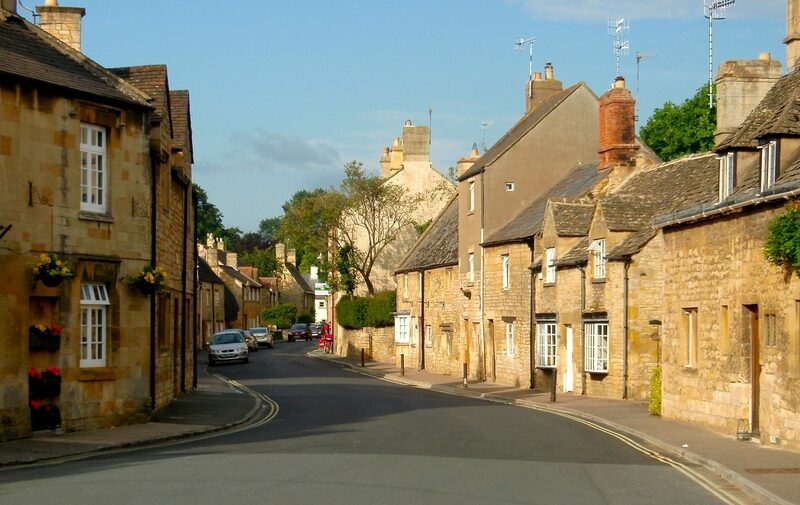 The Cotswolds were named an Area of Outstanding Natural Beauty in 1966. 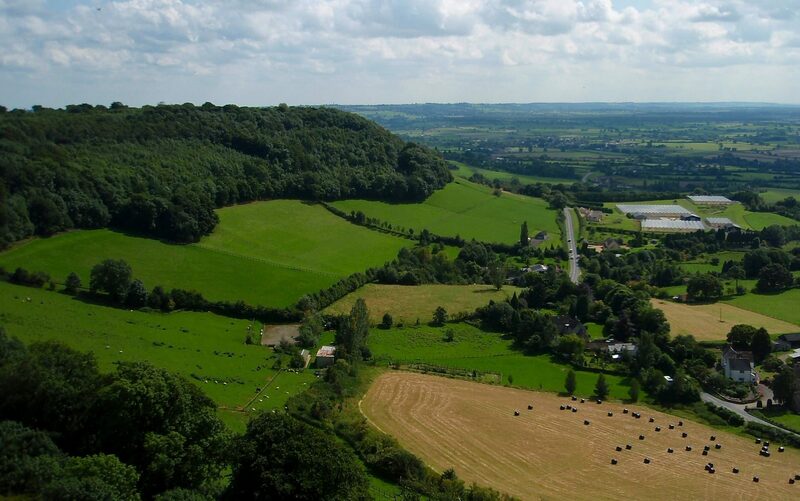 A portion of the Way follows the escarpment of the Cotswold Edge and provides fine views out over the bucolic countryside. 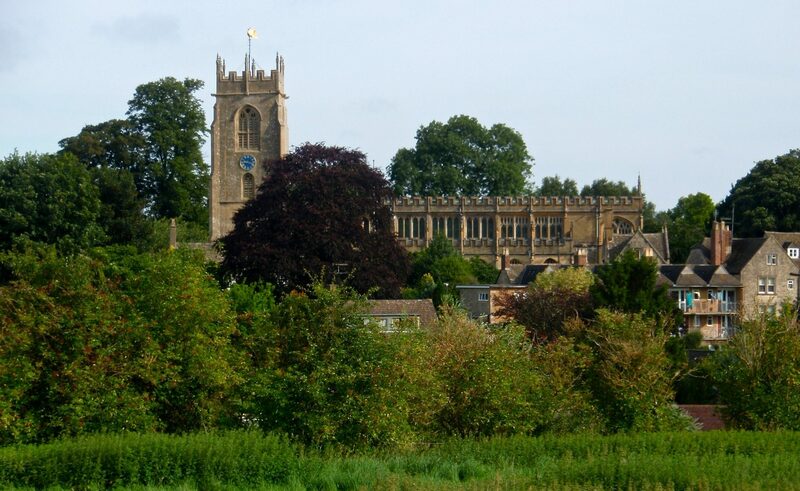 To Morton-in-Marsh: We put together a nice day’s walk between Chipping Camden and the Morton-in-Marsh railway station so we could catch a train to Oxford and then on to Heathrow for our flight home. This was easy to plan as Britain is laced with public walking paths. 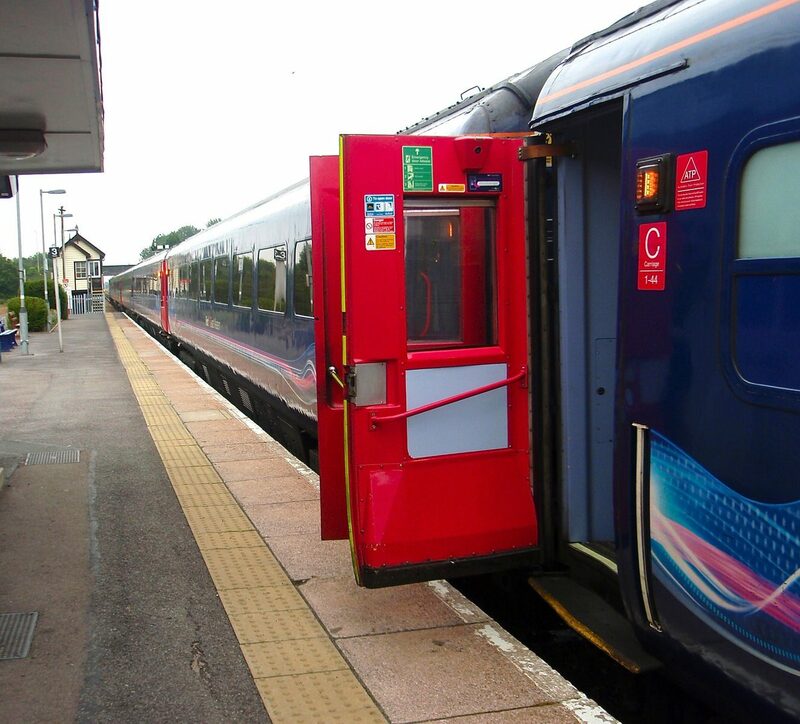 Public transportation is widespread in Britain, so it is quite easy to access the start and end points of the major trails. We took a direct bus from Heathrow to Cardiff to start our walk. With the various guidebooks, OS maps, and gpx tracks, navigation was never a challenge except on a few portions of the CW. The other trails, particularly, the two National Trails, are well way-marked and easy to follow. 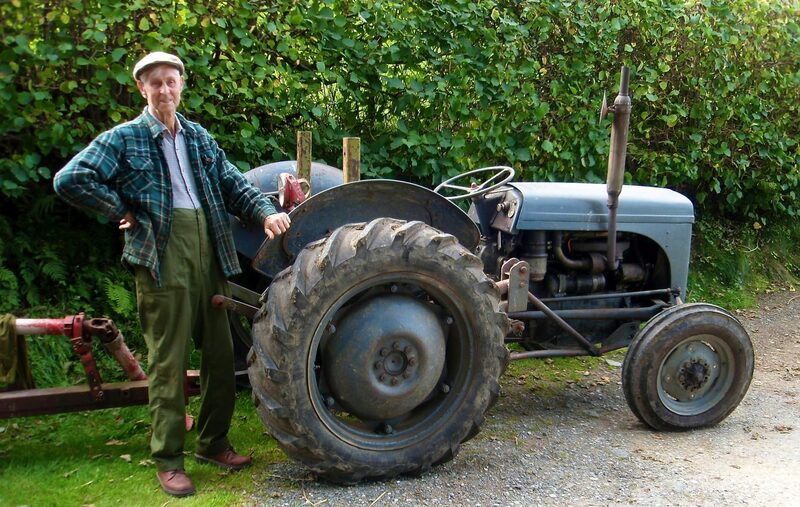 Do not be surprised when the trail leads into farmyards, across planted fields, and occasionally through buildings. Public access rights are quite different in Britain than in the US. On the CW, there were places where the route was a bit hard to follow. Some portions were well marked and identified, but other sections had no way-marking at all. 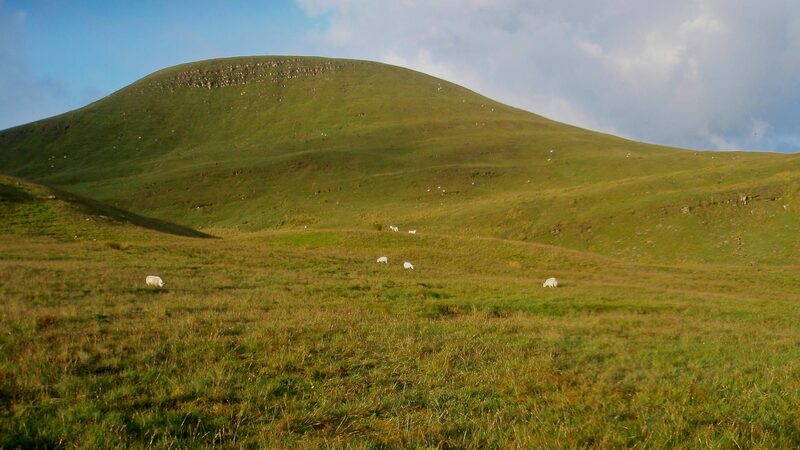 There are a few places where the trail essentially diverges into numerous sheep tracks that go every which way, and other places where the route is so infrequently used that bits of undergrowth obscure it. 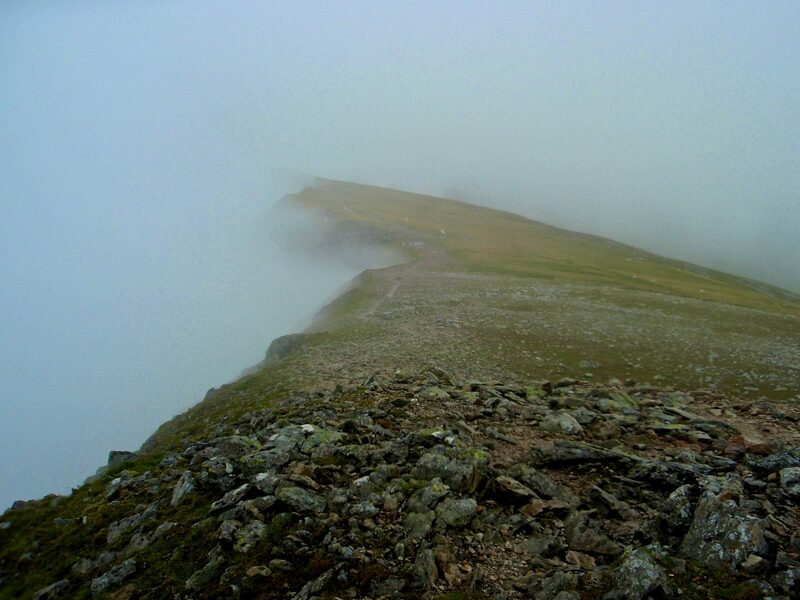 Foggy or cloudy weather can reduce visibility to literally a few feet, so successful navigation can become a real test of your ability to follow a map and read the terrain. 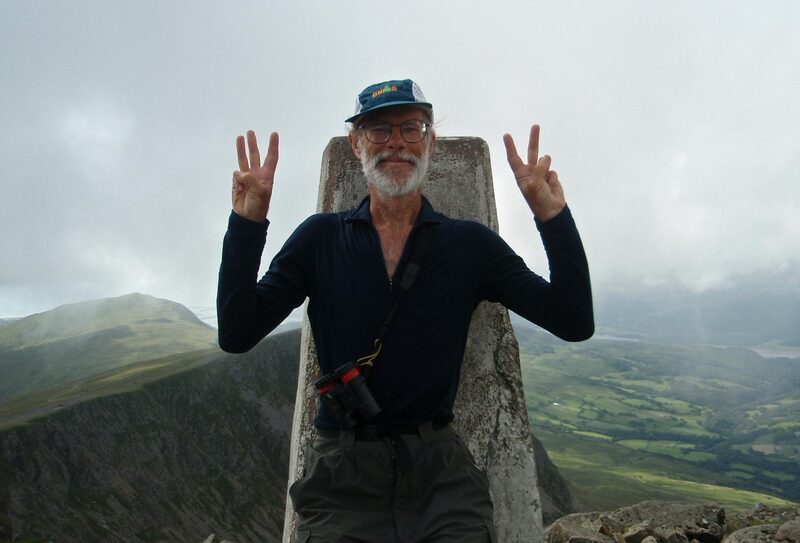 The CW passes over a number of summits, including Snowdon, at 3560 feet the highest point in the British Isles outside of Scotland. Snowdon has a cog railway line to a café at the summit. Over half a million people visit that summit annually. 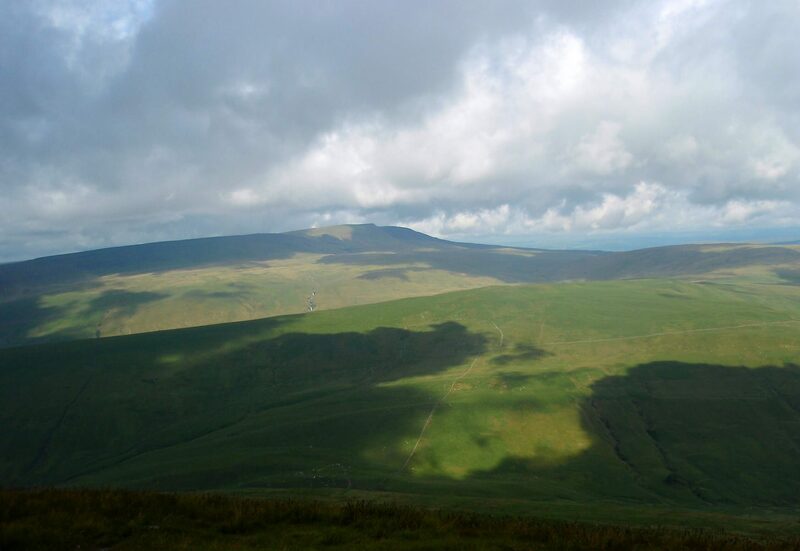 Other peaks on route include: Pen Y Fan, Bannau Brycheiniog, Plynlimon, Cader Idris, Moel Ysgyfarnogod, Cnicht, Carnedd Dafydd and Carnedd LLewelyn. Except for on the CW, there are no technical problems on any of these routes. 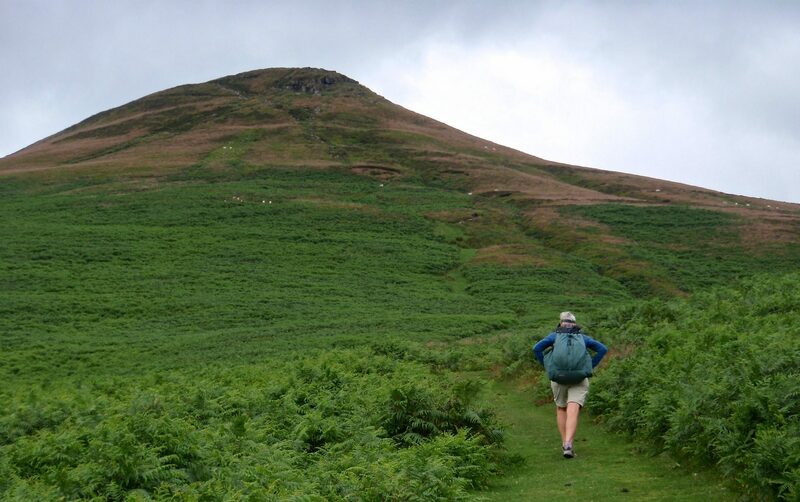 British National Trails meet high standards for ease of use for people with a range of walking skills. On the CW, there are areas where some off-trail walking and rock scrambling is required, but these never exceed class 2 in difficulty. On all of the trails the ground can become quite muddy when it rains and wet feet should be expected. 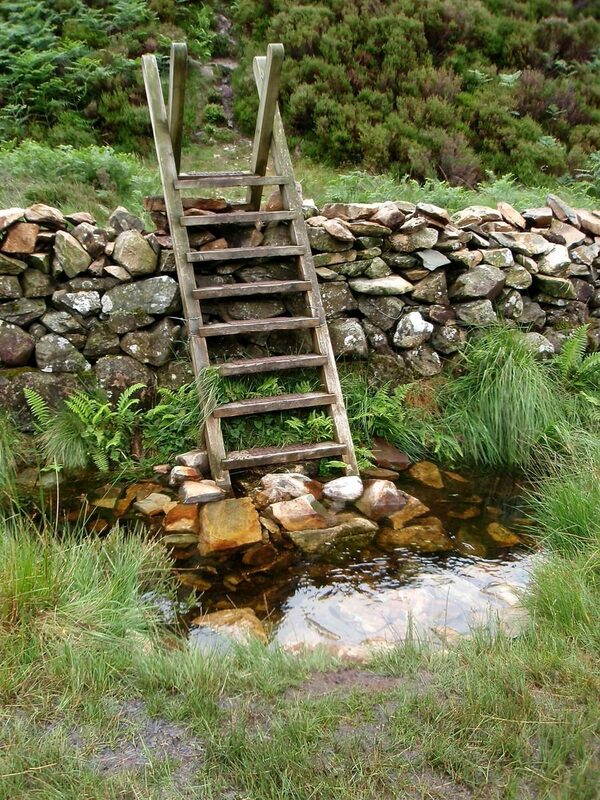 Large puddles of standing water accumulate, particularly around gates and stiles, making access to these a soggy nuisance. 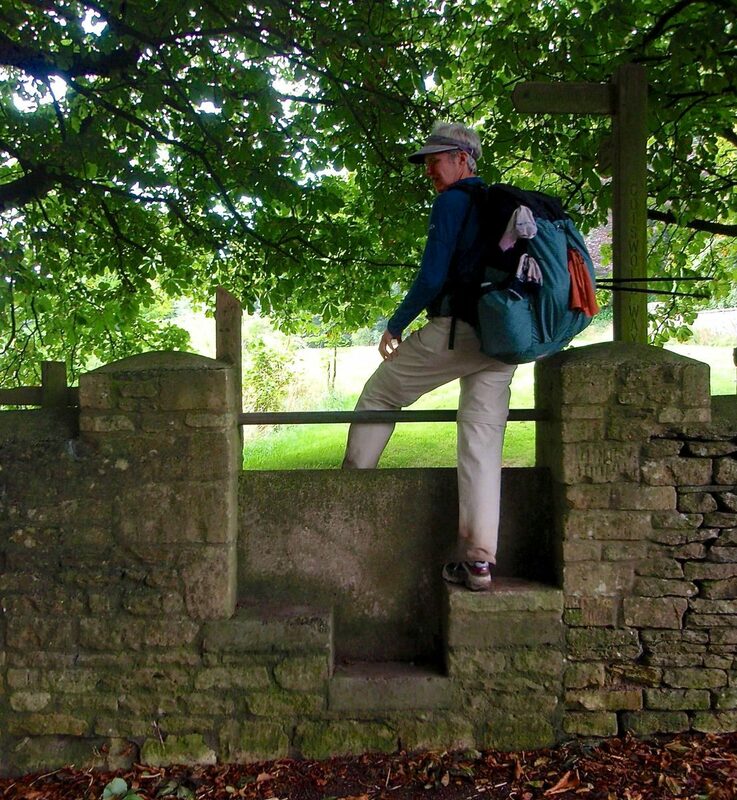 Walking in Britain requires crossing large numbers of gates and stiles. The ODP alone has 450 stiles and 125 gates. 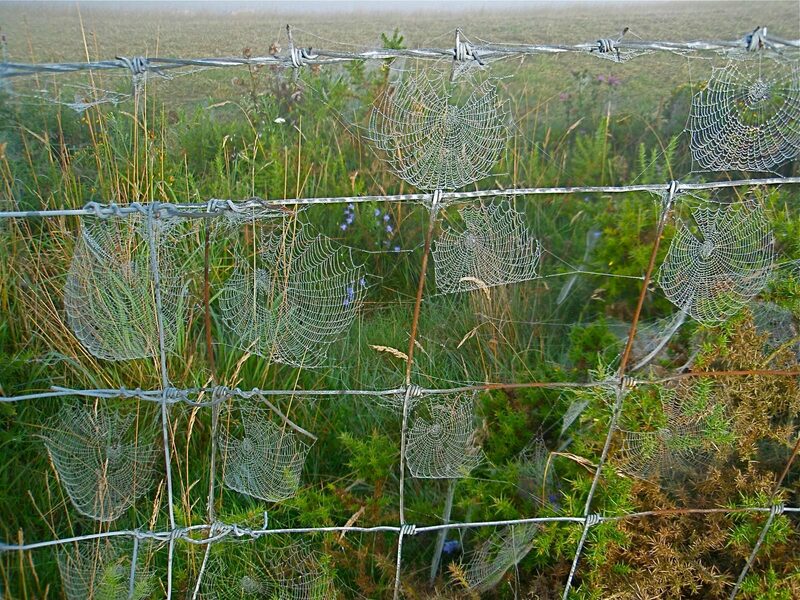 These are present because most trails in Britain cross either private or communal agricultural areas. Long codified British law gives the walker rights to cross these fields and paddocks and also requires the agricultural users to provide a means to cross the boundary fences and stone walls. 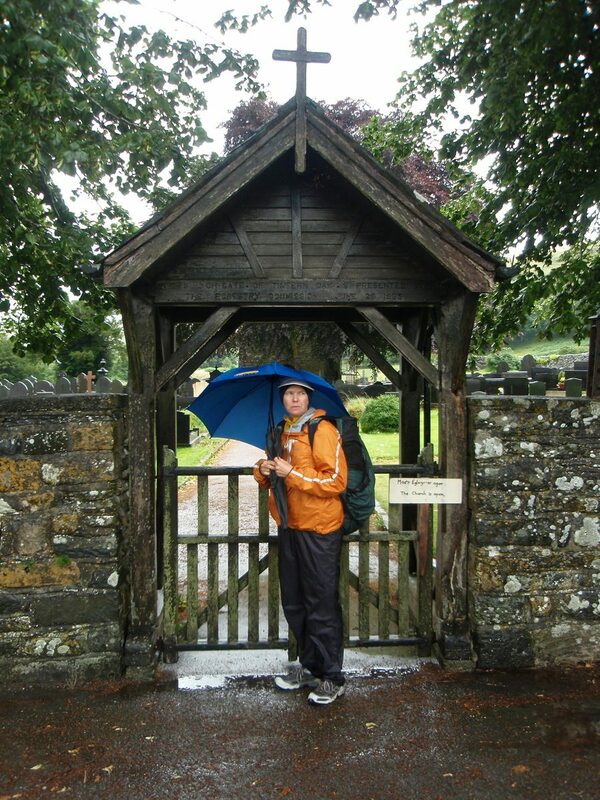 We enjoyed the vast variety of gate and stile designs, even after climbing over the fortieth stile for the day. All of the trails we walked other than the CW are quite suitable for less experienced backpackers. 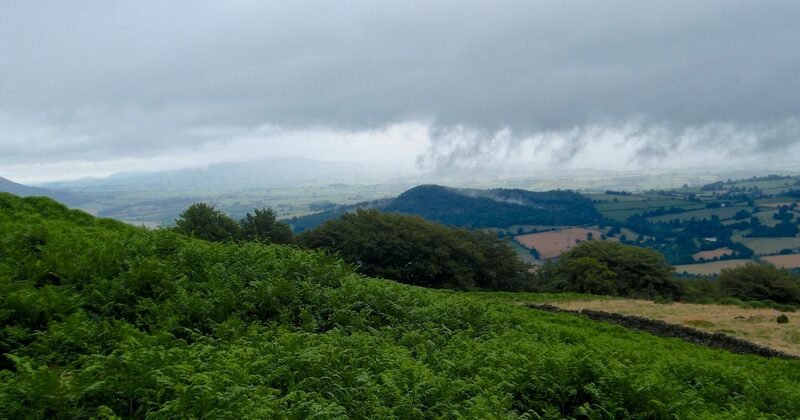 People who wish to hike the CW should have very good map reading and navigation skills and the equipment and skill to deal with prolonged foul weather. Obtaining food and water was never a challenge. 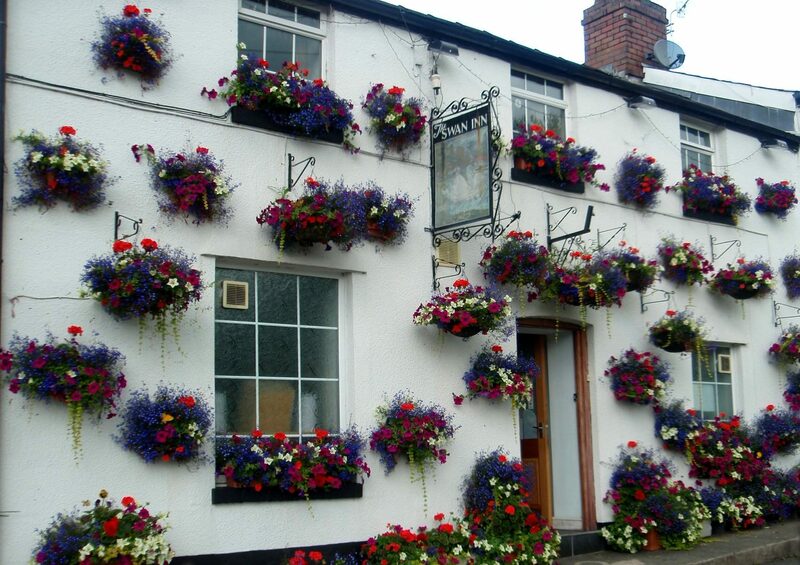 On most days, we were able to get a hot lunch or dinner at a local pub, restaurant or hotel. Meals were generally not memorable, but were at least palatable. We were able to buy picnic supplies every day or two and so never had to carry more than a couple of meals in our packs. Larger towns usually have a Tesco or Carrefour’s, large supermarkets that often had a decent deli counter. Villages usually had a tiny shop where selections were extremely limited. Unlike in continental Europe, shops are usually open all day. When hiking in France, Italy or Spain, hikers can find excellent bakeries in every tiny town; not so in Britain. 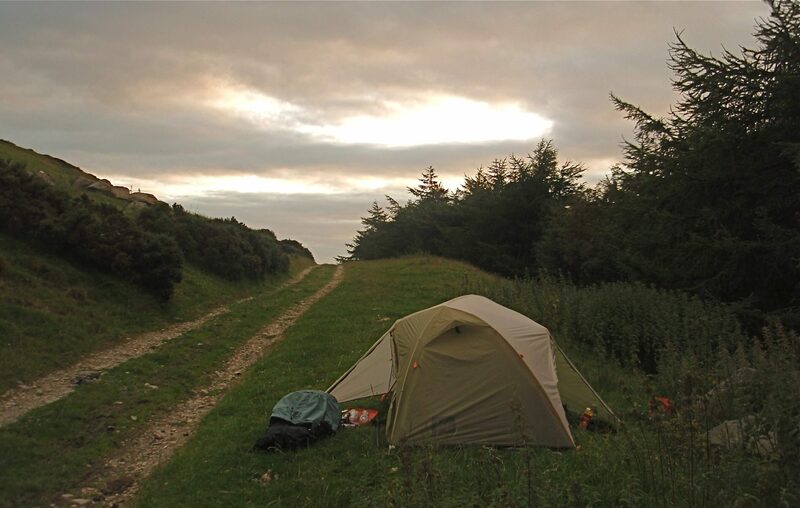 There are few formal campsites along any part of this route. 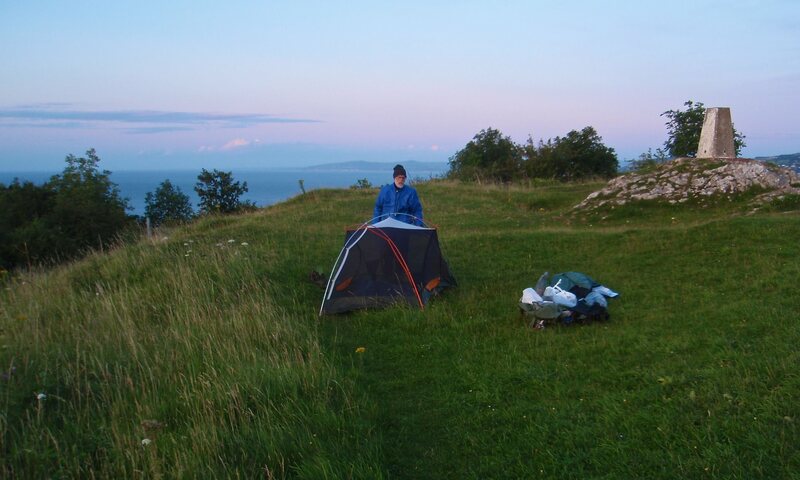 We wild/stealth camped most nights without any issues. 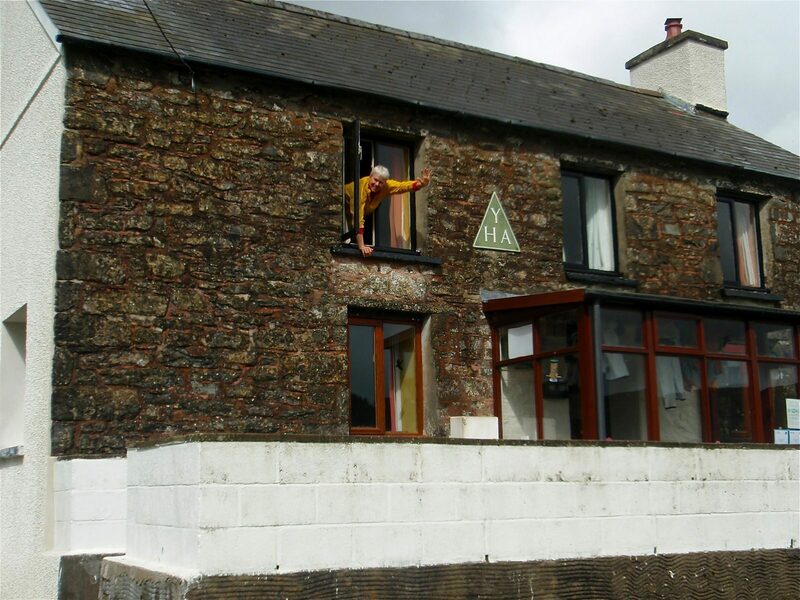 We opportunistically stayed in hostels or B&B’s on seven nights. The guidebooks for the various paths provide information about indoor accommodations, and Tourist Information Centers located in larger towns offer booking services. 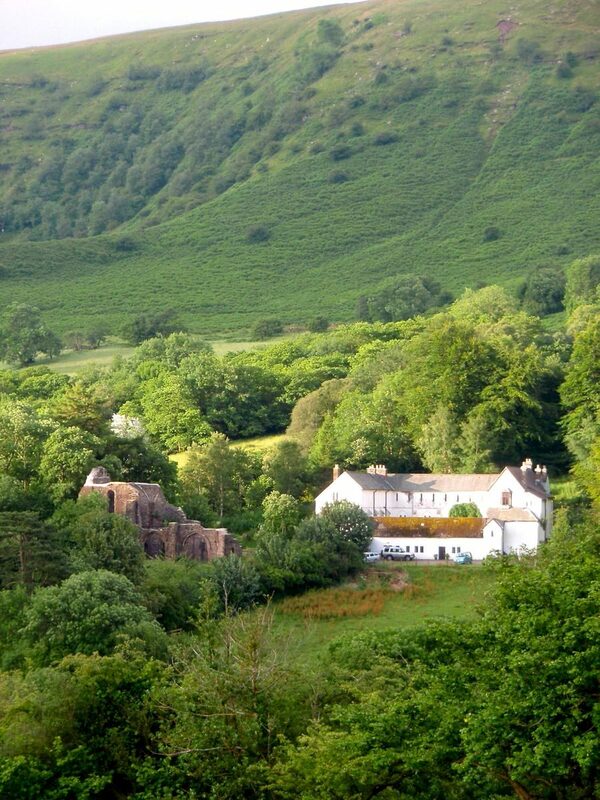 The British countryside and mountains are very attractive, but not grand. 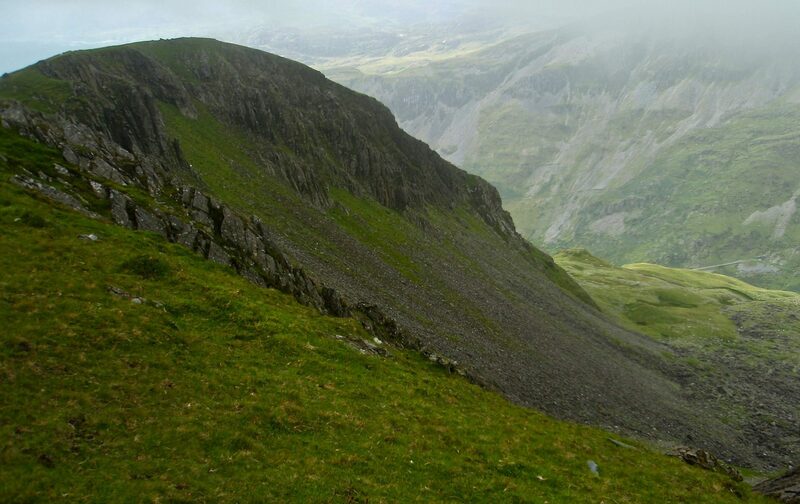 Most of the mountains are rounded lumps with occasional escarpments providing some cliffs here and there. There were few lakes along our route. There is essentially no wilderness to be found as humans have been altering the land for millennia. To us, it appears that people and nature have mostly reached an accommodation that looks nicely cohesive and is very pleasing to the eye. 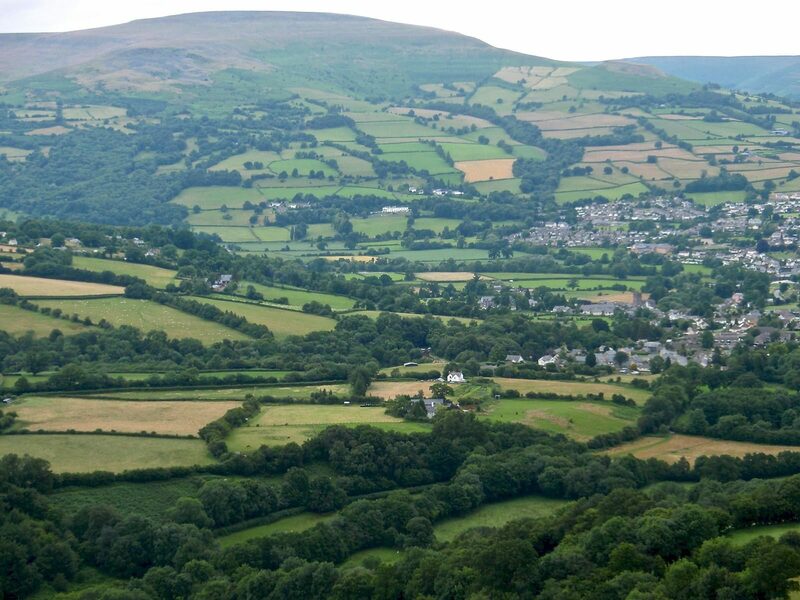 The fields are green and lovely and the small villages well integrated into the landscape. There are lots of old churches to investigate. 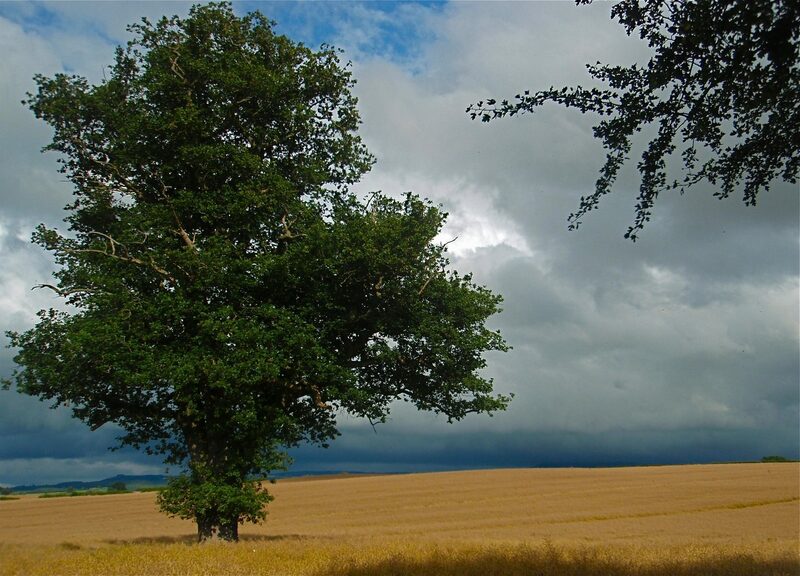 Copses of trees dot the countryside and we saw no signs of industrial forestry. There are many brooks, streams and rivers. 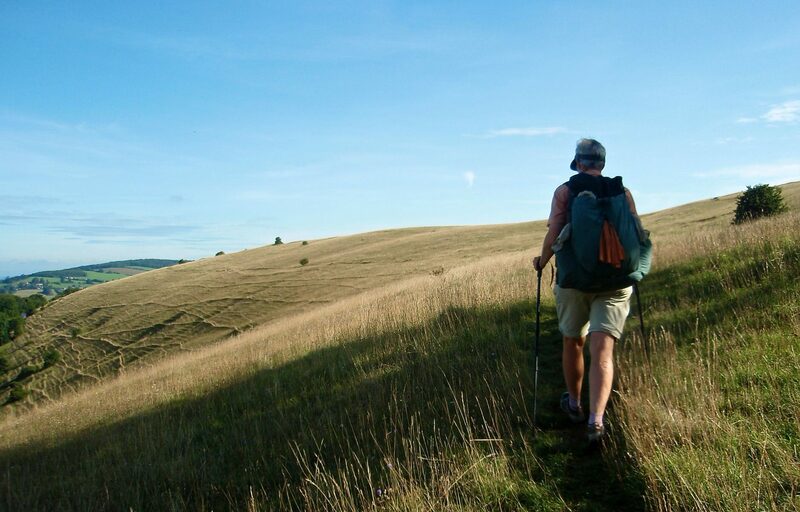 The walking is enjoyable, mostly stress-free and quite rewarding. 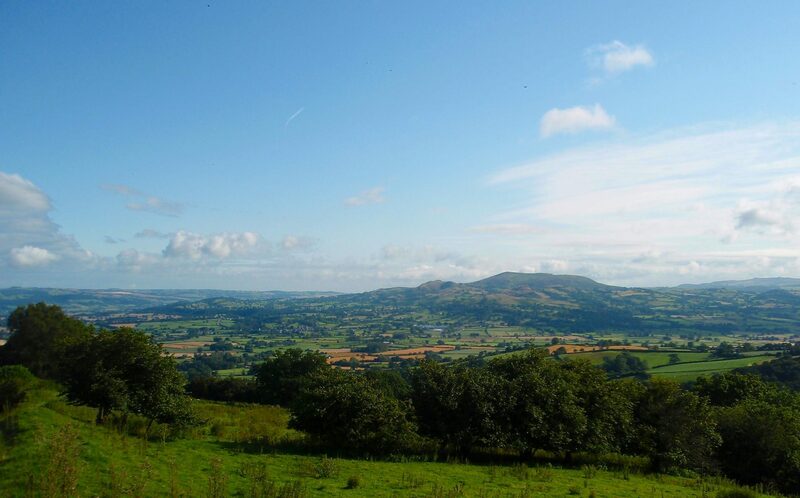 The Met Office summary of July 2009 in Wales: “Overall, a very wet month with over twice the 1971-2000 normal rainfall generally and over three times normal in south Wales.” It was the second wettest July on record, and Wales is a pretty wet place in an average year. 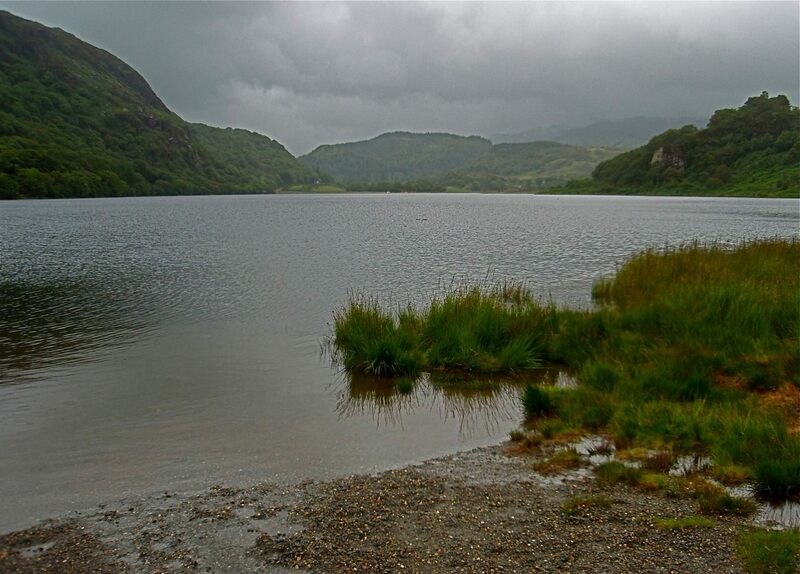 Overall, the rainfall in July 2009 in Wales was 272% of normal. This is when we were on the CW, and we were wind-blown, soggy and saturated for most of that leg. 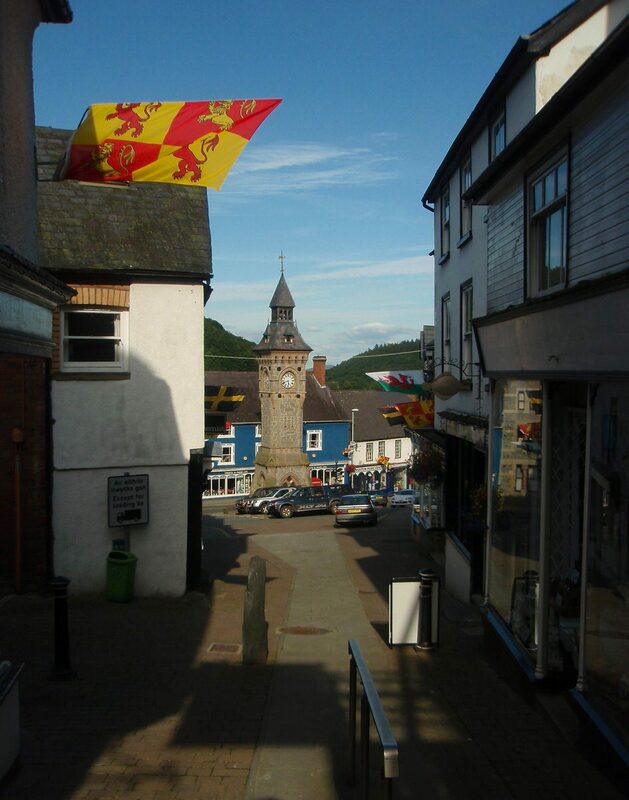 Our completion of the CW on July 30 coincided with a major improvement in the weather in Wales. 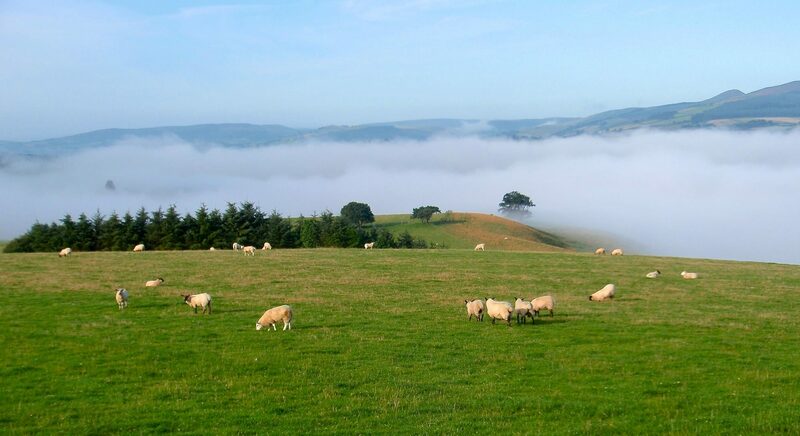 Additionally, the western Welsh mountains, through which much of the CW is routed, tend to wring most of the moisture out of the clouds coming in from the sea. The eastern portion of the country is on average significantly dryer. After being so soggy for the first two weeks, we were delighted that for the remainder of the trip we had only 2 days with brief light showers. While on the CW, we had a couple of ferocious storms with high winds and heavy rain. 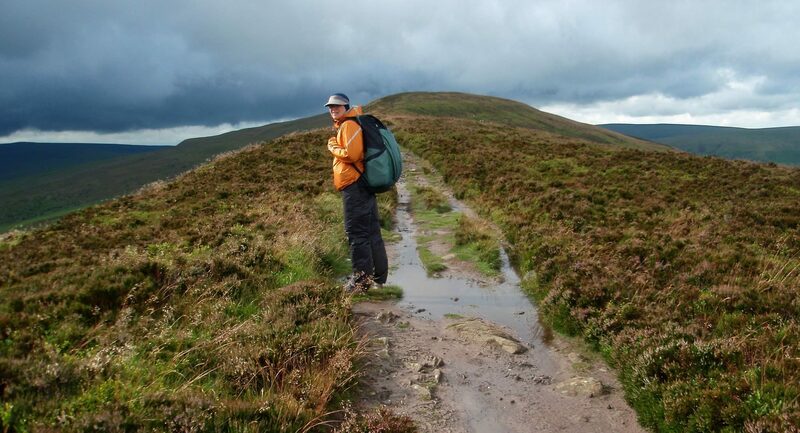 This weather is no joke and every year unprepared people are killed in the Welsh mountains. A saving grace is that maximum elevation is 3560 feet, and it is usually possible to quickly descend to lower elevations if things get too rough. During the spring through autumn walking season, except at high elevations, temperatures rarely drop below freezing and rarely get hot. Cool, pleasant temperatures provide nice walking conditions. Anytime between April and October would be fine for this walk. Days get too short in the winter in these northern latitudes and the mountains receive significant amounts of snow. We met many other people out on the trails. 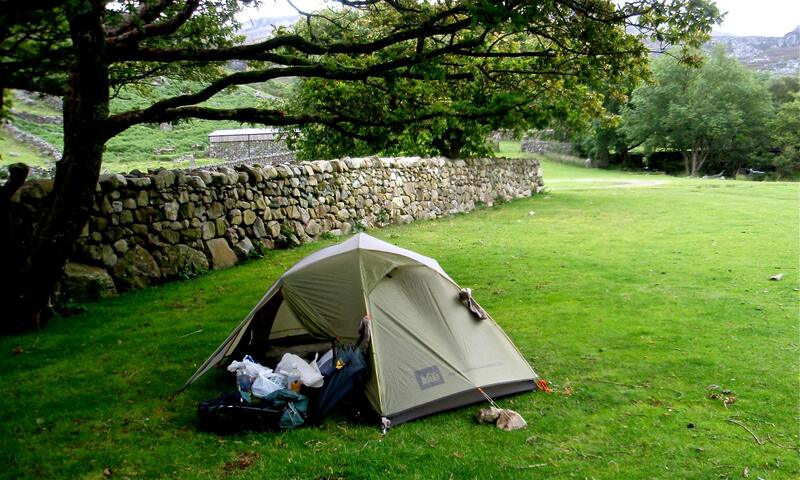 Most were on day hikes or on overnights using commercial lodging. We met several groups of thru-hikers on the ODP but nobody else thru-hiking the CW. We did not make an effort to learn to pronounce Welsh words and so the place names were incomprehensible to us: Cwmystwth for instance. Trying to properly pronounce Welsh words was futile, and asking directions was often frustrating for both parties involved. Fortunately, many signs in the border areas were bi-lingual, and that helped a lot. 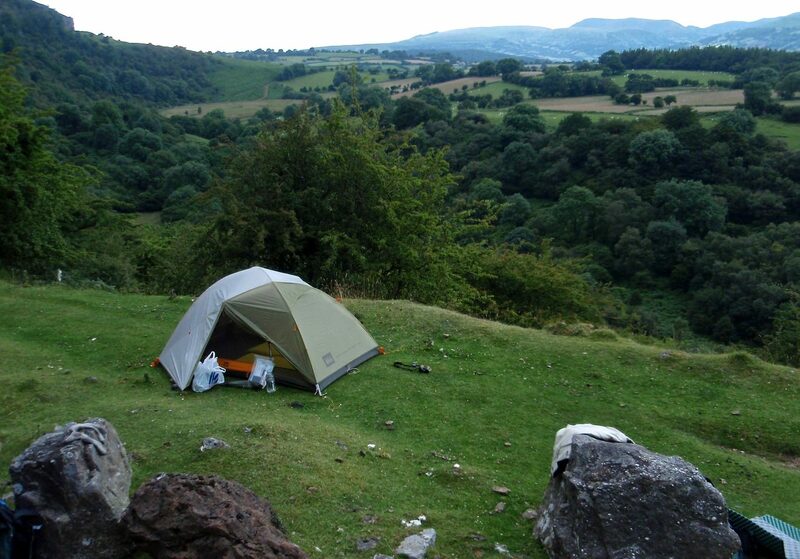 Insects were only a problem on one night, near Crickhowell, when we had a significant midge attack. We observed 93 species of birds, but no new life birds. As in other trips to Britain, birds are relatively abundant and not shy, so observing them is easy and gratifying.